In the early 1990's, the "next big thing" in theme and amusement park technology was the advent of the motion simulator ride. 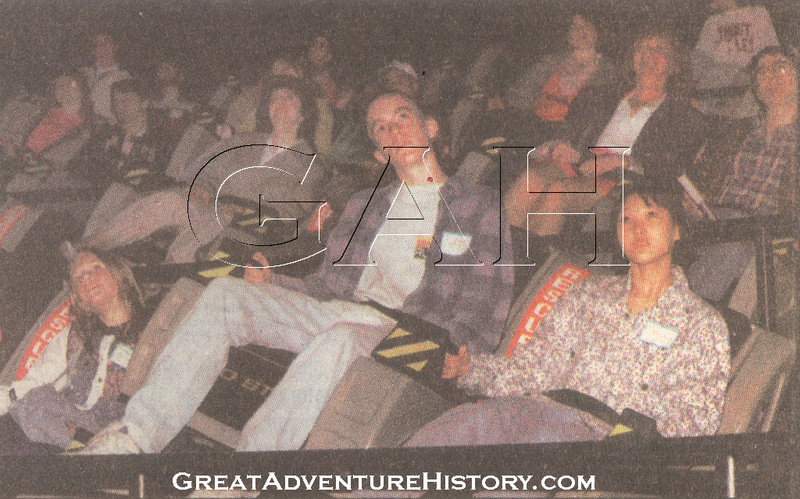 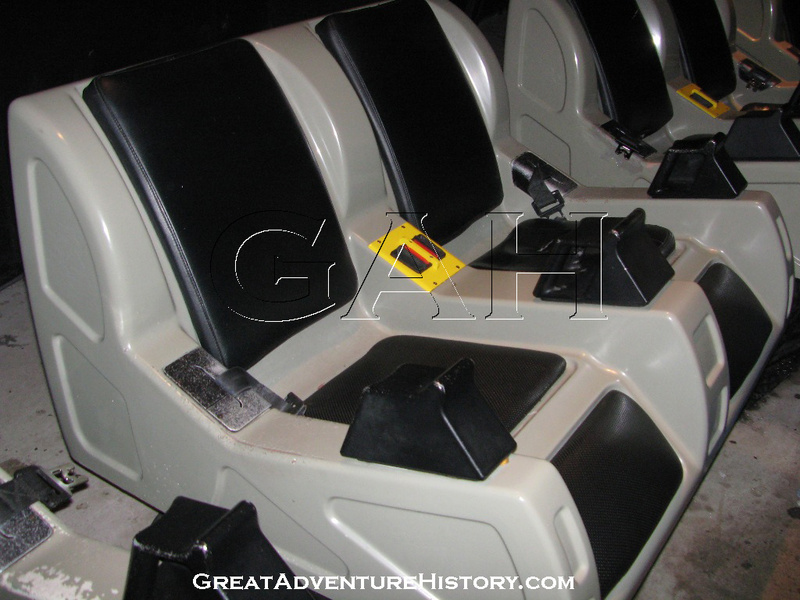 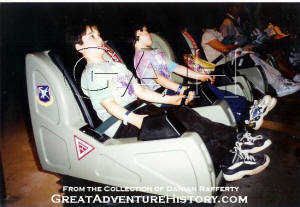 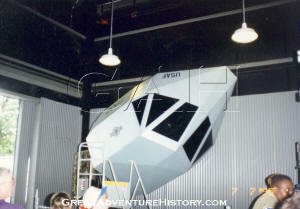 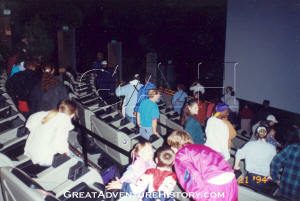 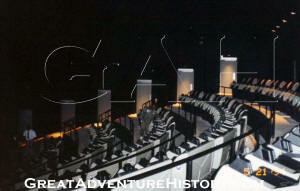 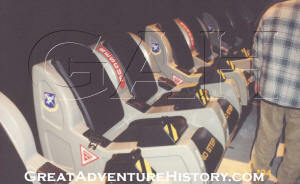 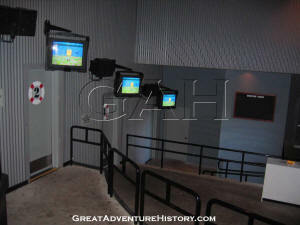 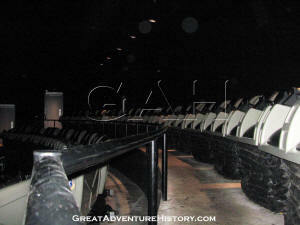 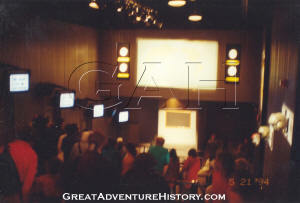 After Disney introduced Star Tours in late 1987, rumors began that Great Adventure would be receiving a simulator. 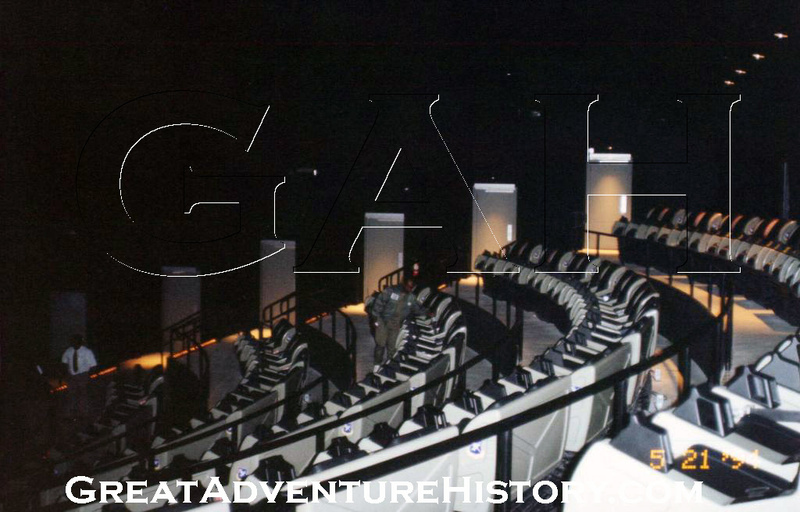 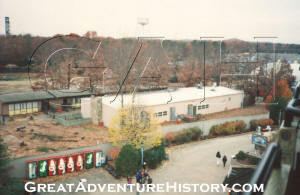 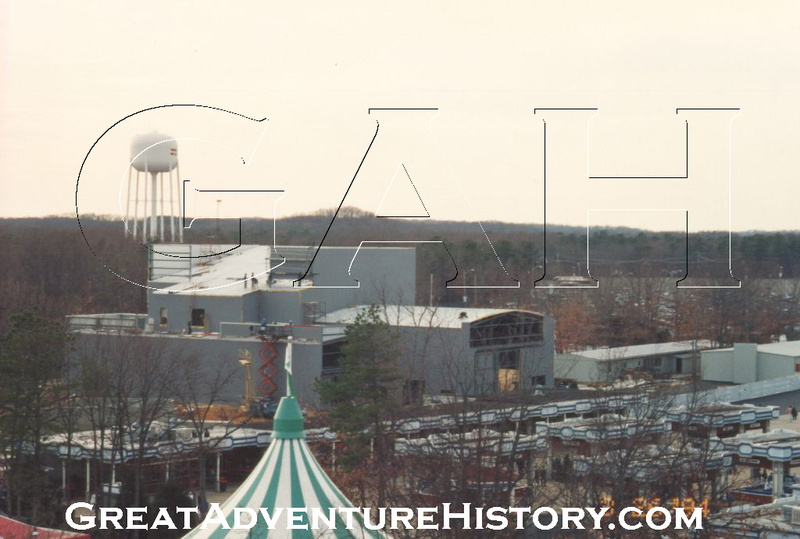 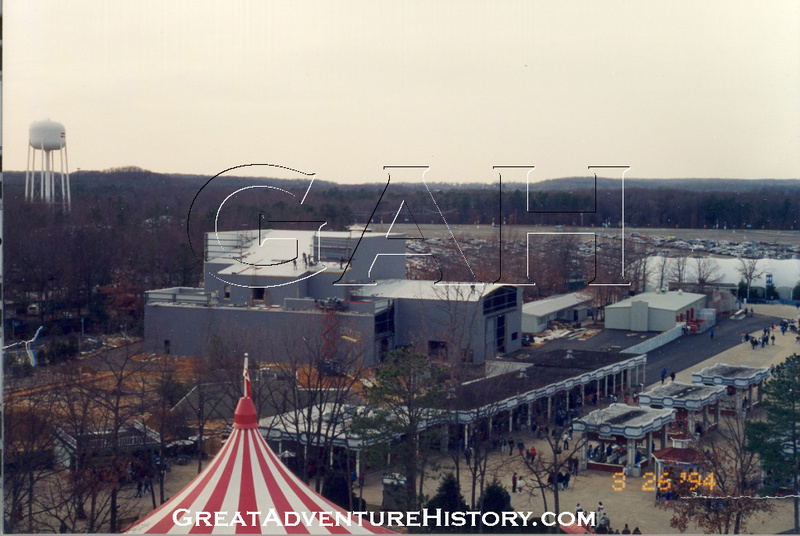 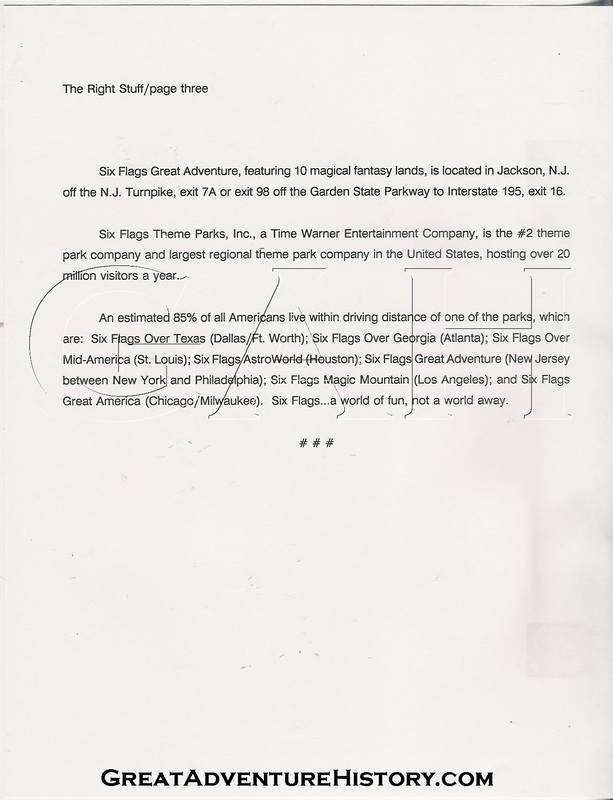 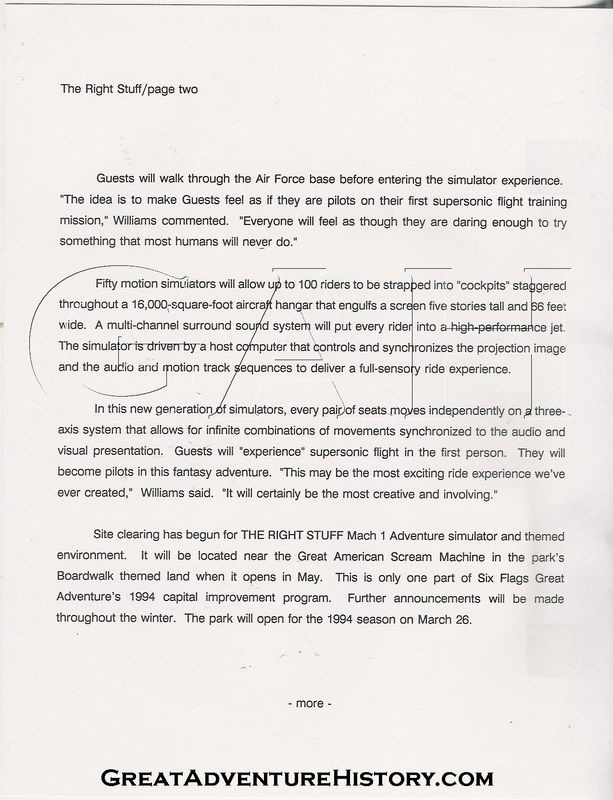 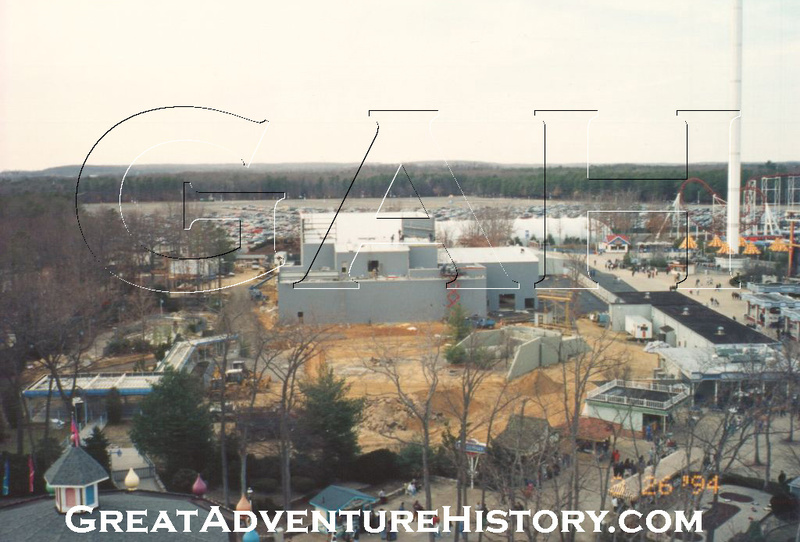 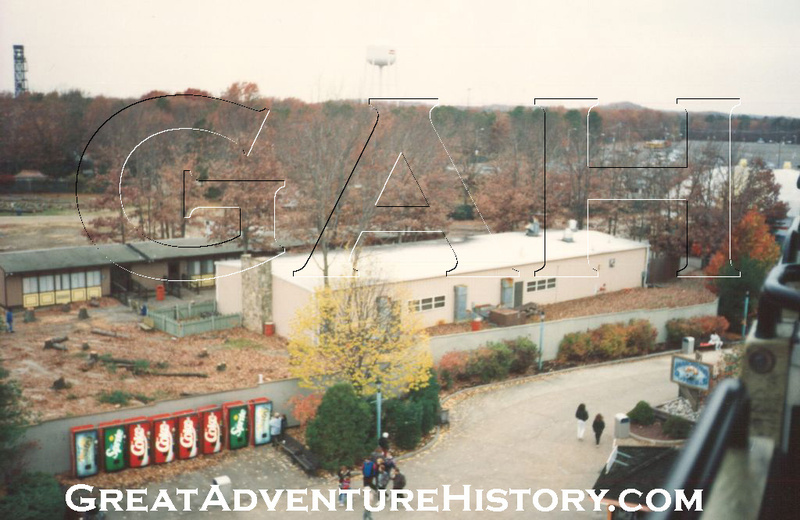 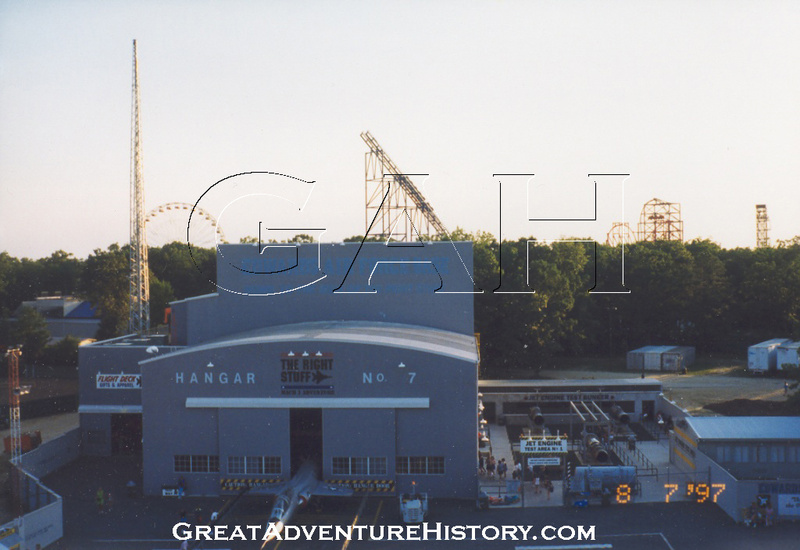 In an August 1, 1988 Time Magazine article entitled "Into the Wild Blue (Digital) Yonder" it was noted that "By 1990, Texas-based Six Flags plans to install a Dynamic Motion Theater at its Great Adventure theme park in New Jersey. 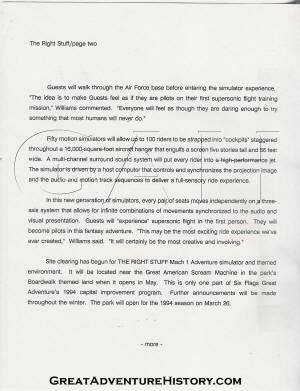 It will feature a series of changing attractions that may include airplane dog-fights and car chases". 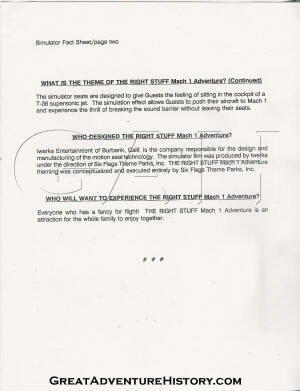 Parks everywhere jumped on the same bandwagon, and companies like Iwerks entertainment rushed to fill their needs. 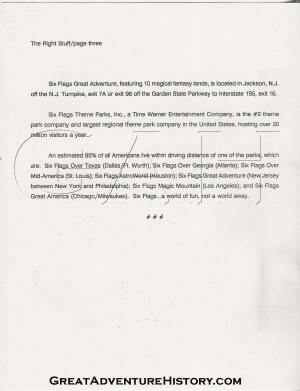 Many parks across the country and around the world installed variations of these rides, and Six Flags (then owned by Time Warner) saw a great opportunity to add attractions to parks that would help promote their movies. 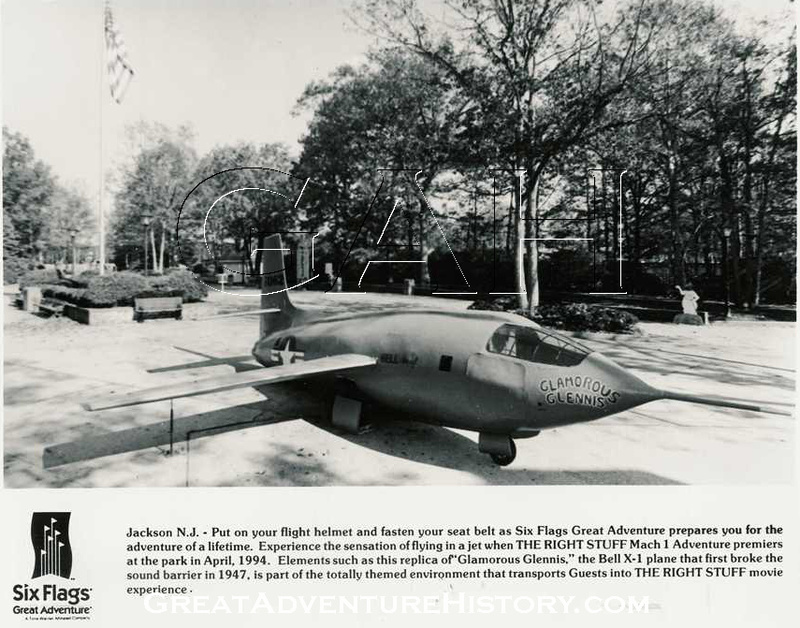 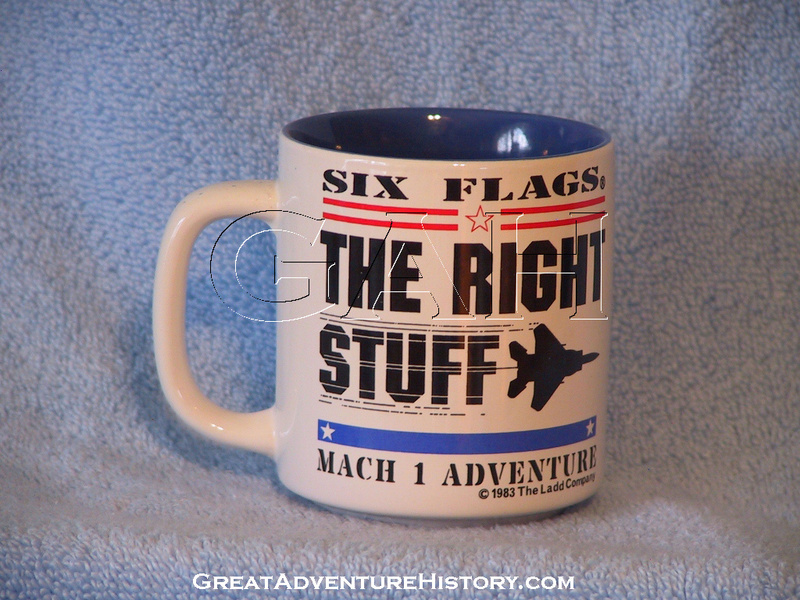 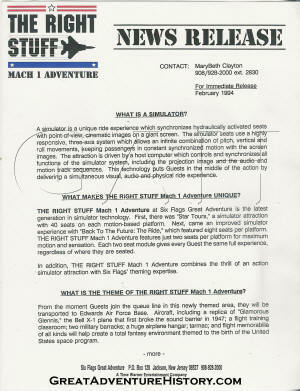 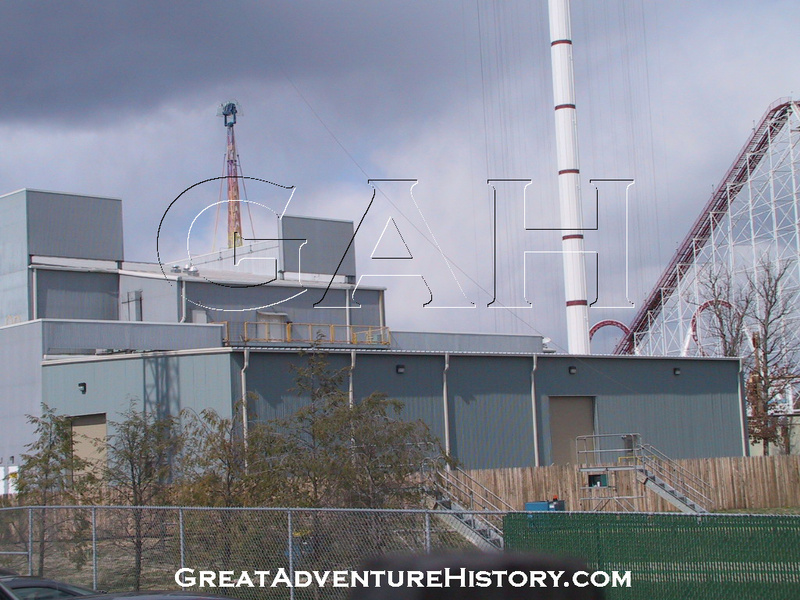 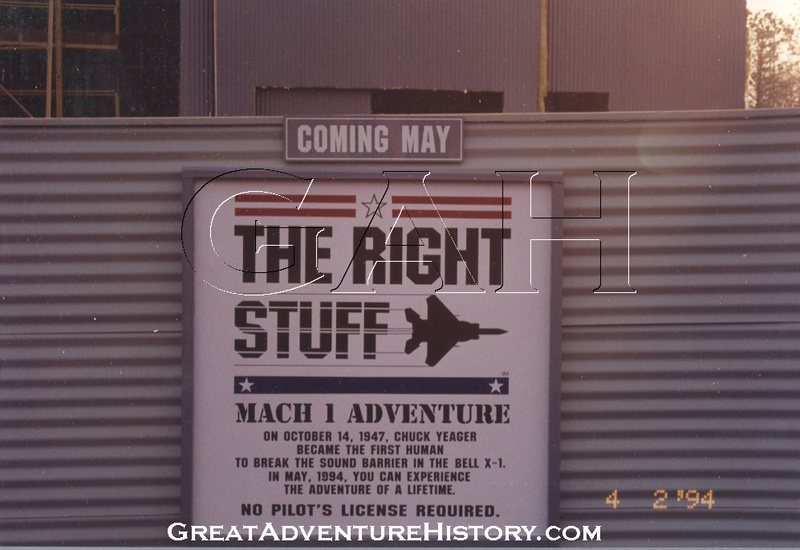 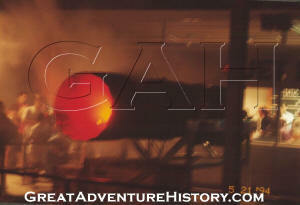 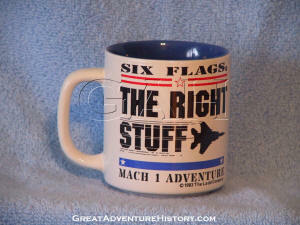 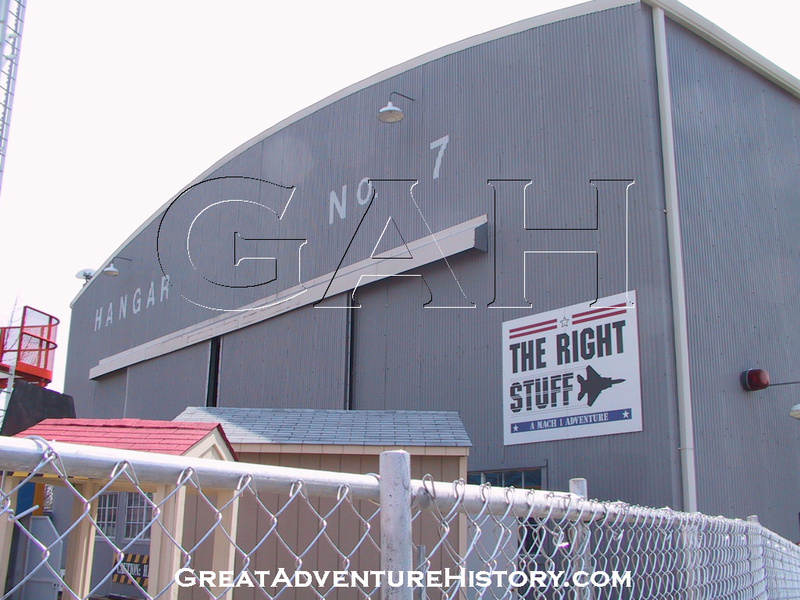 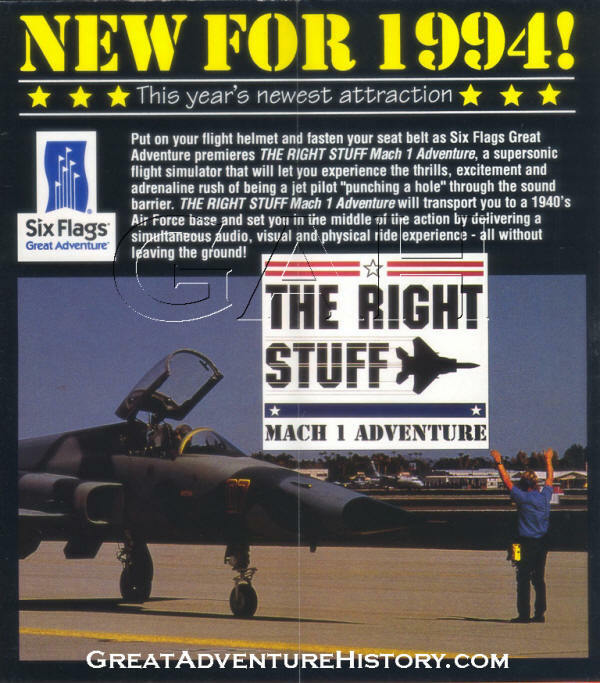 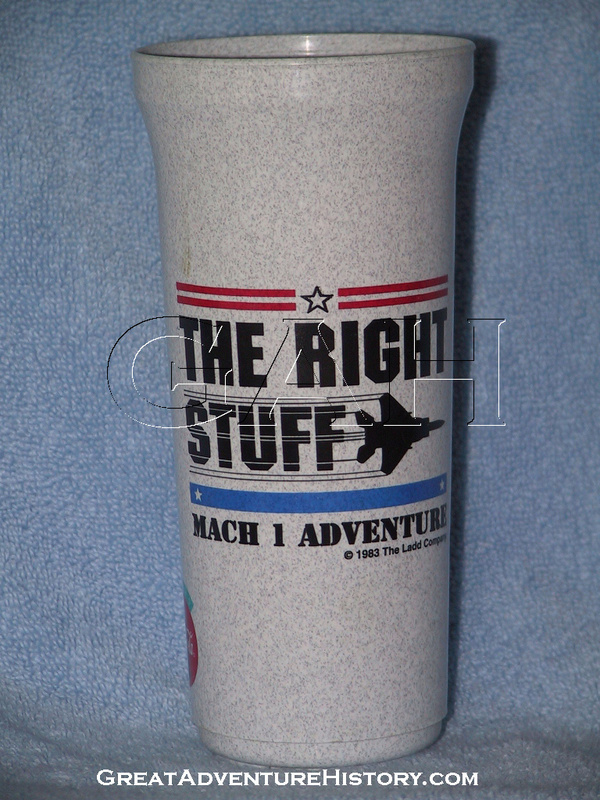 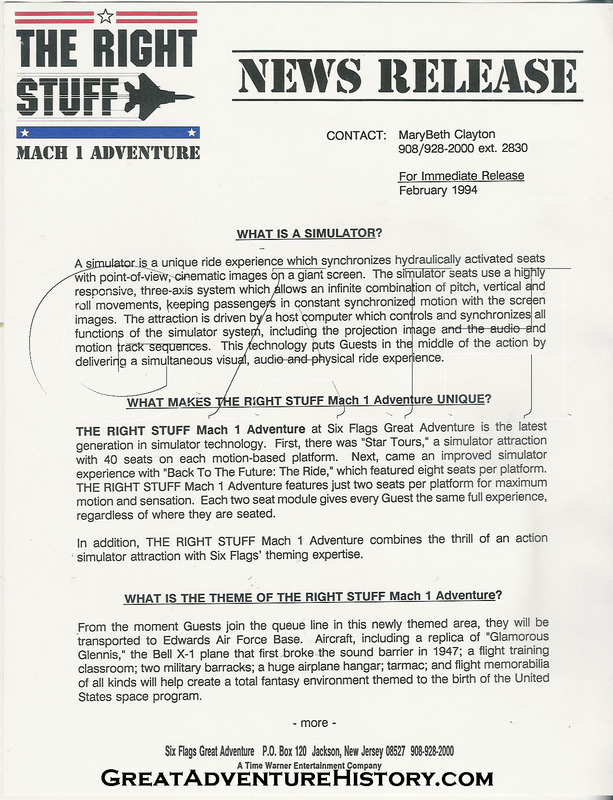 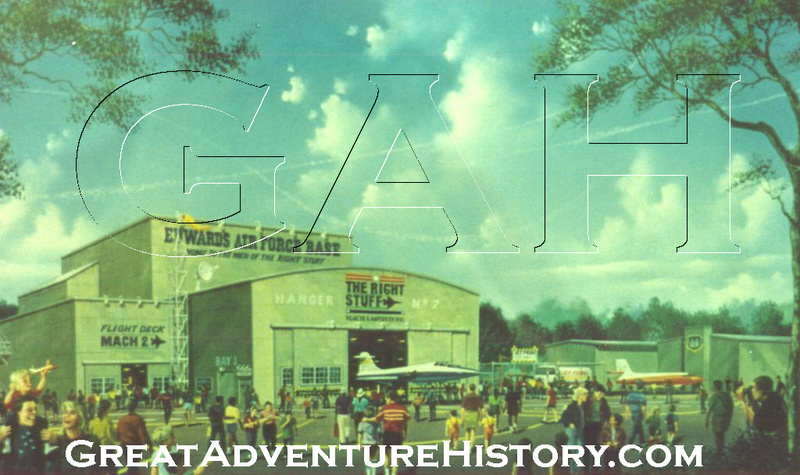 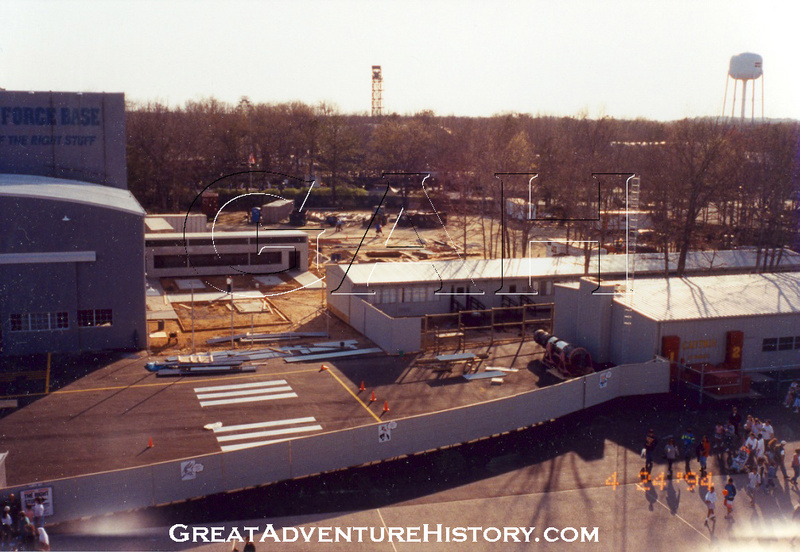 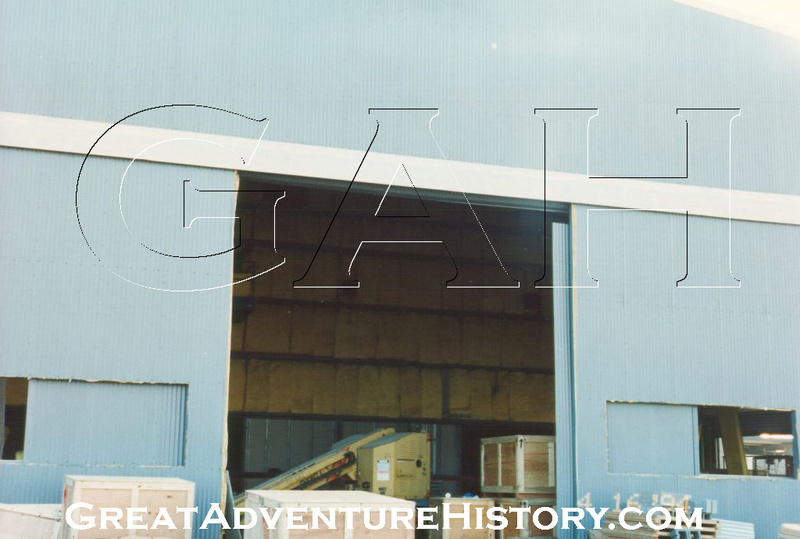 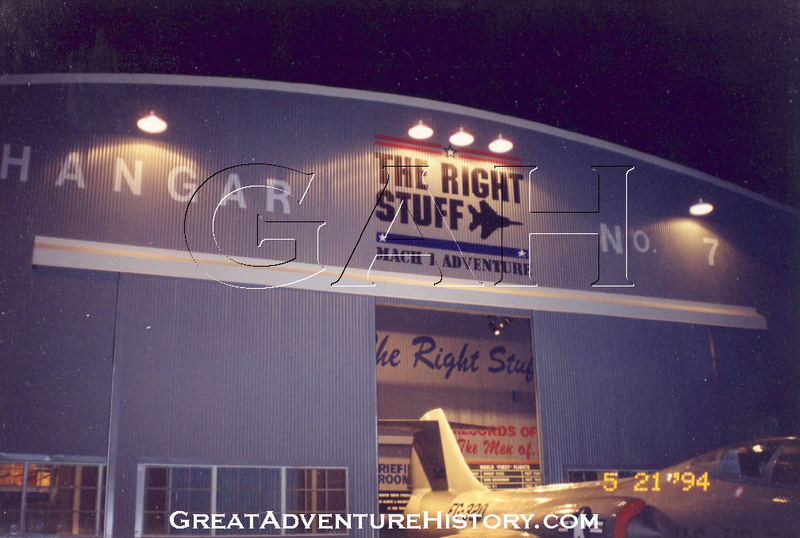 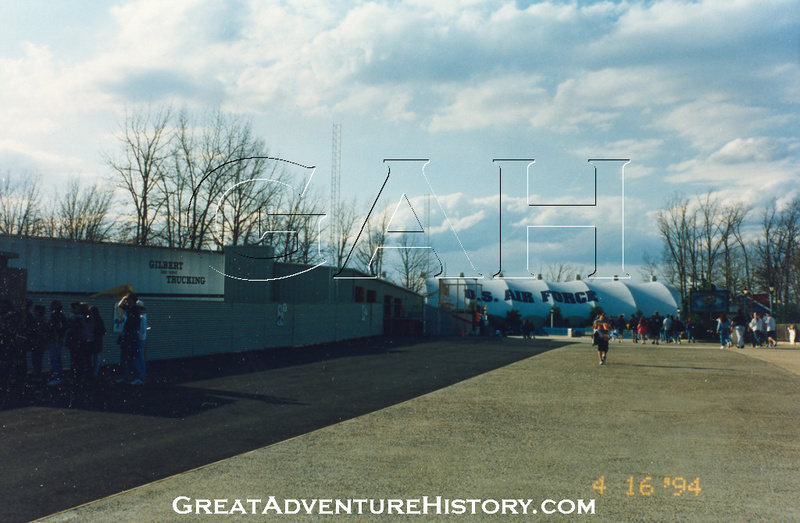 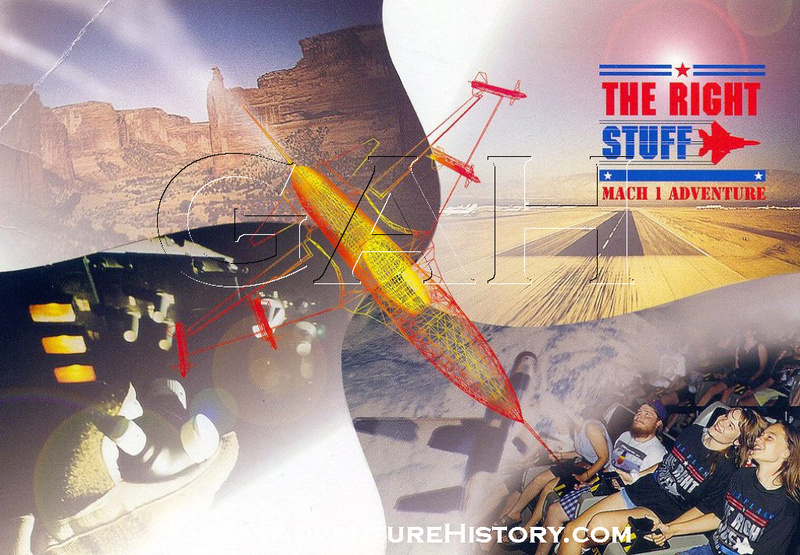 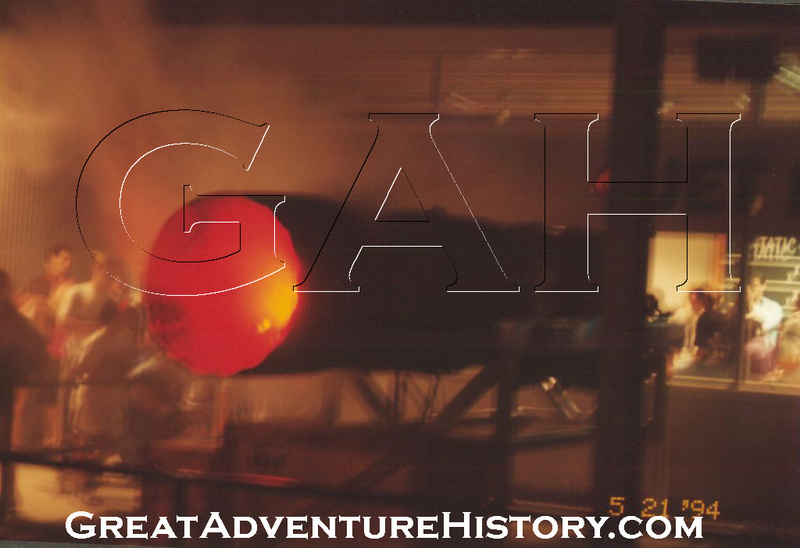 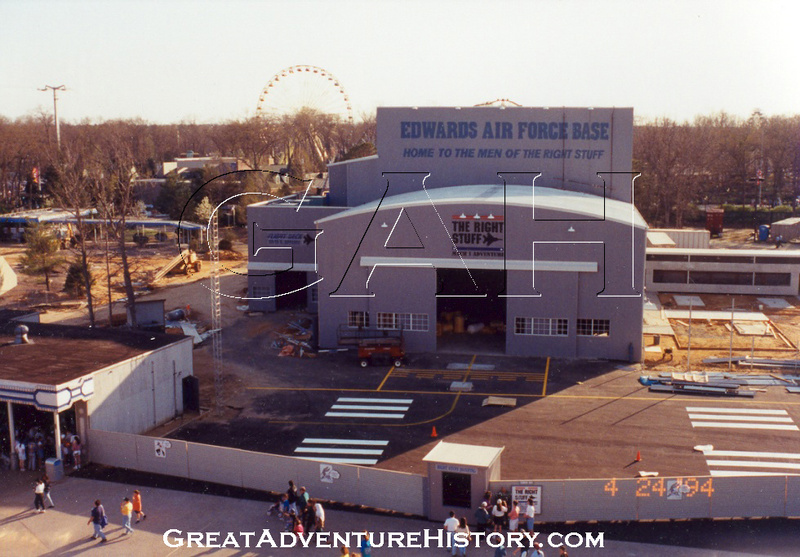 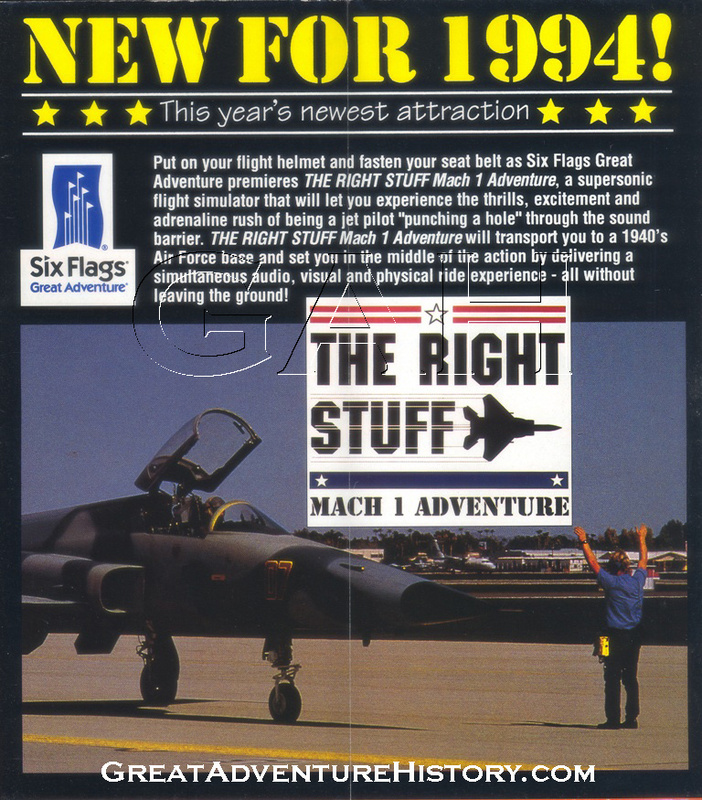 The Right Stuff was added to several parks around the country, and the Right Stuff Mach 1 Adventure film was created specifically for Six Flags. 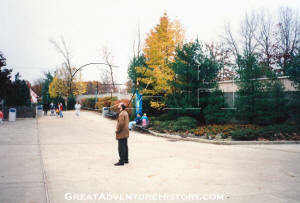 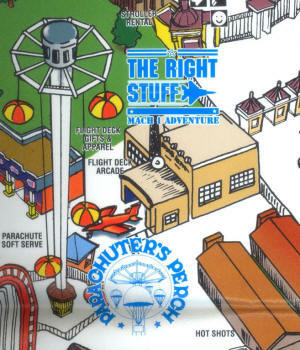 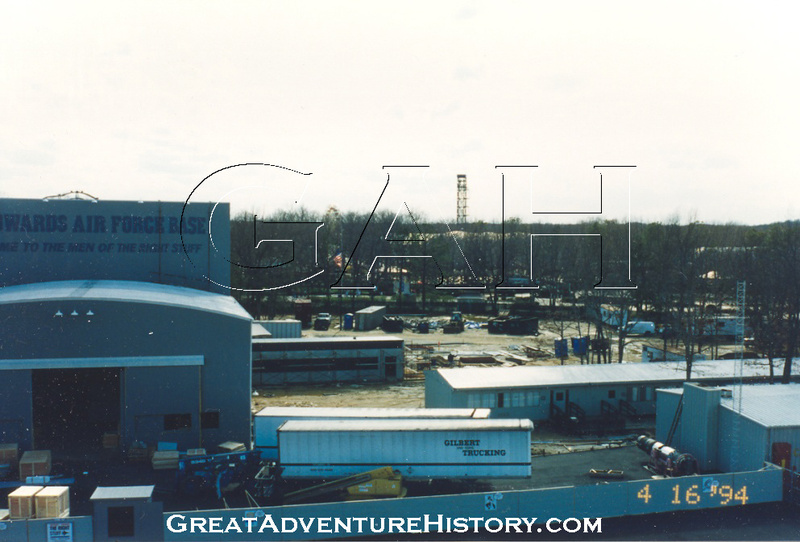 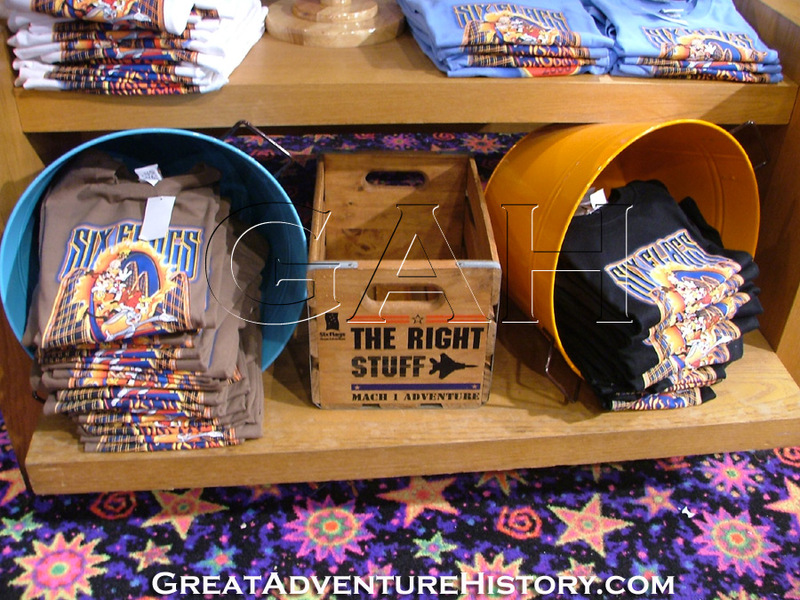 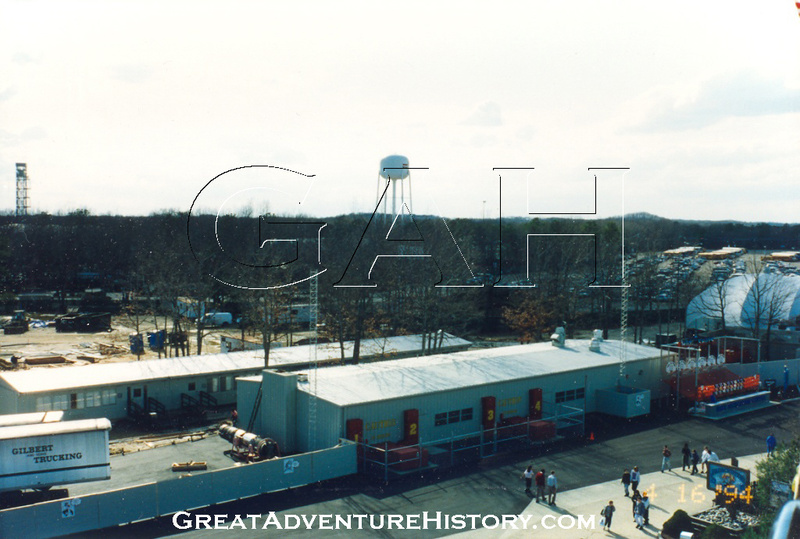 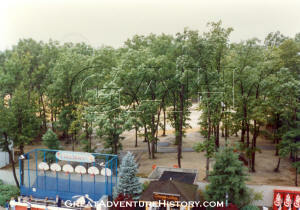 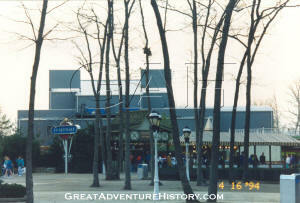 The site for the Right Stuff was a small stand of trees at the back edge of the former Garden of Marvels area at the top end of the Boardwalk games area. 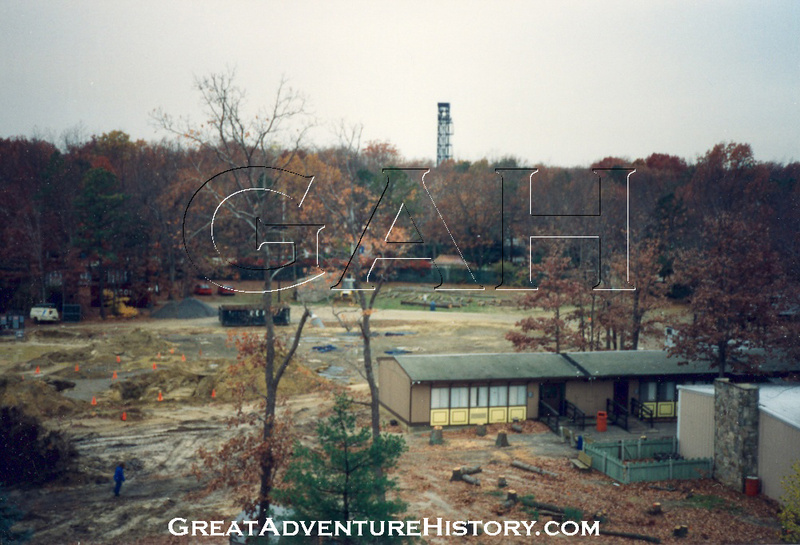 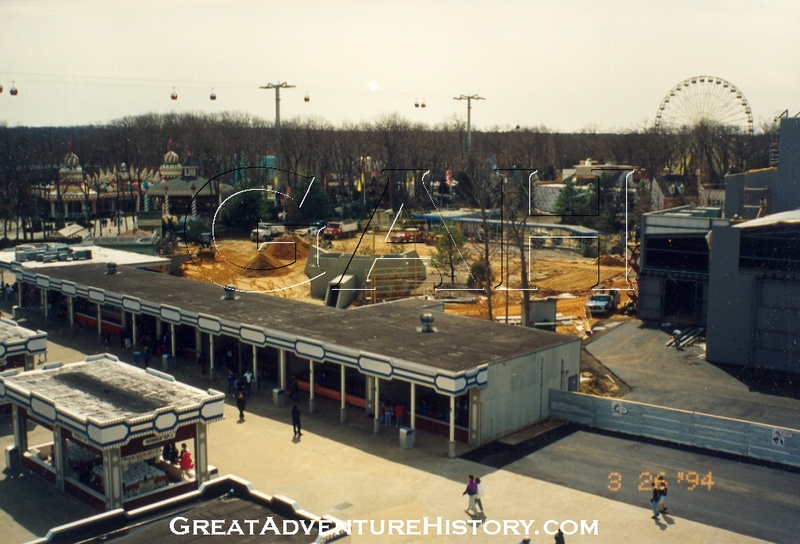 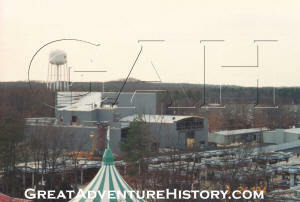 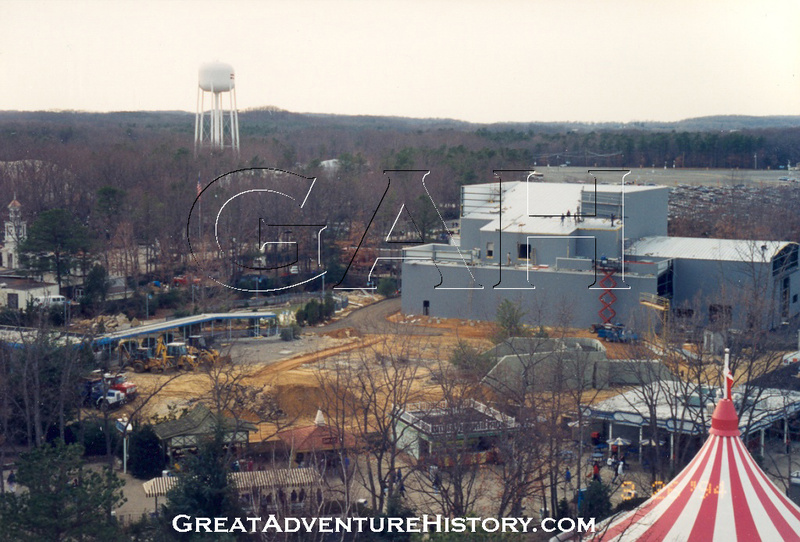 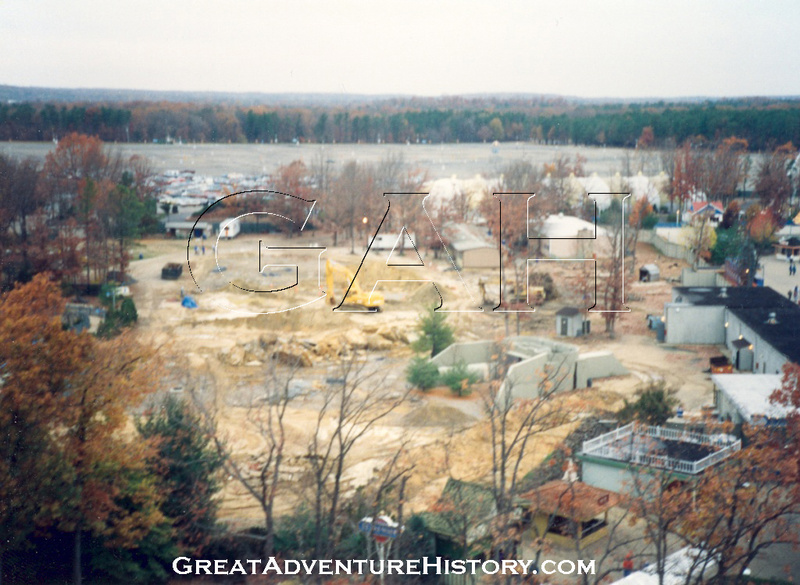 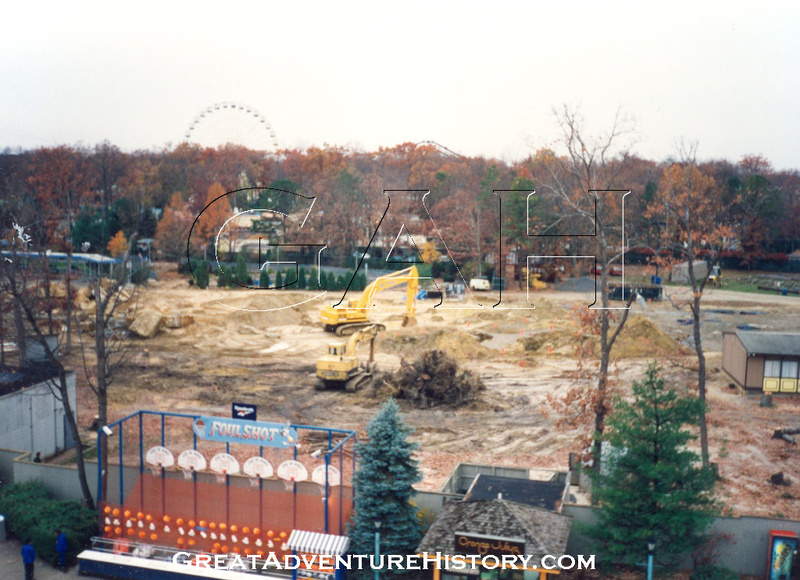 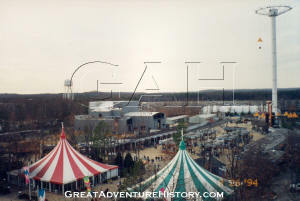 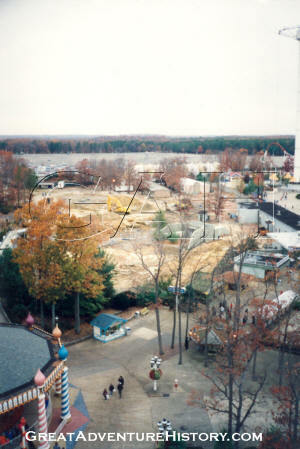 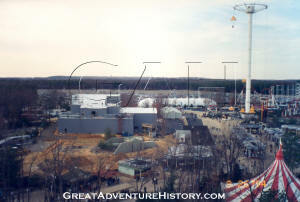 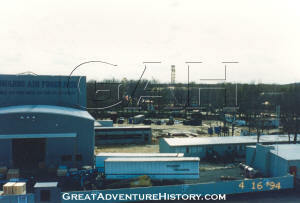 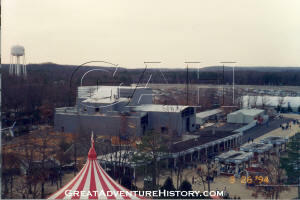 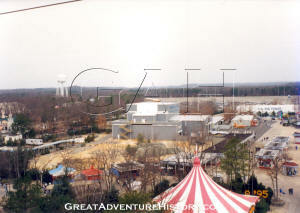 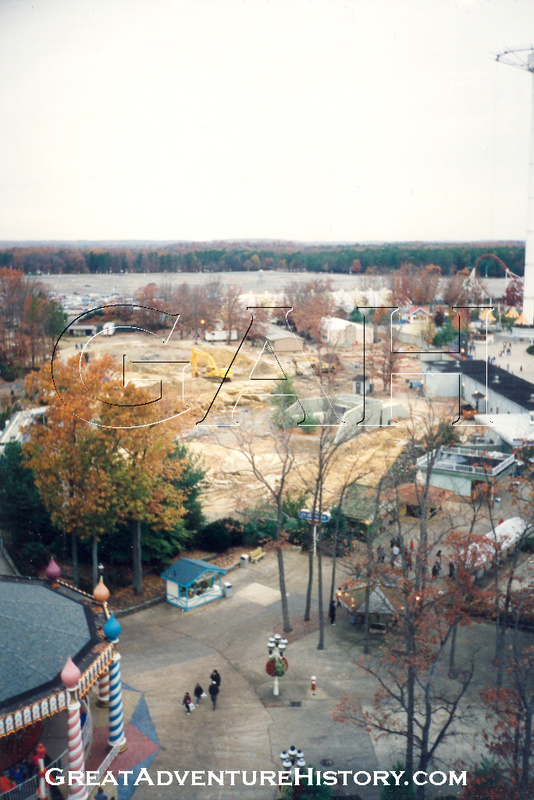 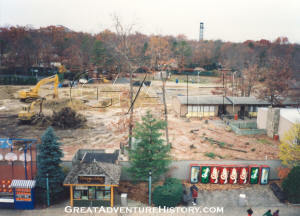 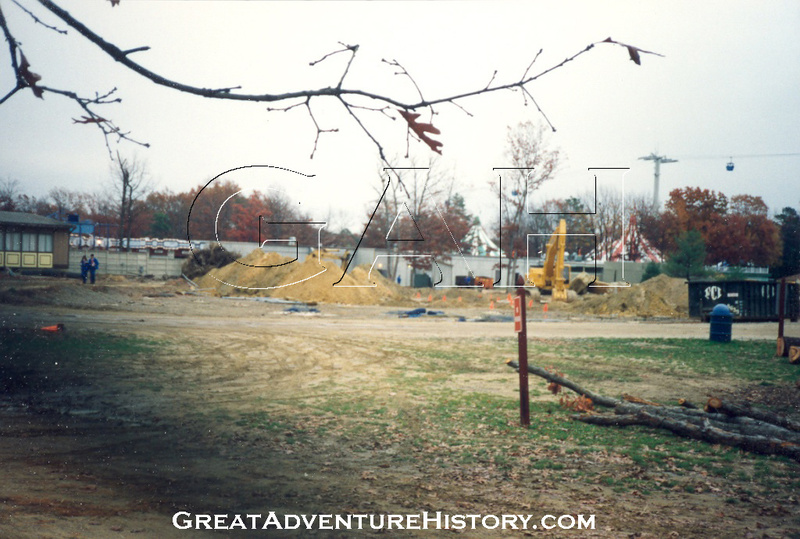 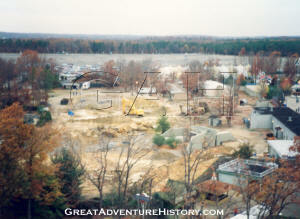 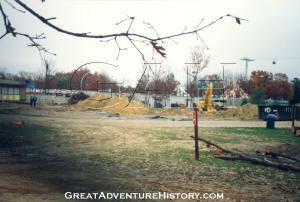 A portion of the land was sitting vacant after the removal of the Shockwave roller coaster, and another portion of the land was part of the "balloon field" where the park's hot air balloons were inflated and moored. 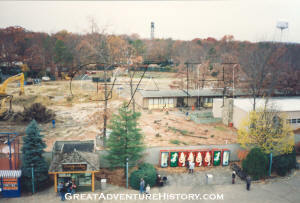 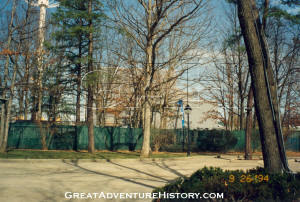 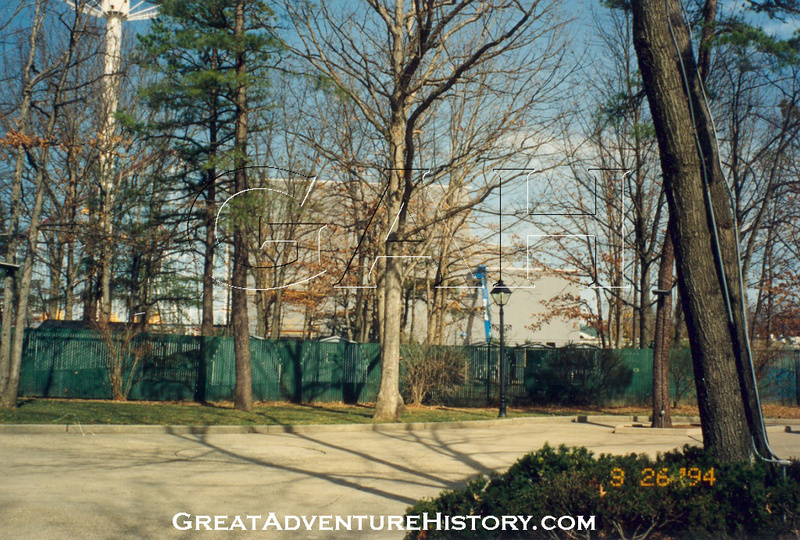 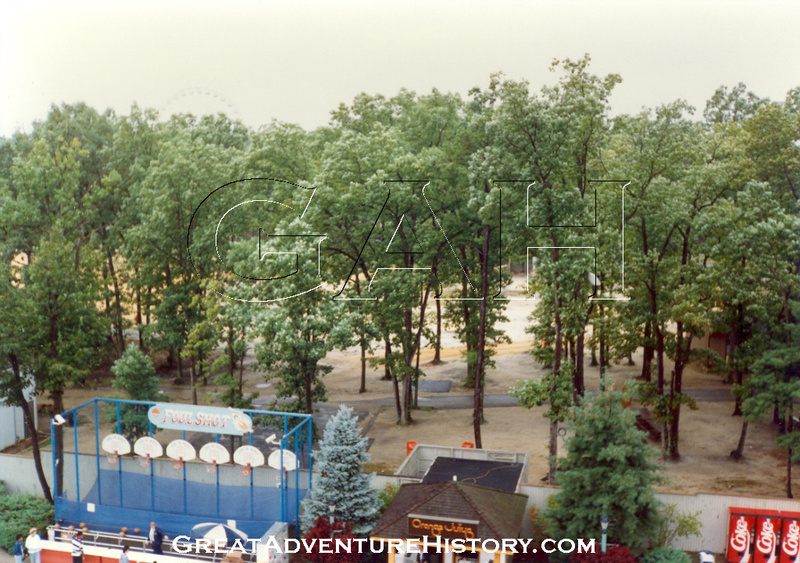 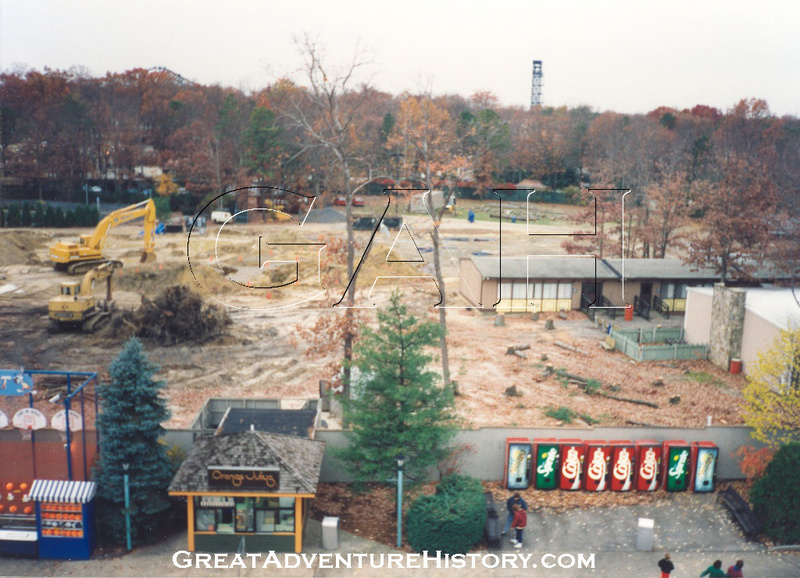 The trees were cleared from the site in the fall of 1993 in preparation for the construction. A small Orange Julius stand was removed along with a basketball game which was relocated. The clearing went right up to the Employee Dining building and the training rooms in the adjacent buildings. 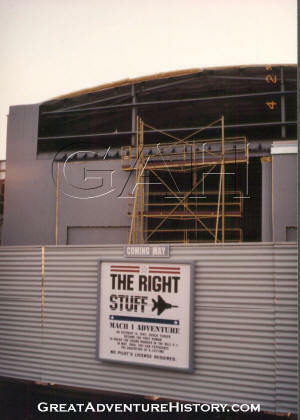 These buildings would be incorporated into the theme elements of The Right Stuff area and queue. 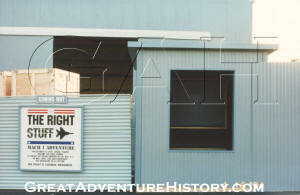 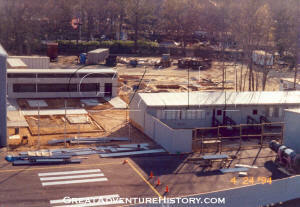 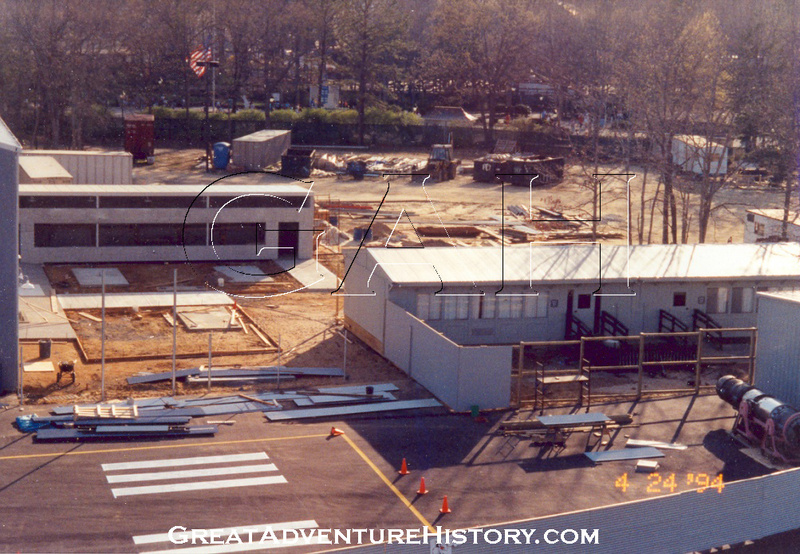 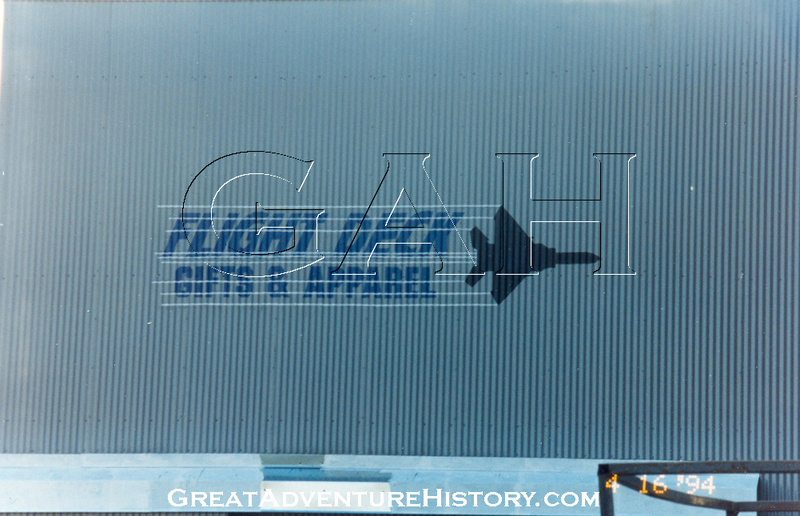 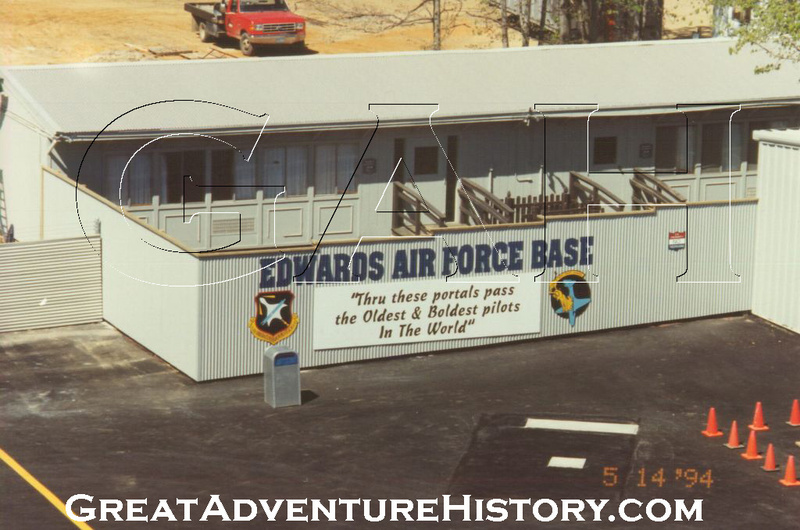 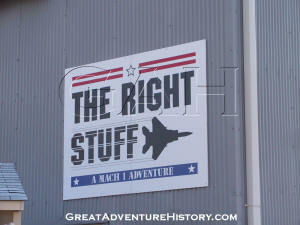 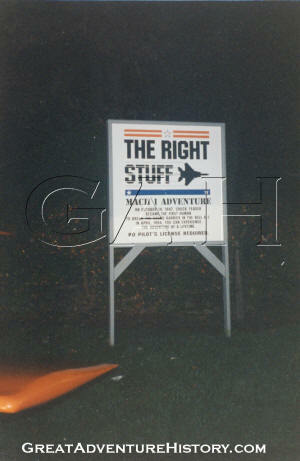 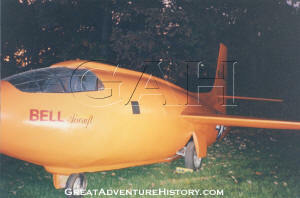 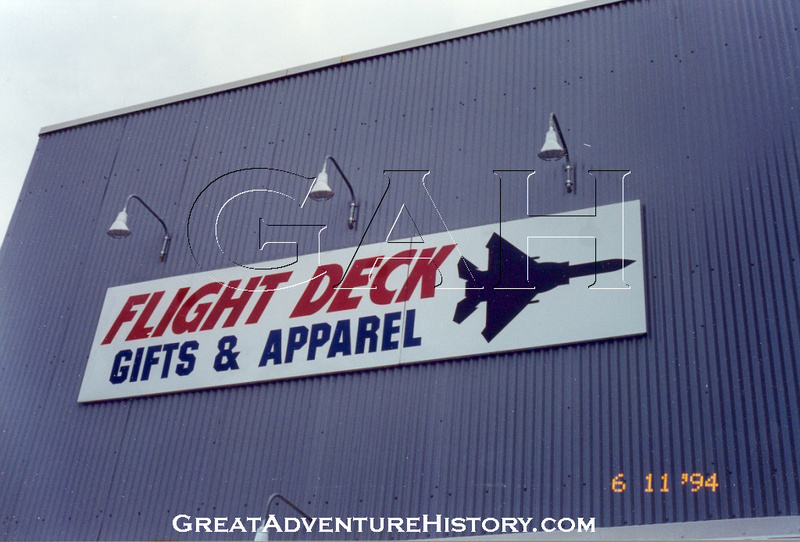 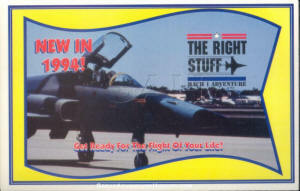 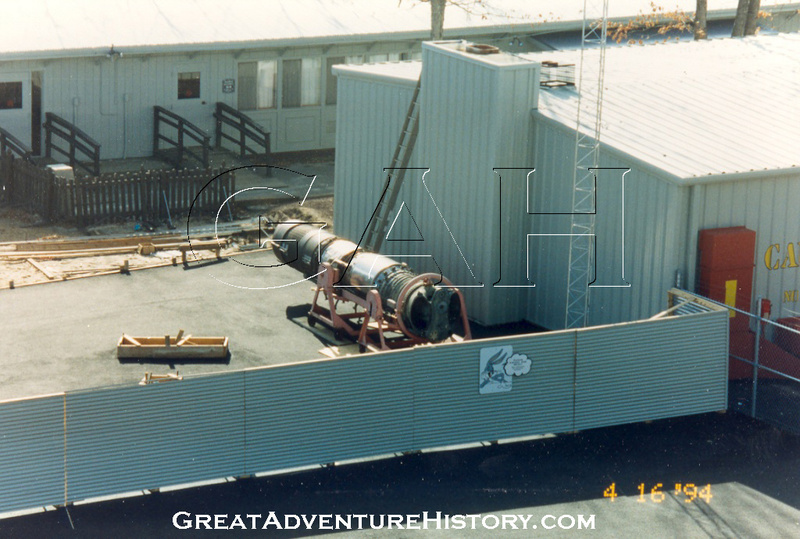 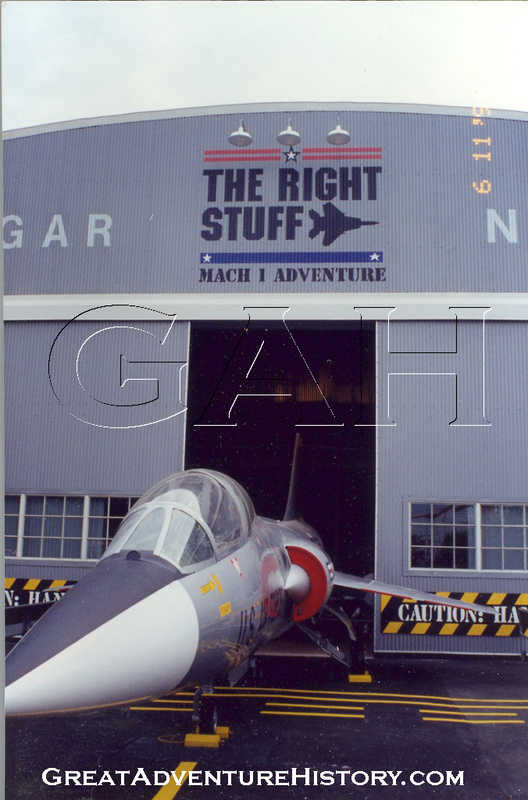 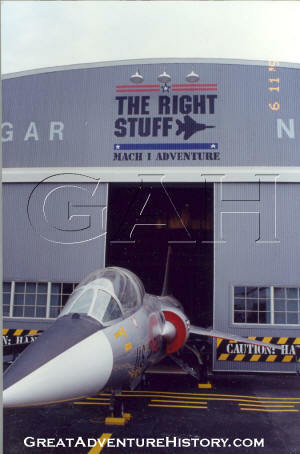 Promoting of The Right Stuff Mach 1 Adventure began in fall of 1993 with the addition of a display at the Front Gate. 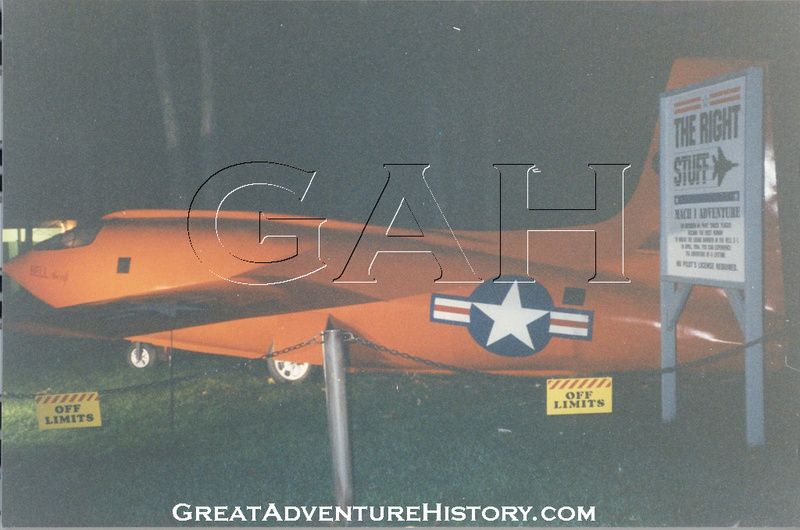 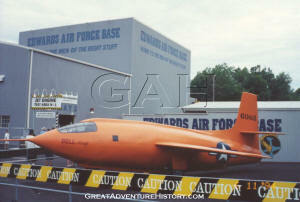 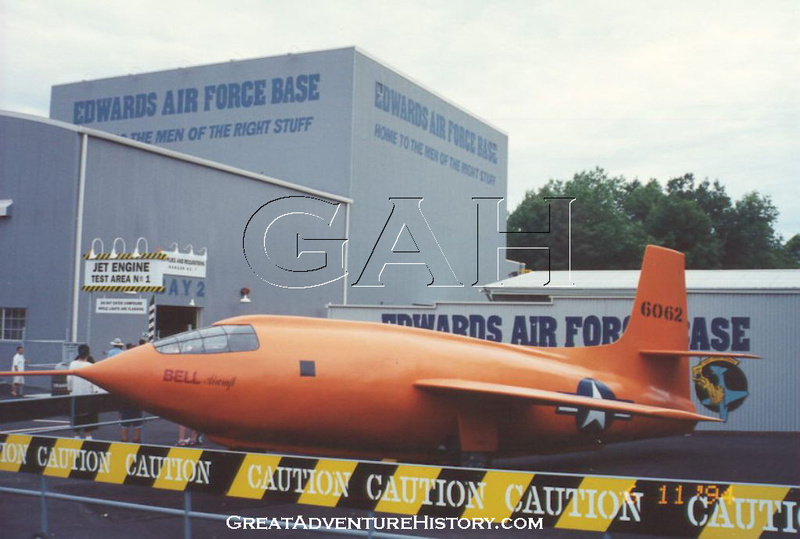 The display featured a replica of the Bell X-1 test aircraft, Glamorous Glennis which was the first aircraft to break the sound barrier (mach 1) along with a sign promoting the new attraction. 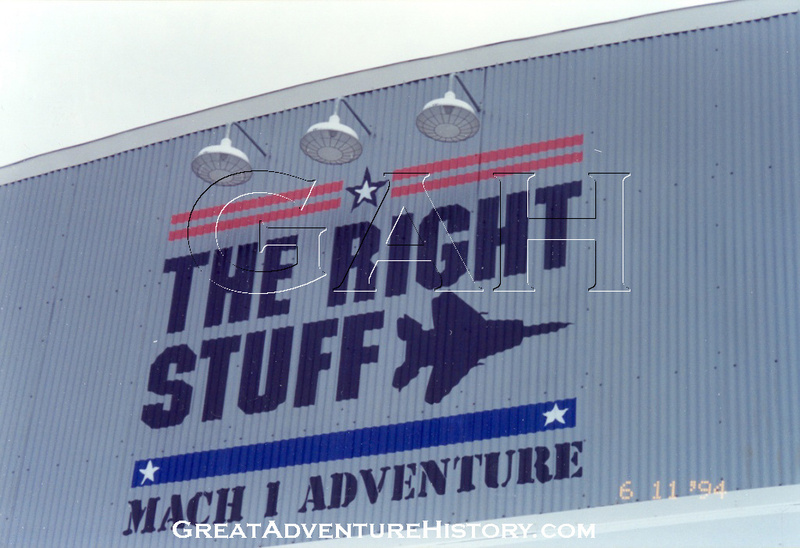 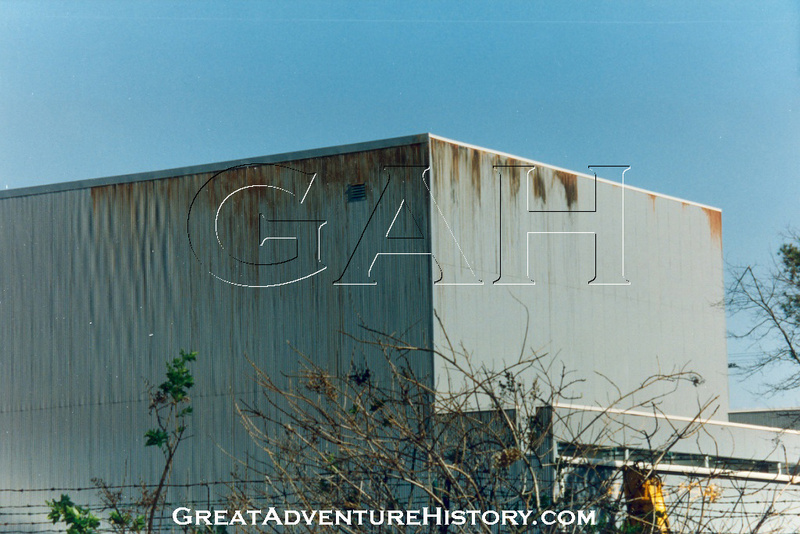 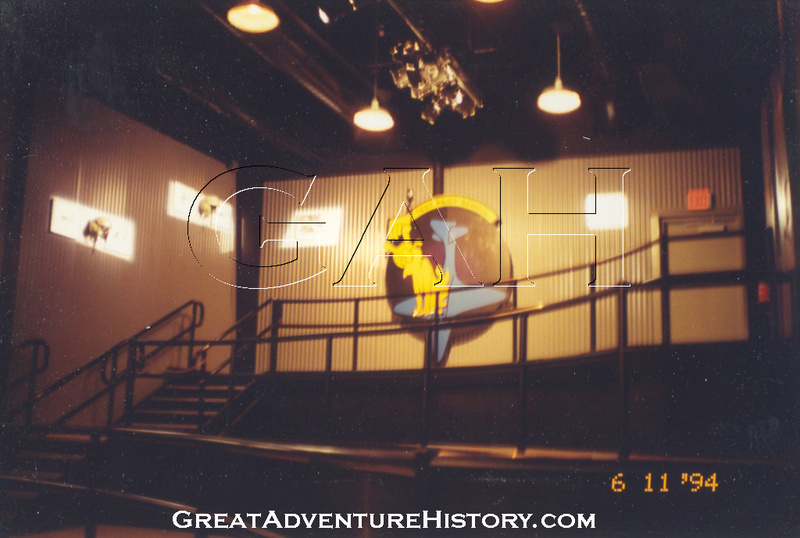 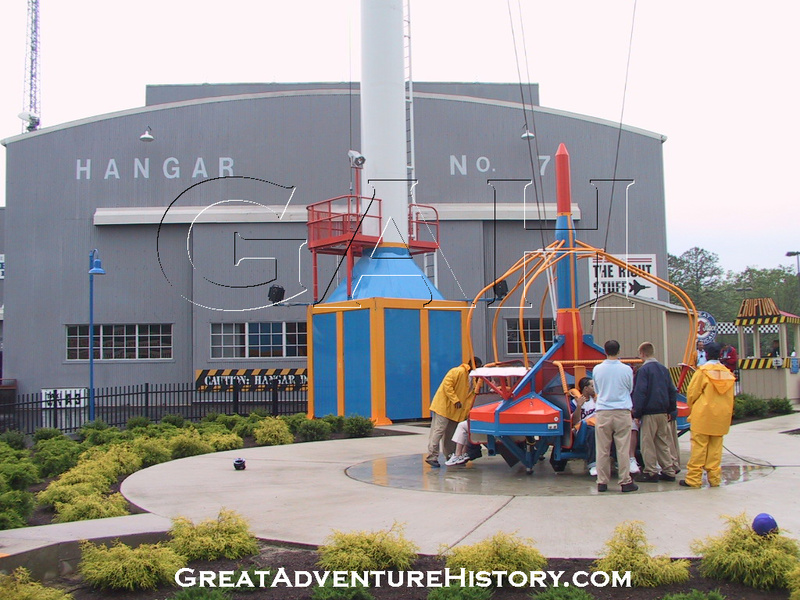 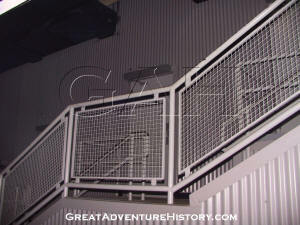 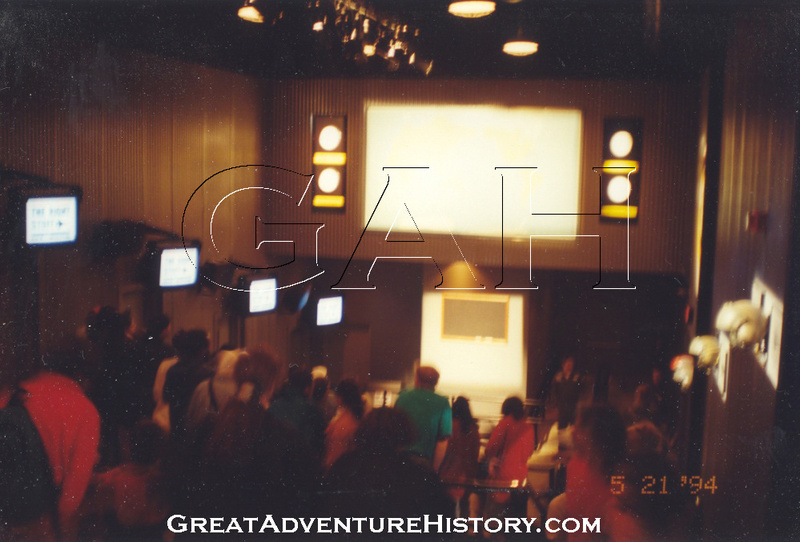 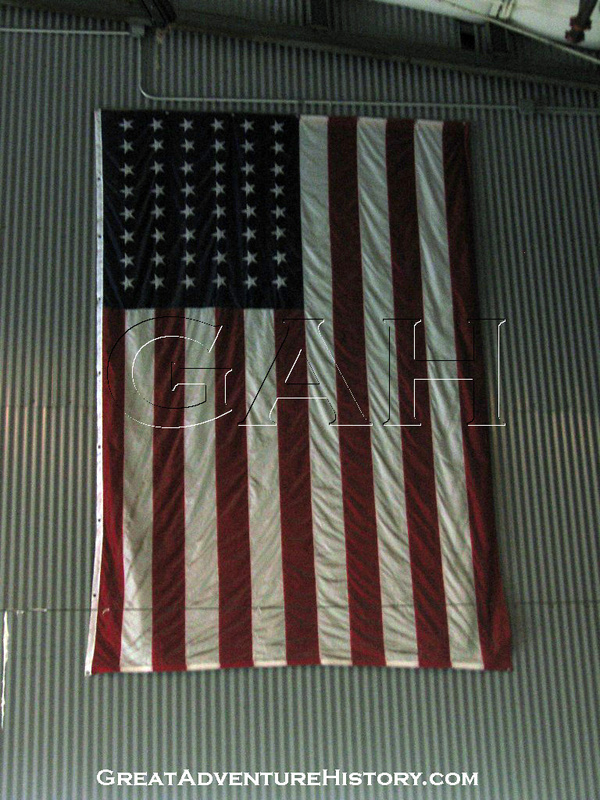 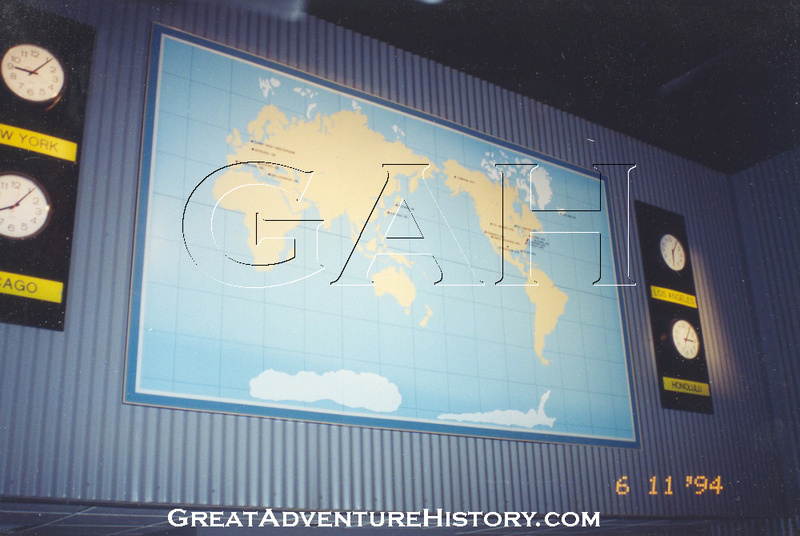 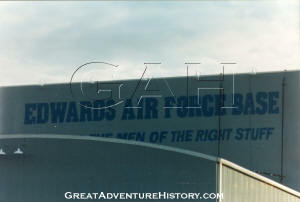 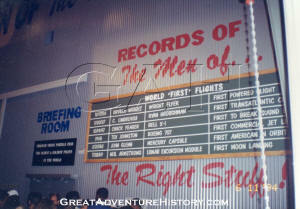 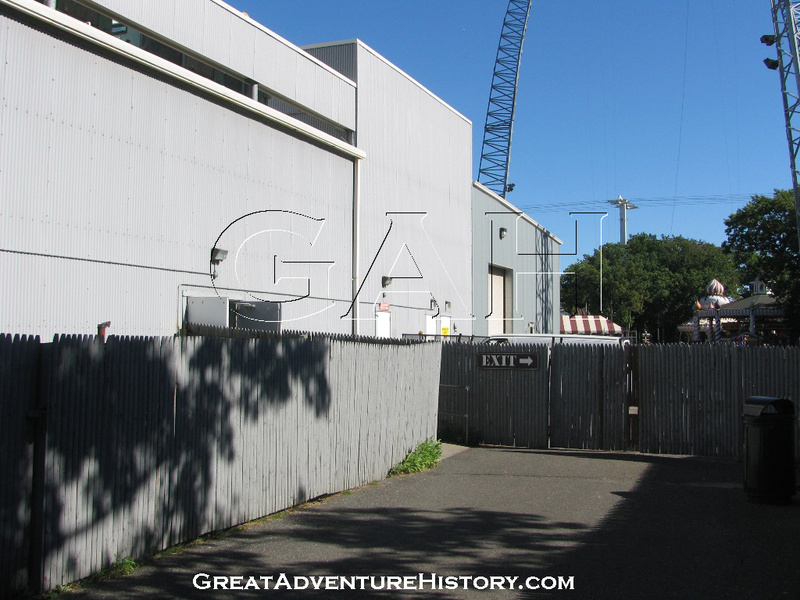 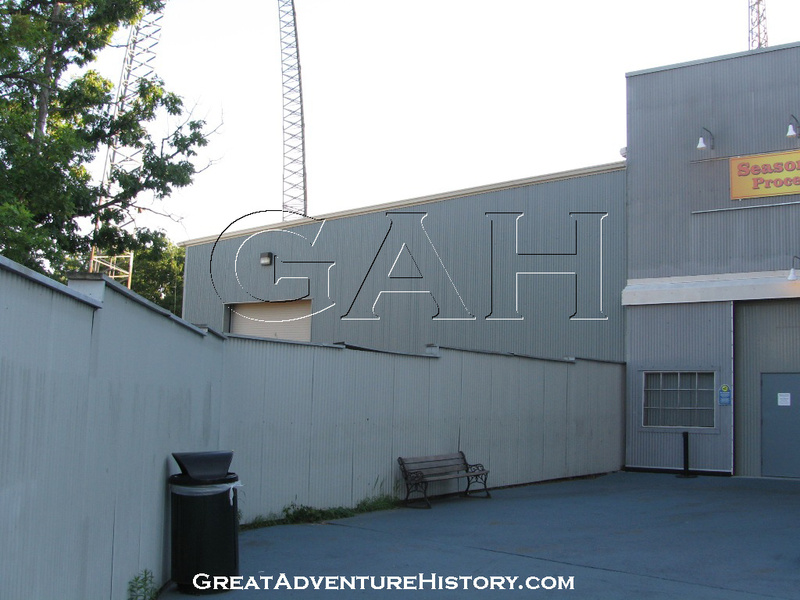 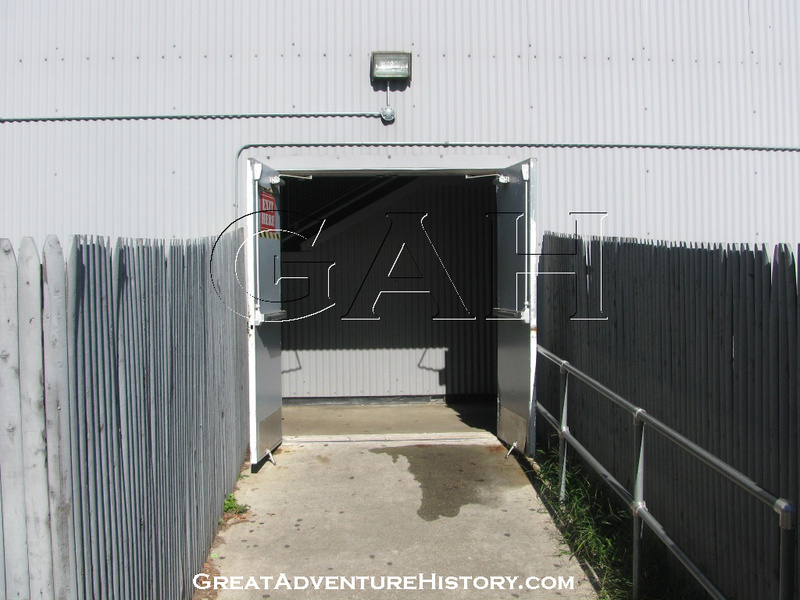 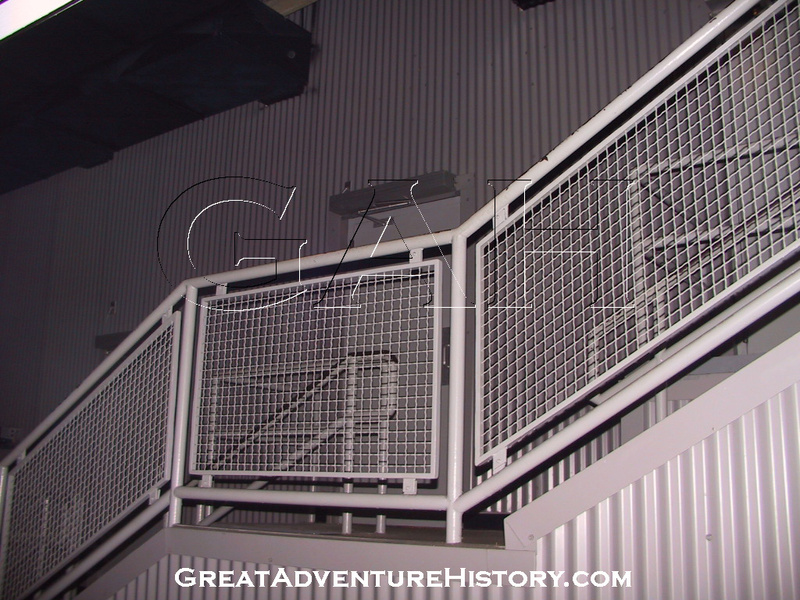 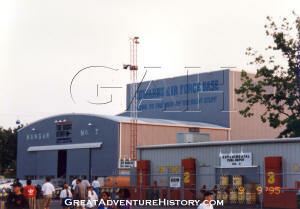 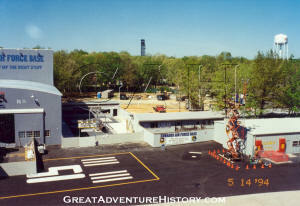 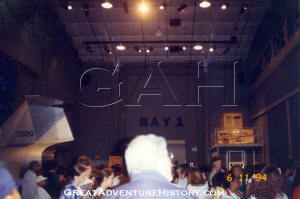 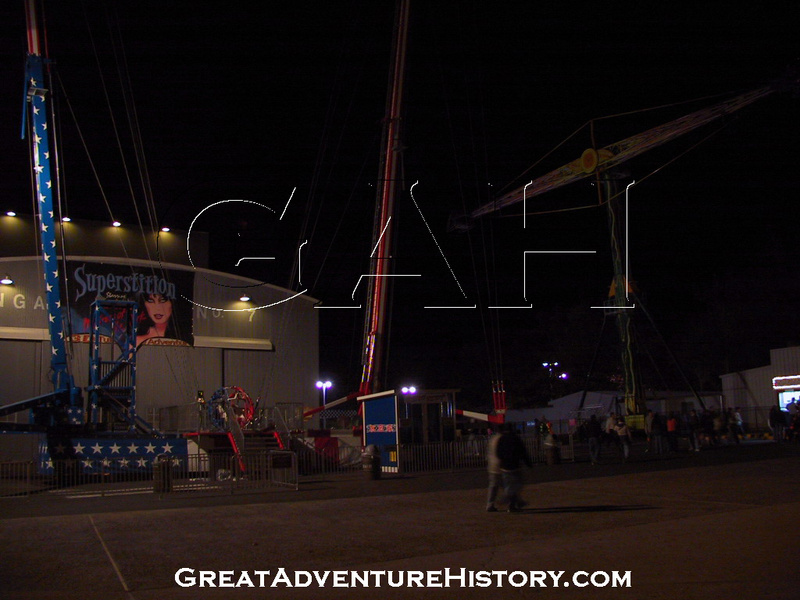 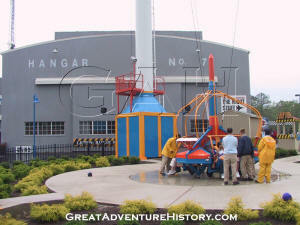 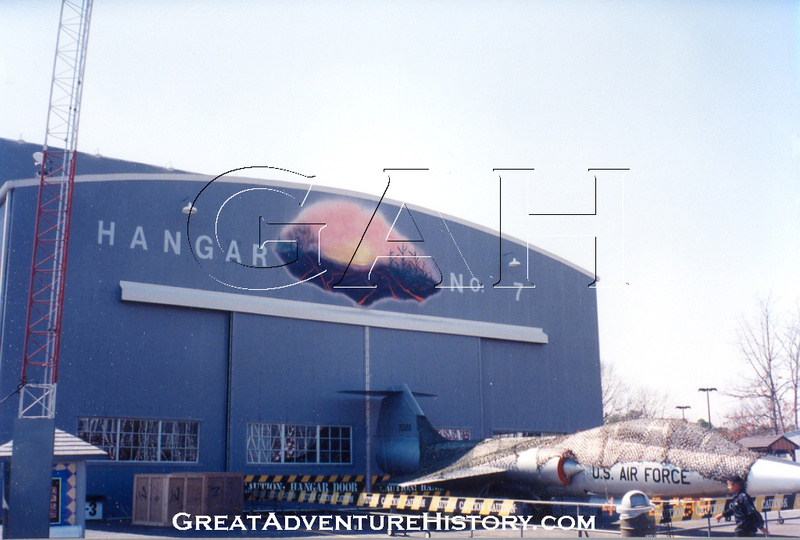 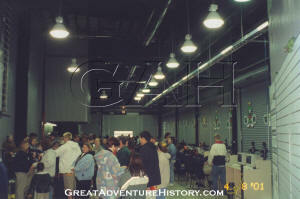 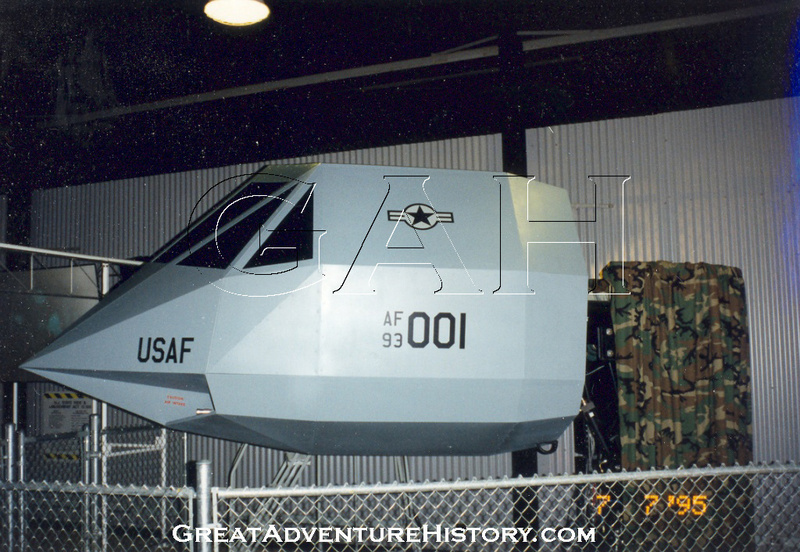 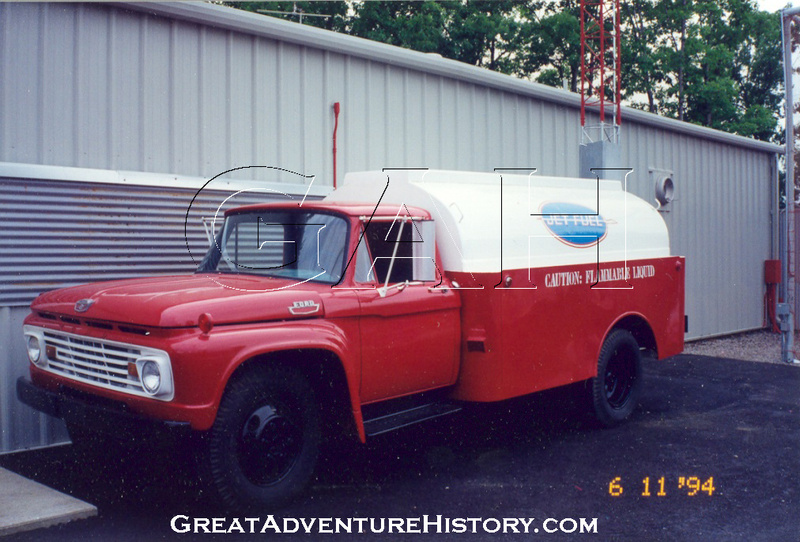 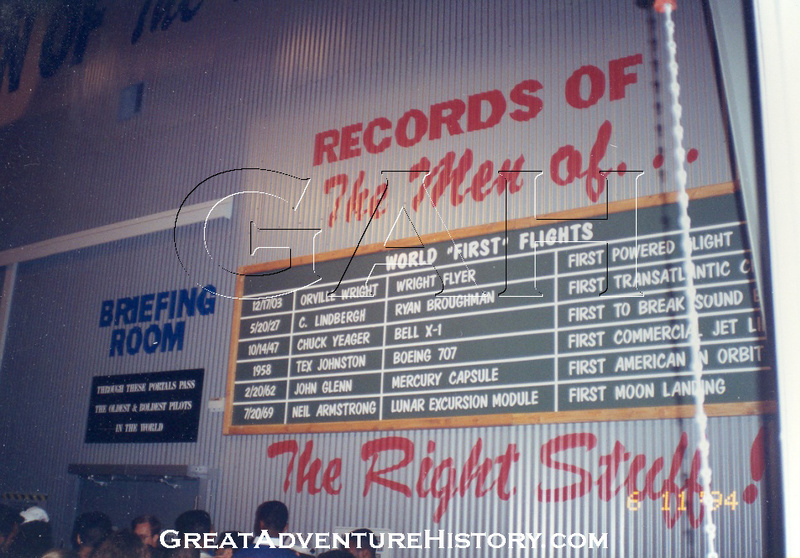 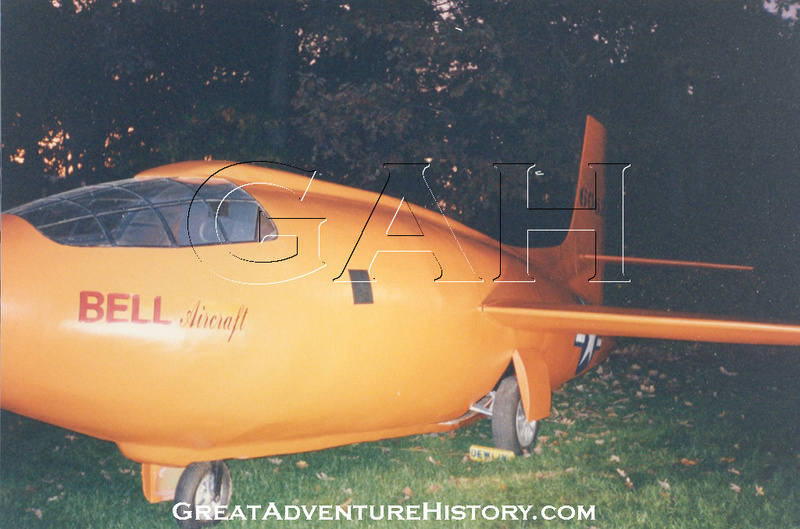 The first reference in the park to the Warner Brothers film The Right Stuff was display was featured in front of the G-Force Scrambler which was located on the site where Chiller would later stand. This was part of an effort to bring theme to the random collection of rides with the Looping Starship and Scrambler at the edge of Movietown. 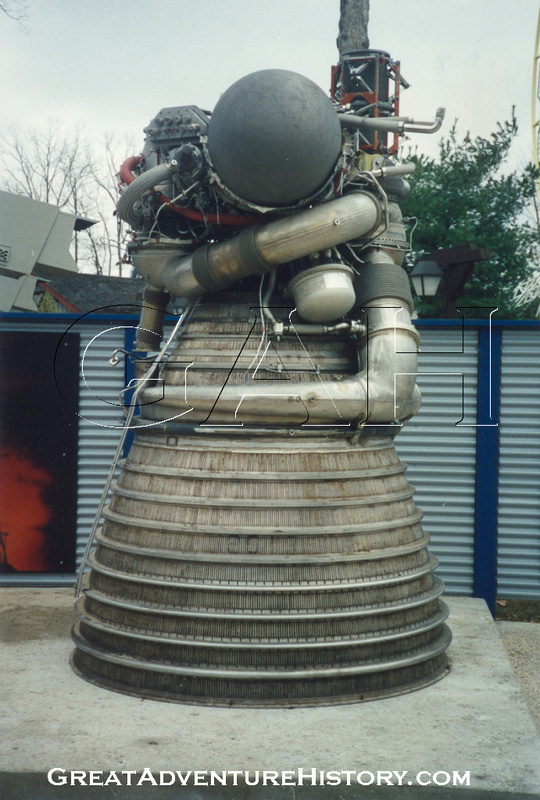 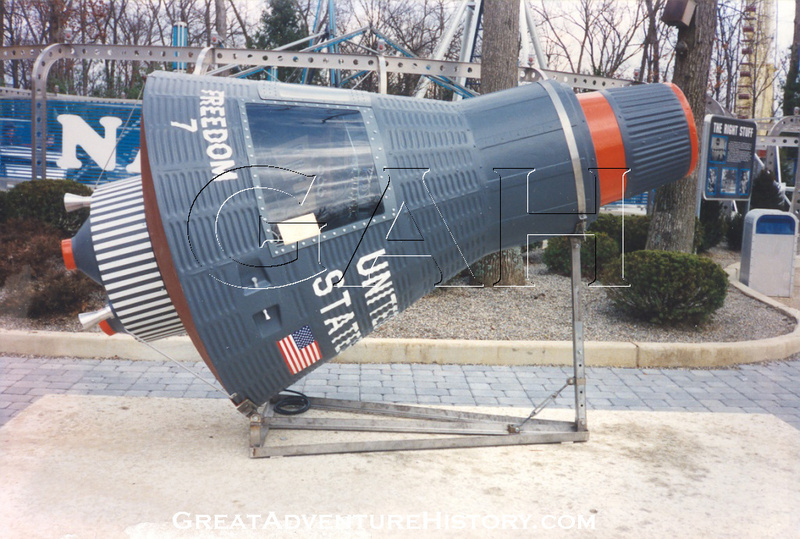 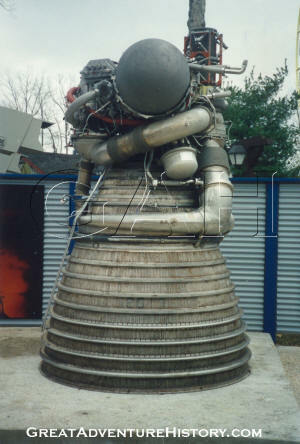 Theme elements in Movietown included a replica of an Apollo space capsule as well as a real rocket engine. 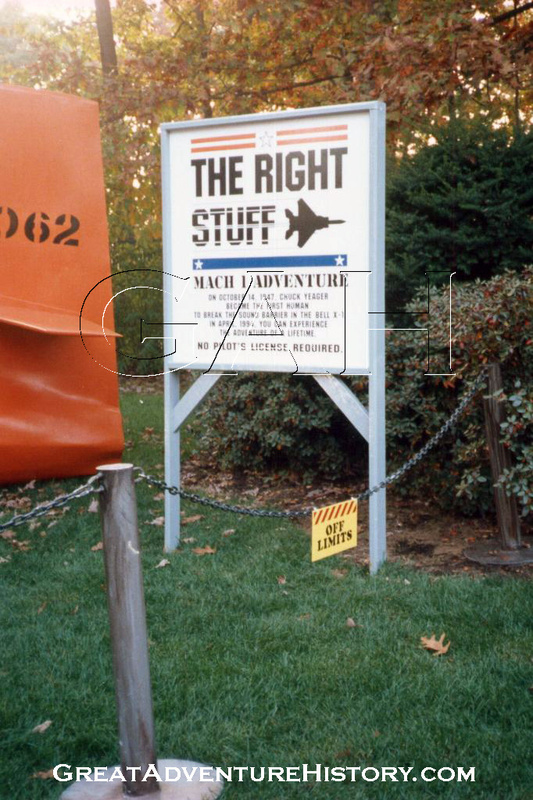 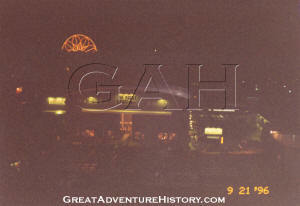 This space theme would remain in place until the end of 1996 when the Looping Starship and Scrambler were moved to the top of the Boardwalk, along with some (but not all) of the theme elements. 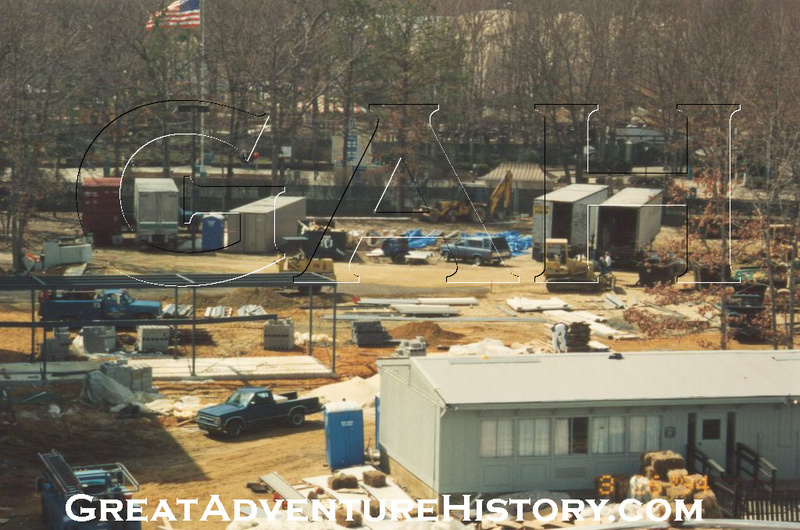 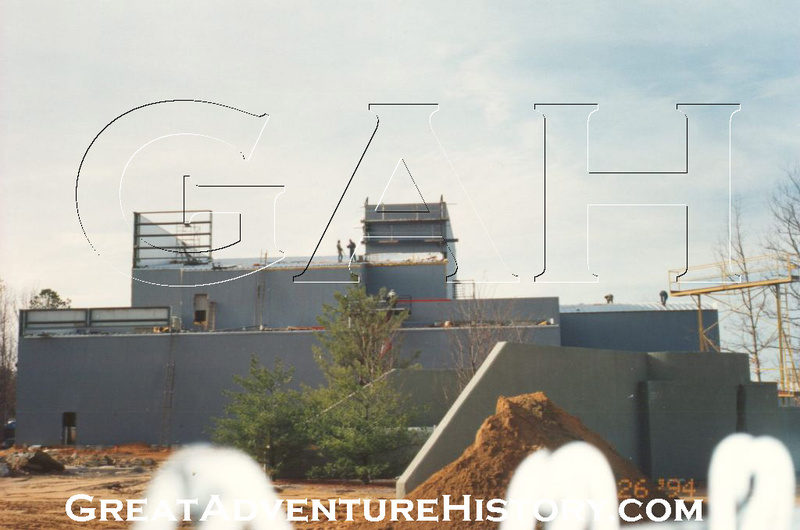 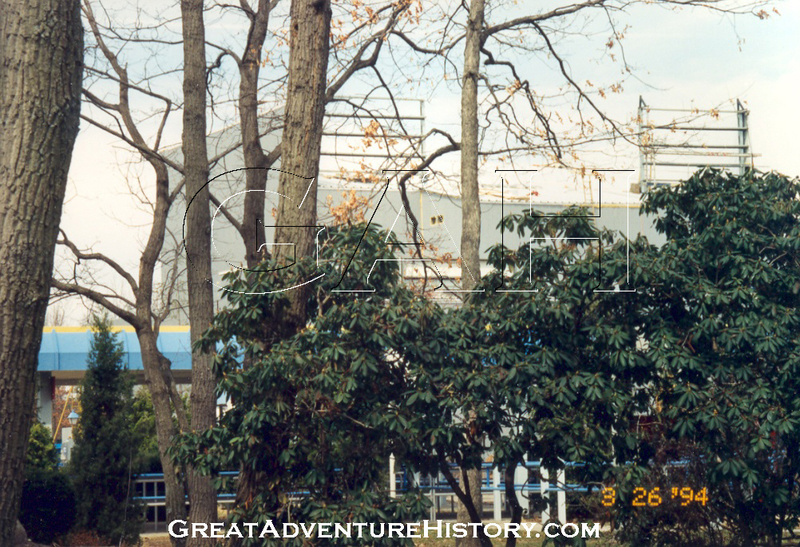 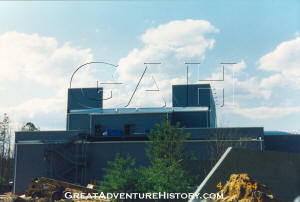 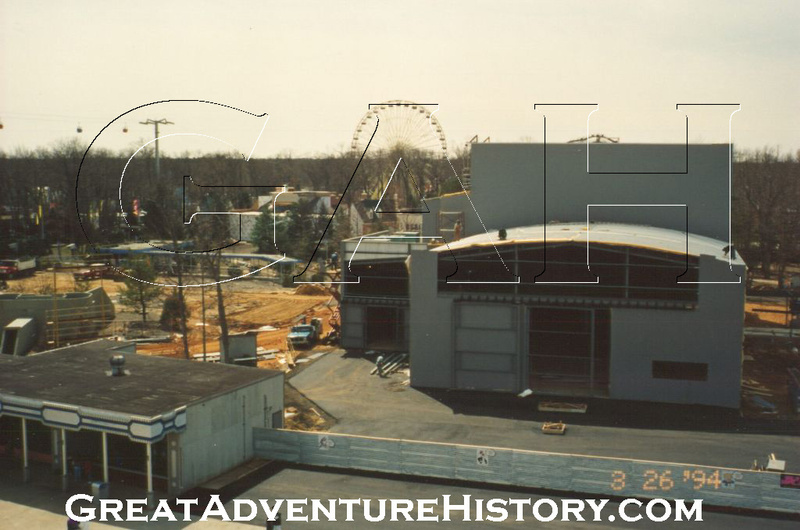 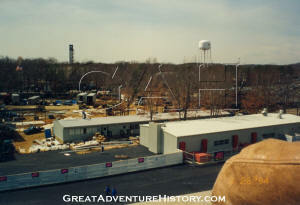 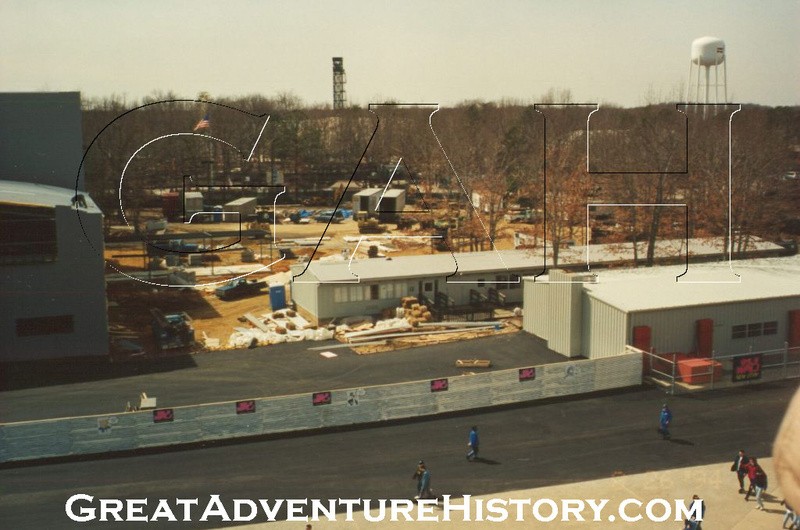 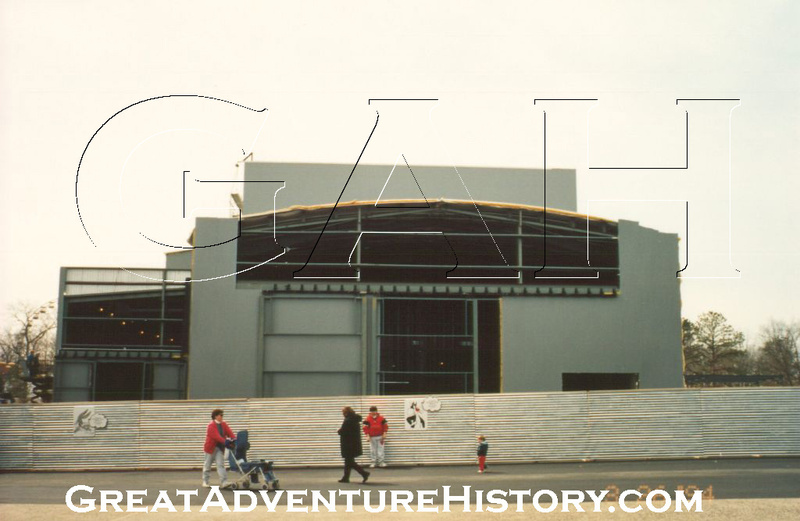 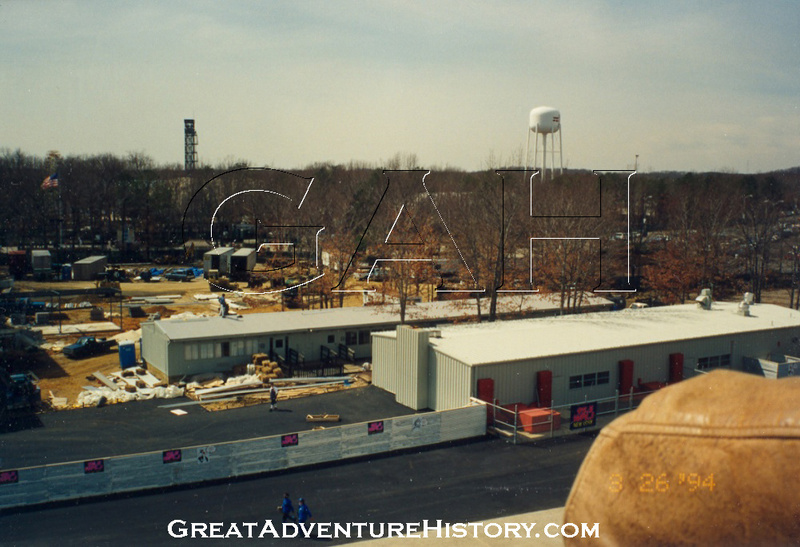 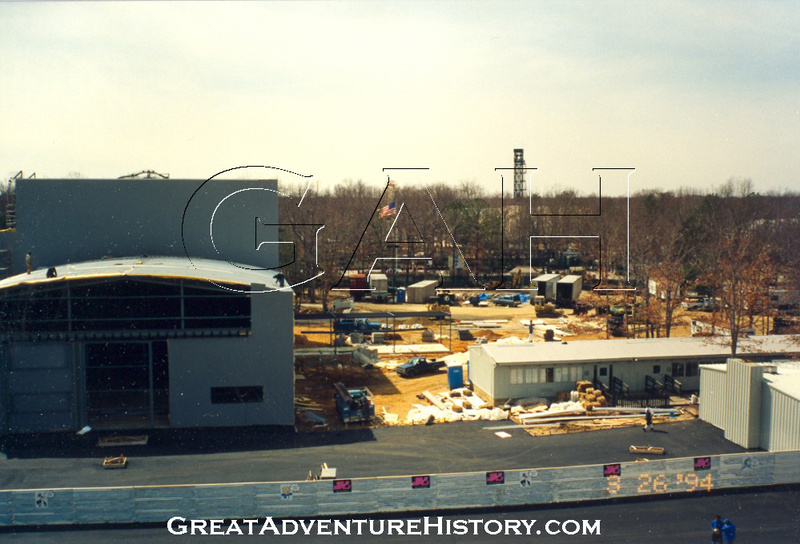 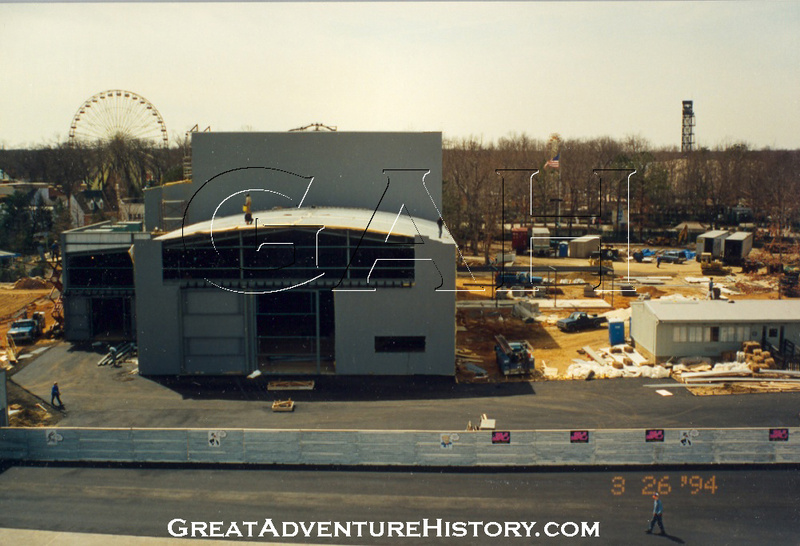 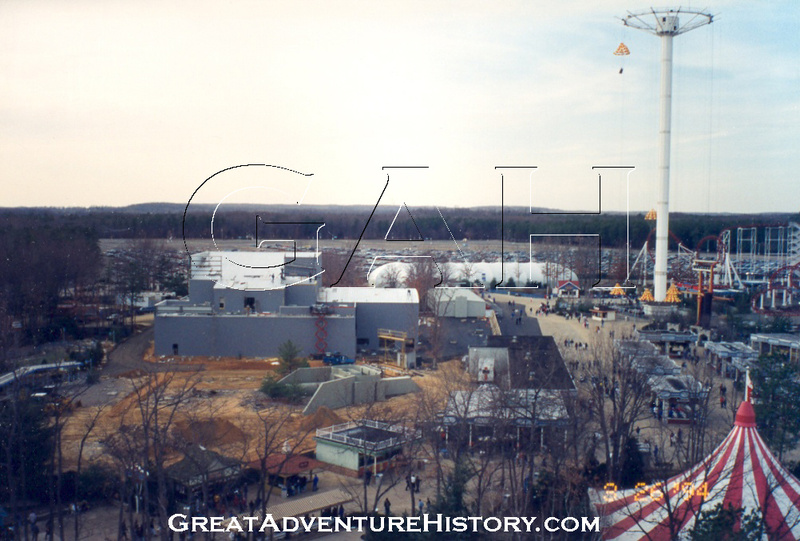 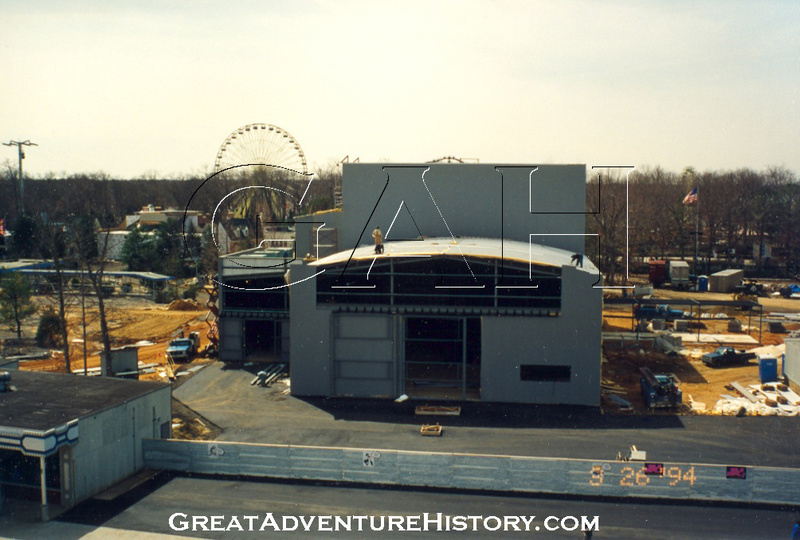 In the spring of 1994, guests entering the park were greeted with the huge new structure rising just beyond the Outer Mall fences. 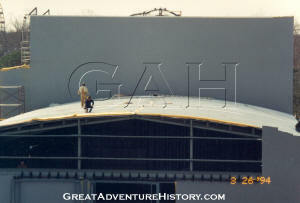 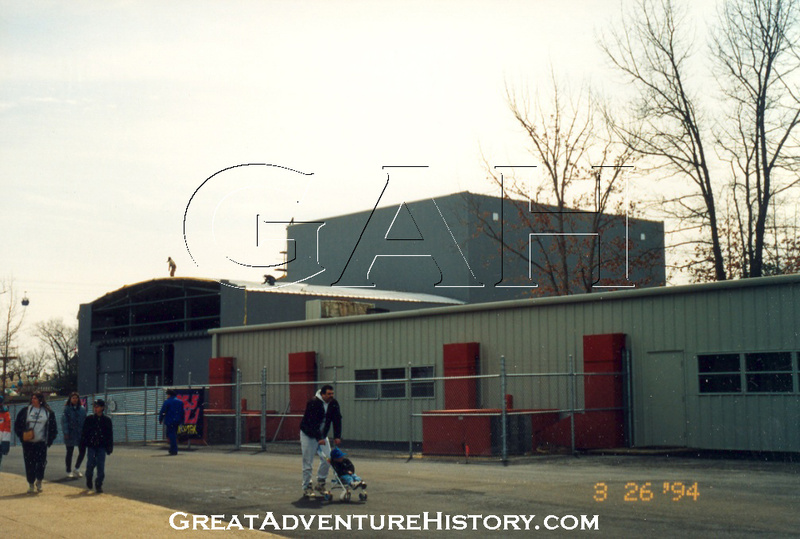 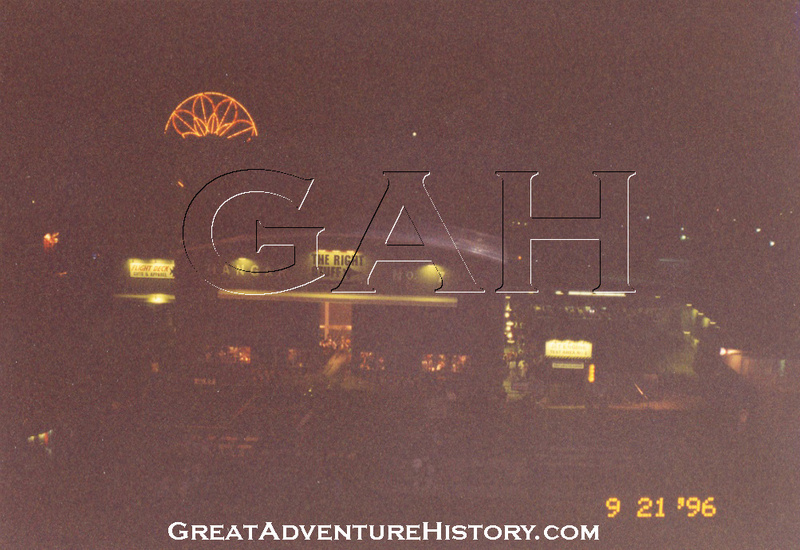 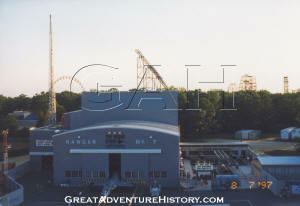 The giant gray building was designed to look like an aircraft hanger, and was still under construction as the season began. 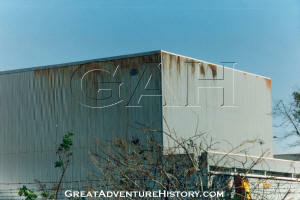 The area which had been surrounded by a high fence and trees had been cleared and the existing buildings were shrouded in industrial looking metal skins. 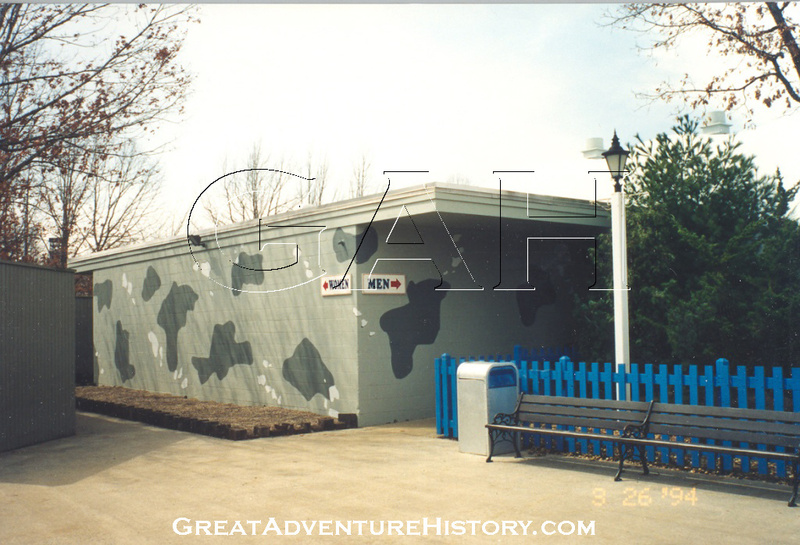 The outside wall of the Employee Dining building was exposed and themed, with the air-conditioning units painted and themed with fences. 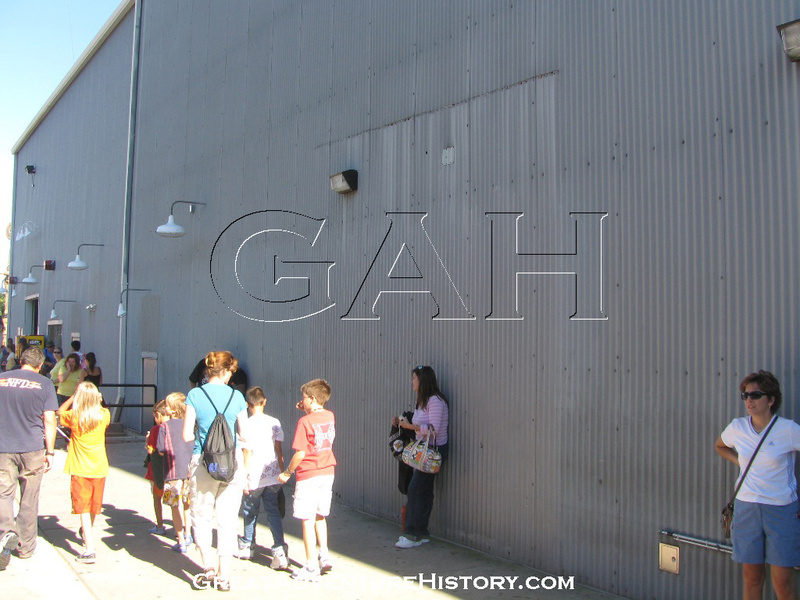 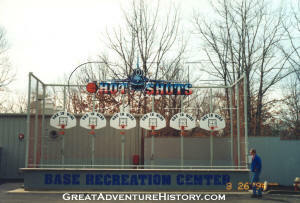 The basketball game which had been in what became the front of the building was relocated further up the Boardwalk and given the name "Hot Shots" with a jet plane sign. The entire upper end of the Boardwalk was given a re-theme to go with the addition of The Right Stuff. 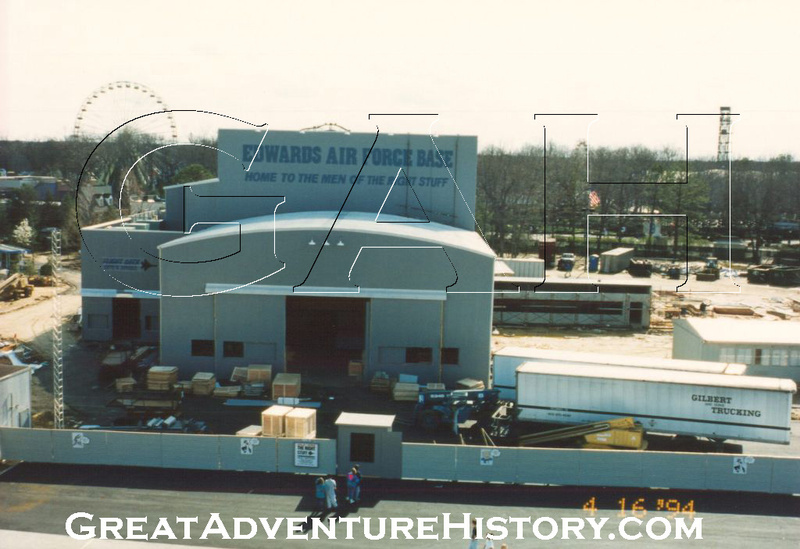 The buildings and rides were made to look like they were part of an Air Force Base, with a military paint scheme and names. 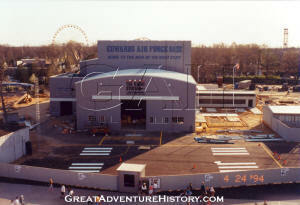 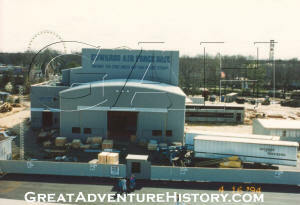 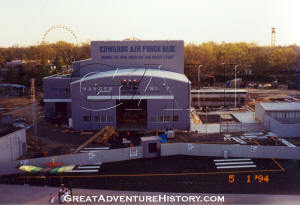 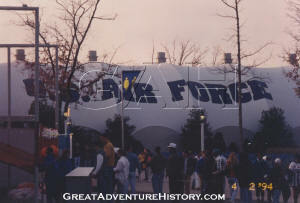 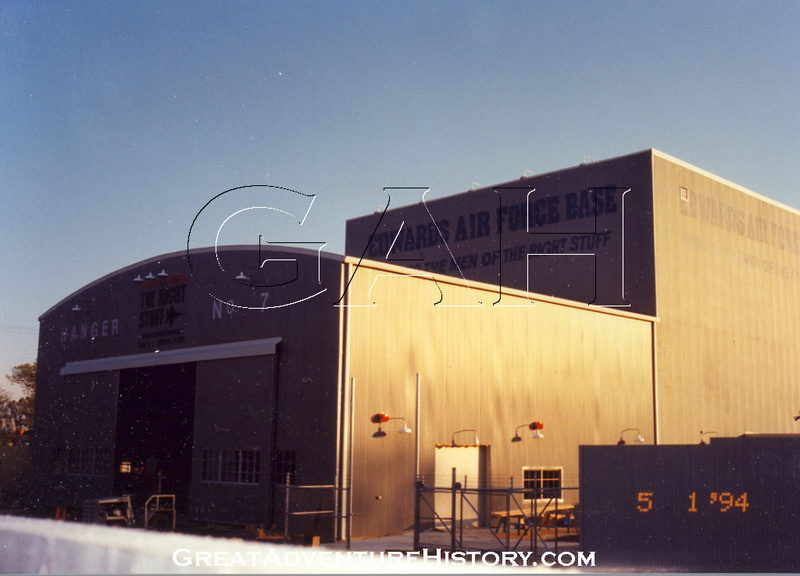 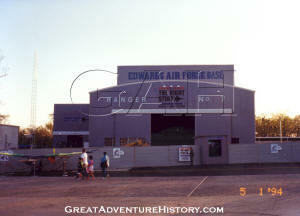 The existing "bubble building" which now serves as the entrance of Superman Ultimate Flight was being used as a storage building, and was painted with U.S. Air Force colors and logos. 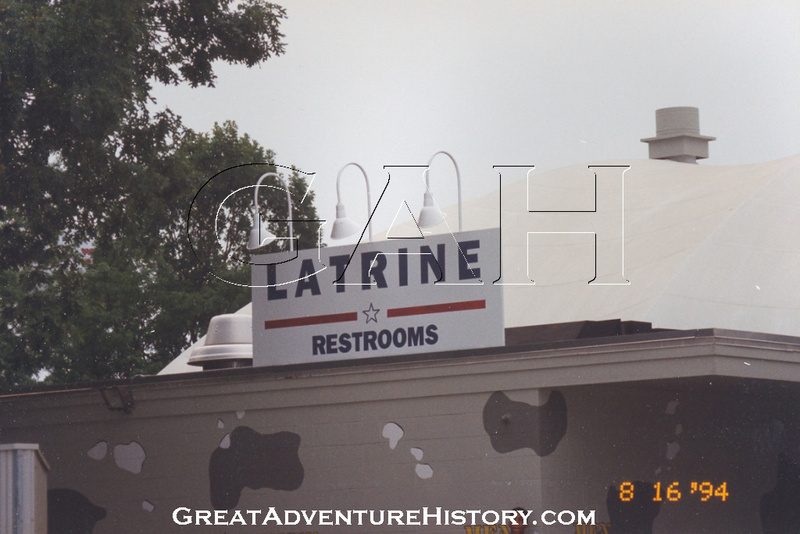 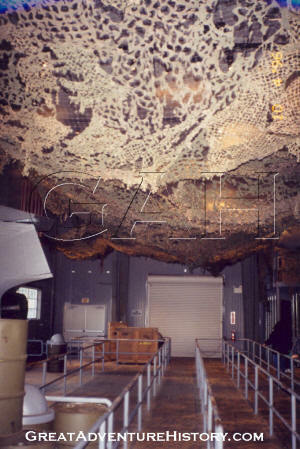 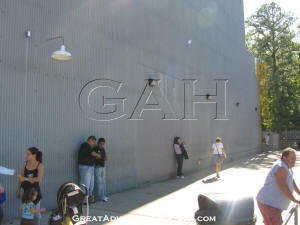 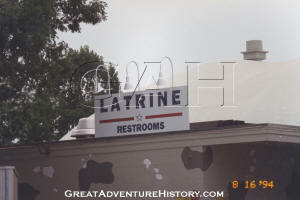 The attached restrooms were painted with gray camouflage was eventually given a "Latrine" sign. 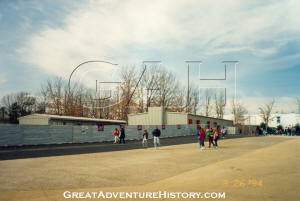 The newly cleared area which was an expansion of the existing path was paved with blacktop. 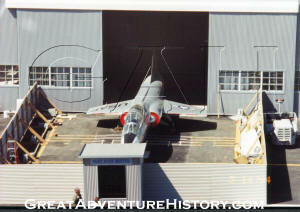 The blacktop would eventually receive painted runway markings. 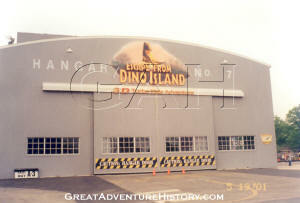 Over the weeks construction progressed with the front of the building being enclosed and the hangar doors were added. Logos and signs were added to the structure. 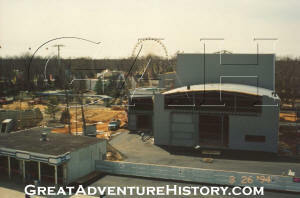 As the end of April approached, the interior of the building was being outfitted. 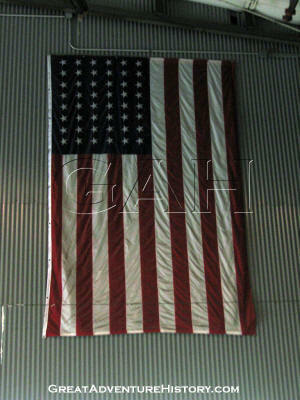 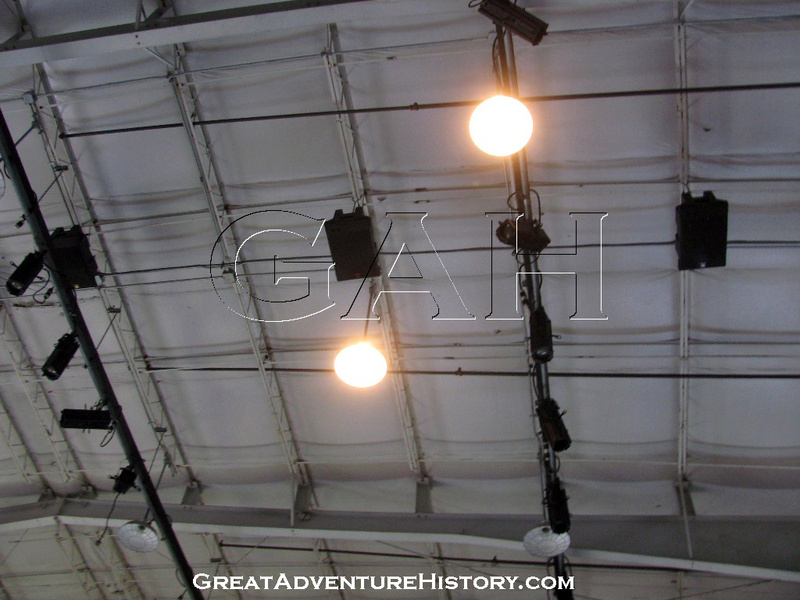 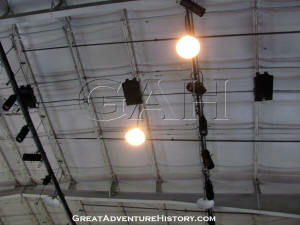 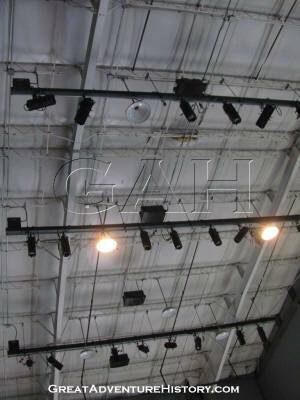 The truckloads of the seating units were brought into the building through the large front hangar doors. 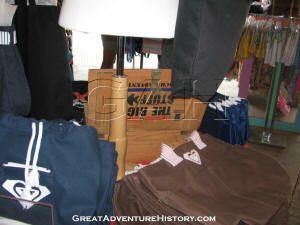 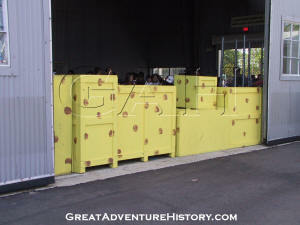 Some of the wooden shipping crates were kept in the queue area as props. 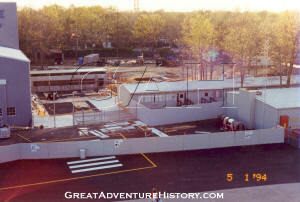 A queue building was constructed beside the main structure. 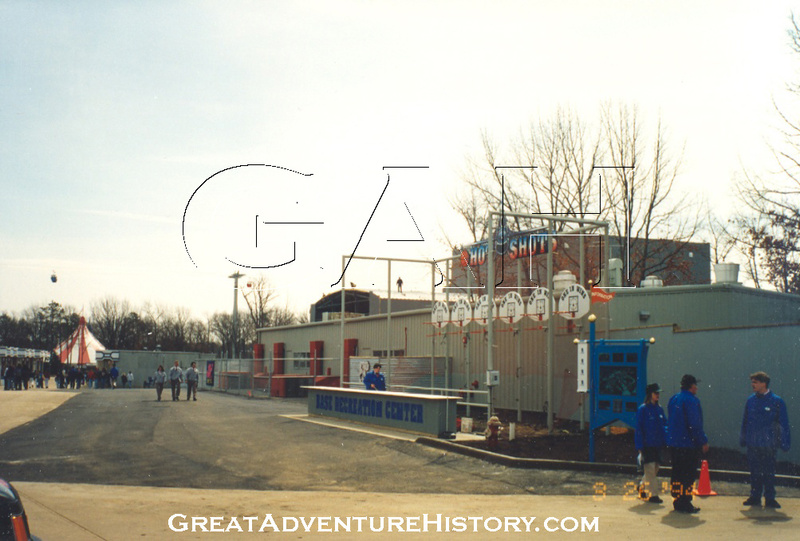 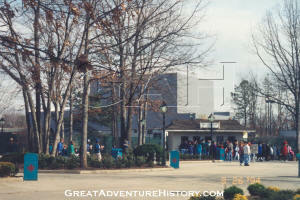 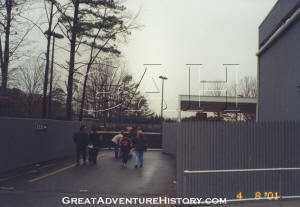 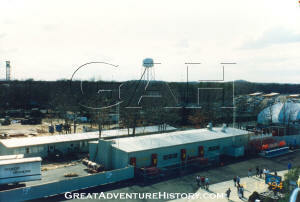 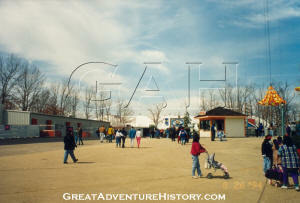 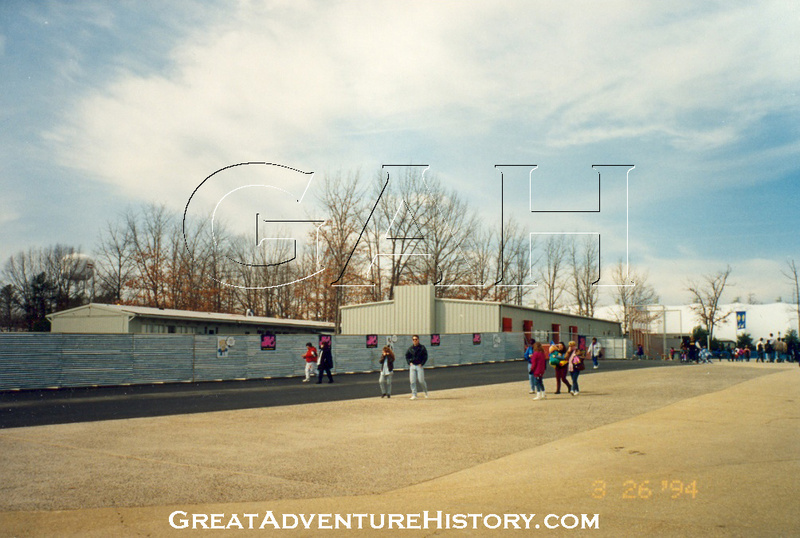 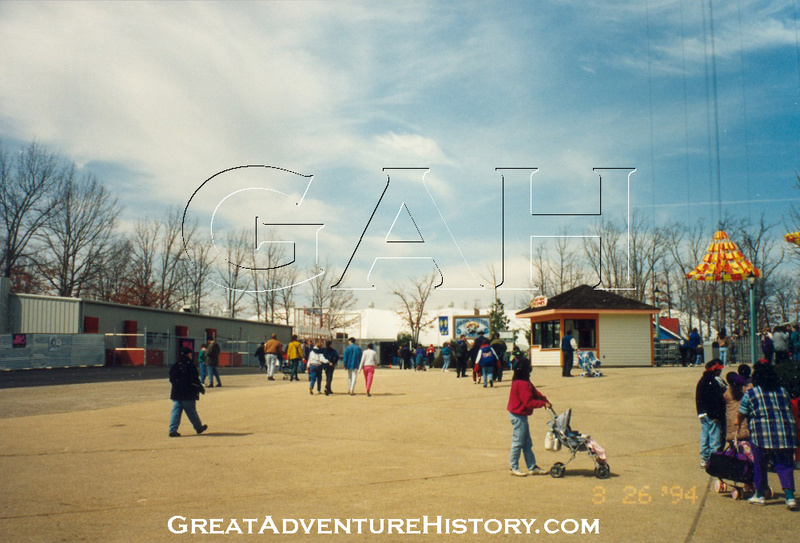 This queue was removed in 1999 to make way for the Great American Road Race go-karts. 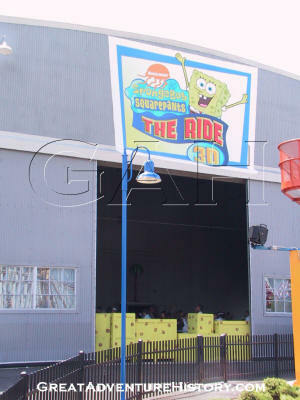 From the exterior, the ride appeared to be nearly complete though much work was still happening inside. 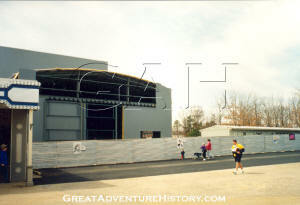 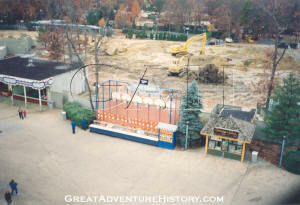 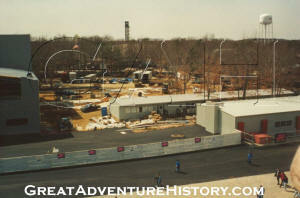 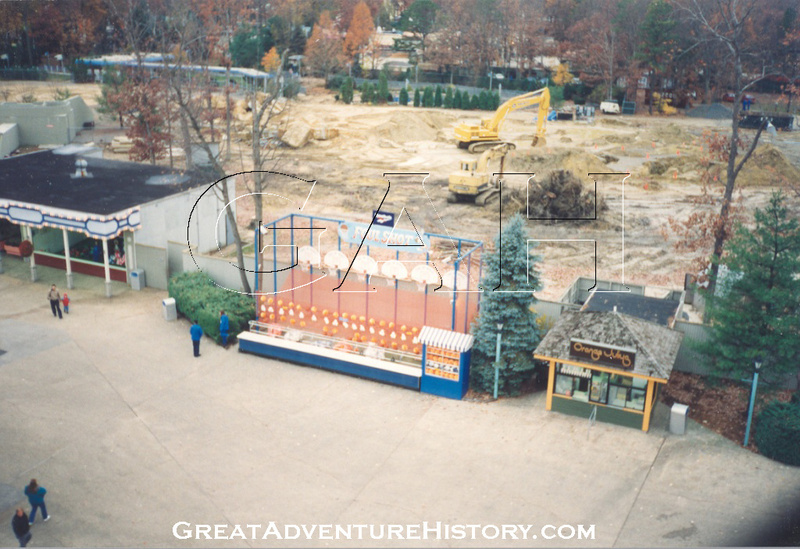 The Joust-A-Bout ride, which was renamed Sky Pilot in 1997 as an additional part of the thematic makeover of the area, offered guests a view over the fence into the construction site. The queue building themed as a test bunker and outdoor queues took shape along with the new fences between the park and the backstage areas. 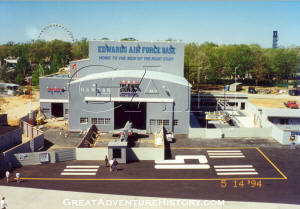 By the beginning of May, a small building was added to the construction area, and it featured a large screen TV showing previews of the film. 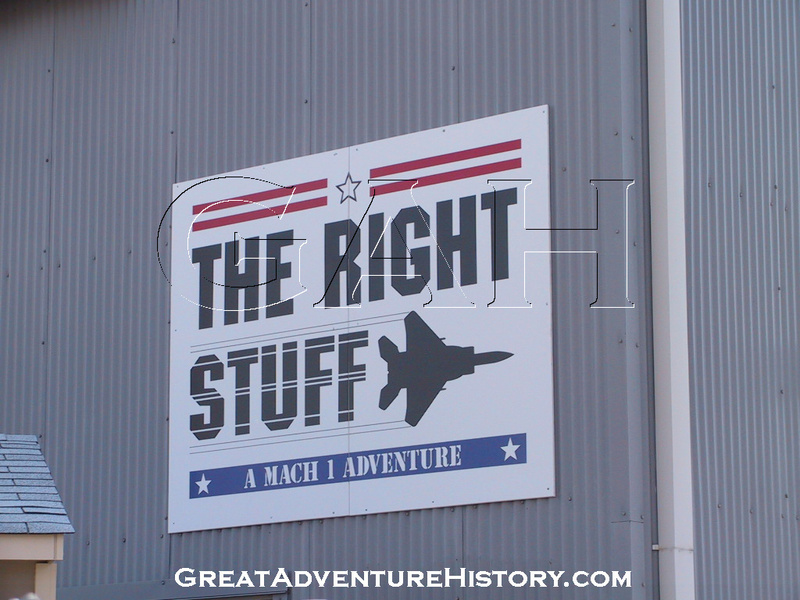 As May went on more signs and theme elements were added to The Right Stuff area and the overall section of the park, further enhancing the Air Force Base look. 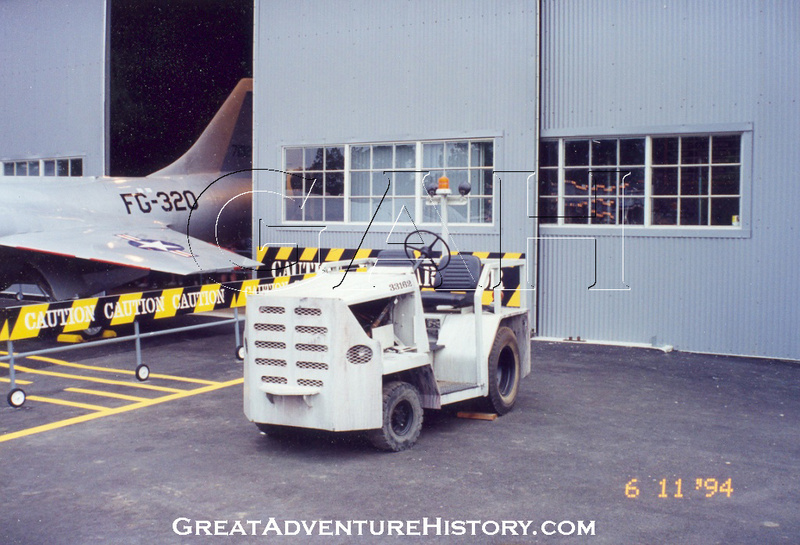 The construction fences were moved further back towards the building and a real F-104 fighter plane was added on the "runway". 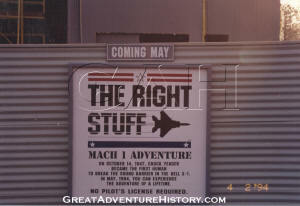 The Right Stuff made its debut to the media on May 20th, 1994. 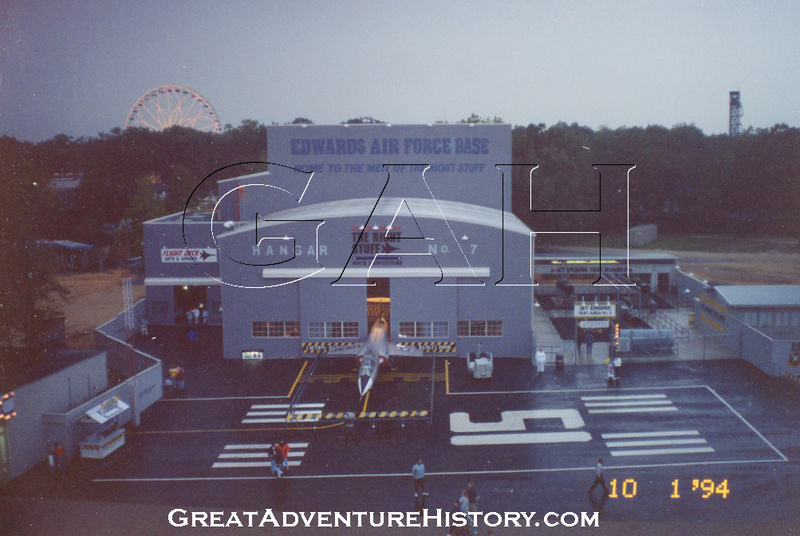 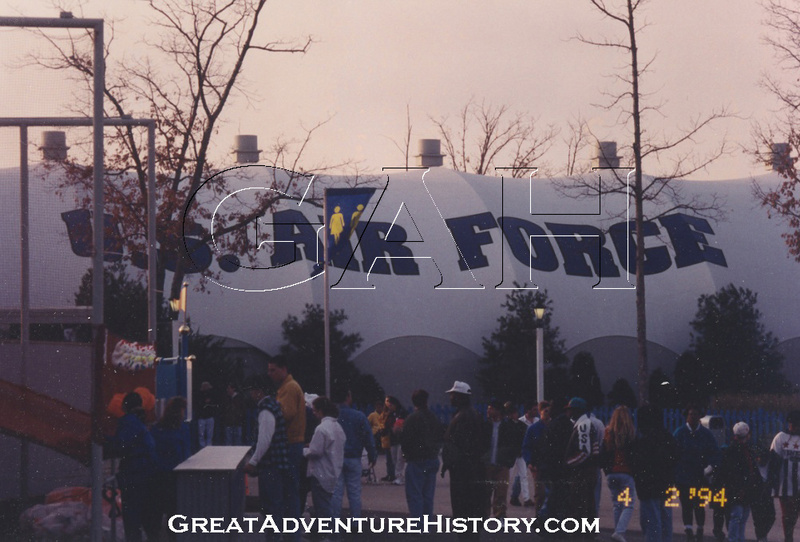 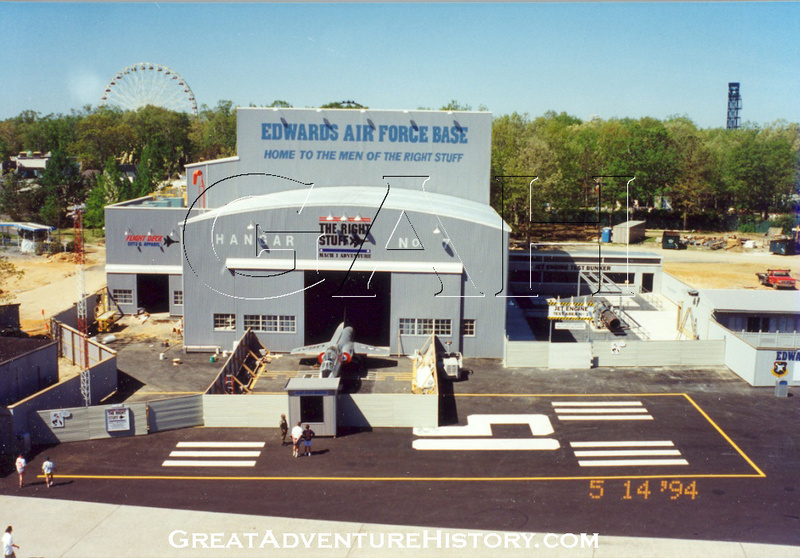 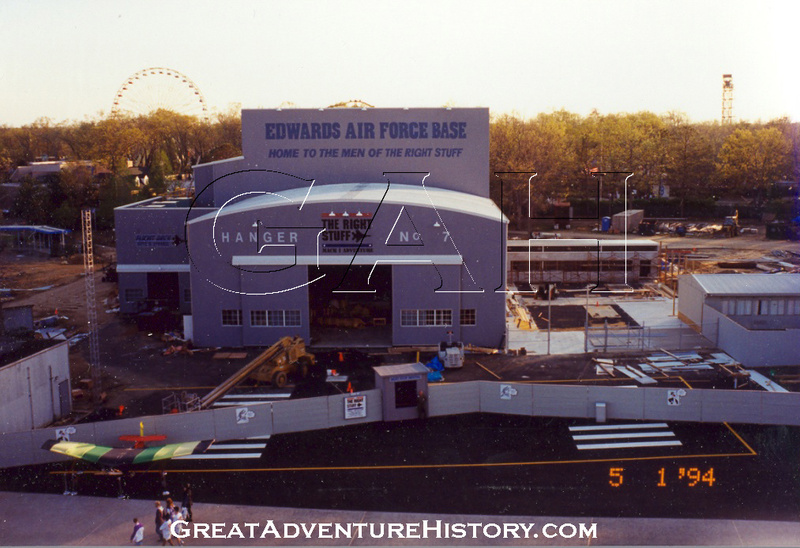 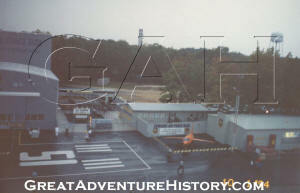 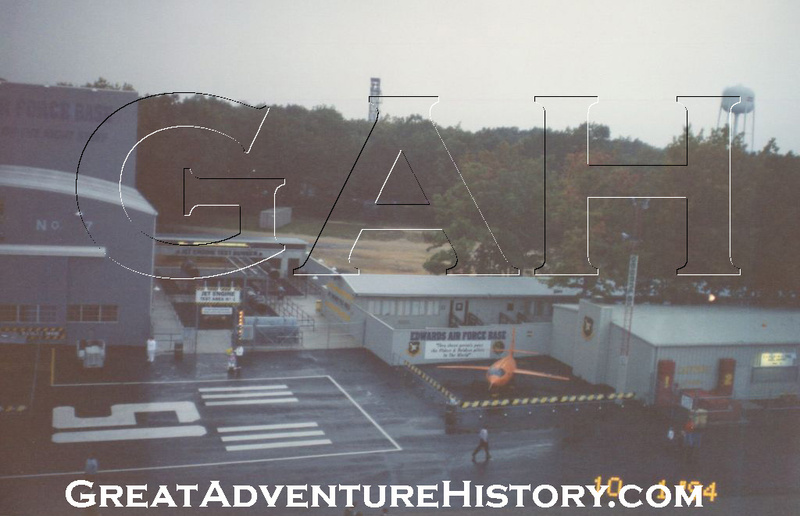 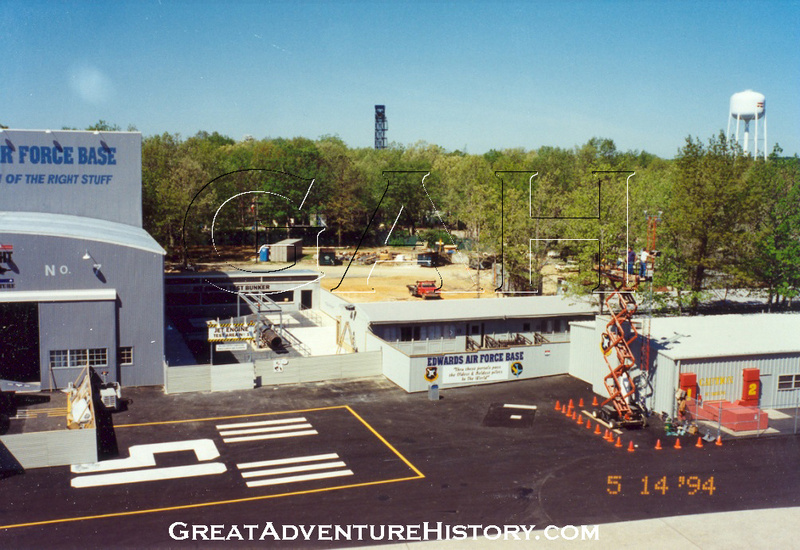 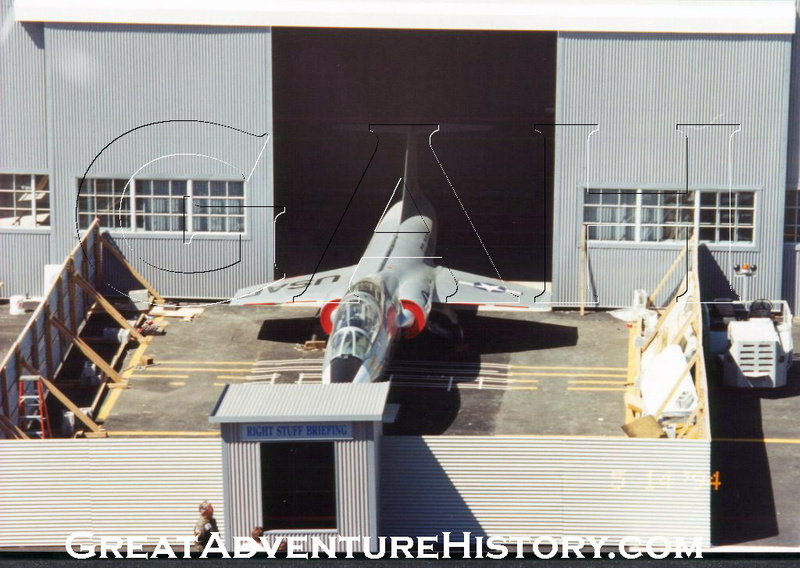 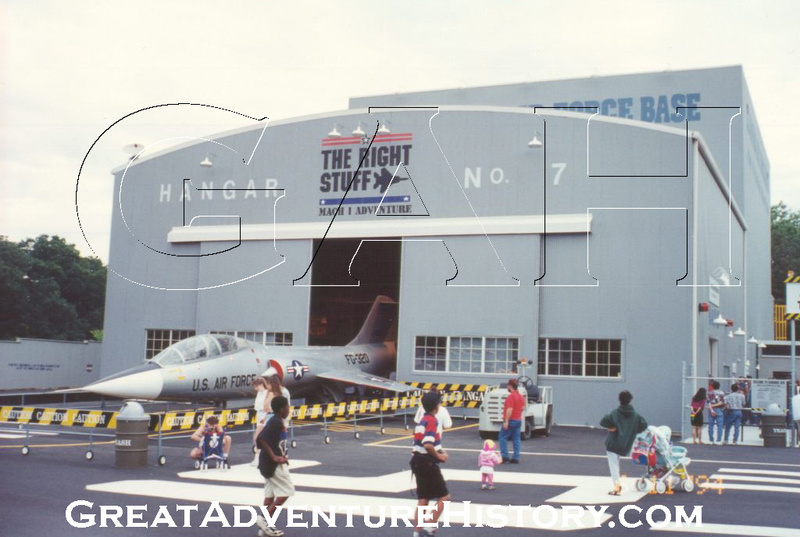 When the ride opened on May 21st, 1994, it was a well themed experience, from the entry of the queue, to the pre-flight Briefing Room to the theatre itself, where the seats which lent themselves well to the jet theme were decorated with military insignia. 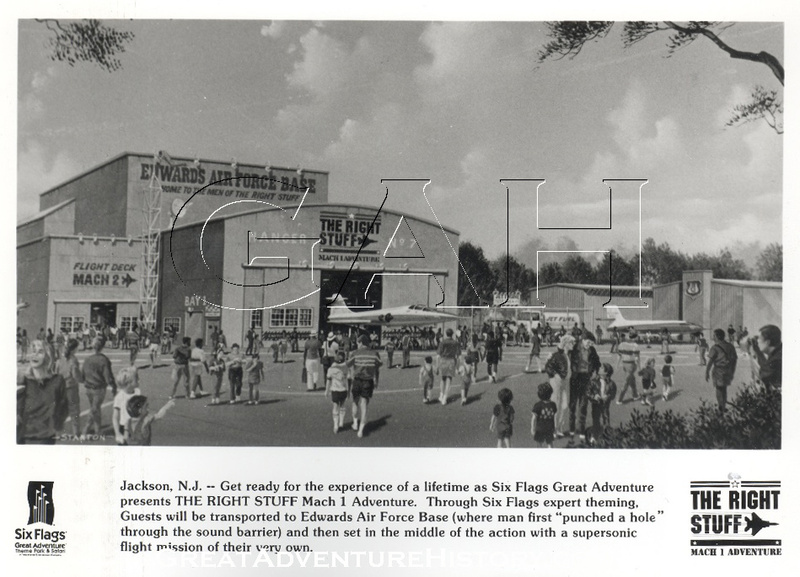 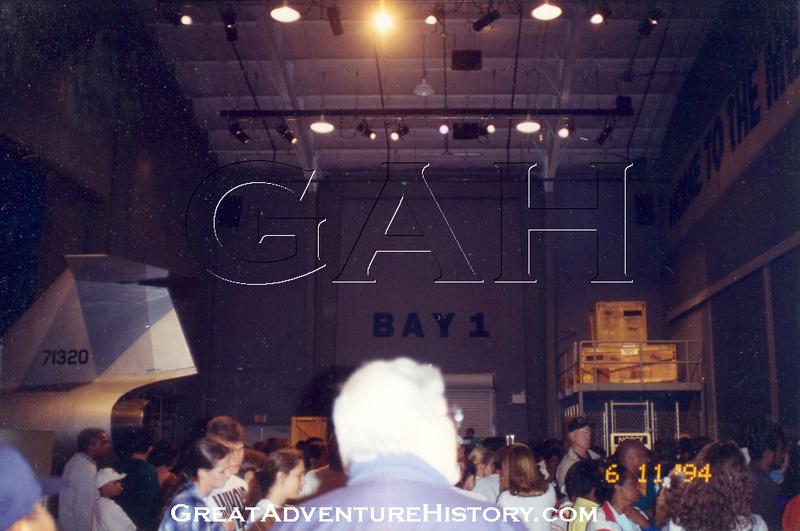 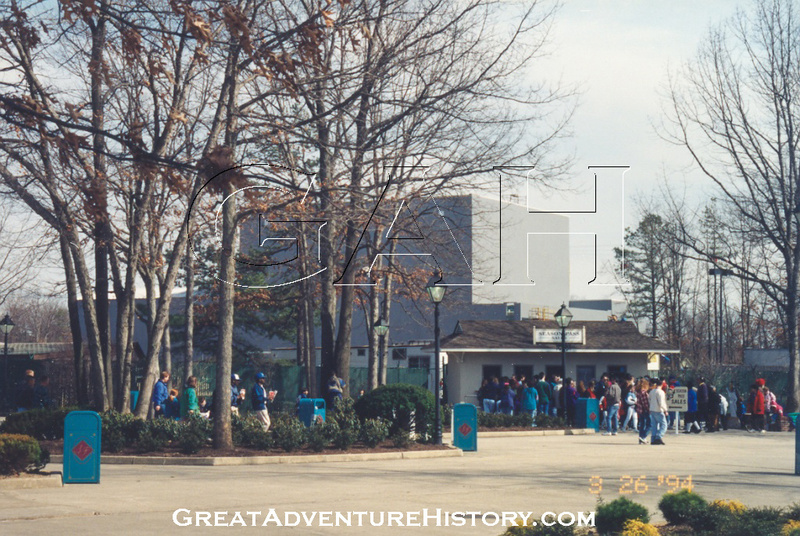 The well trained staff wore flight suits specifically made for the attraction, and kept lines moving, but even at peak efficiency there was a 2 hour plus wait on opening day due to the popularity of the new attraction. The entire attraction was top notch, with state of the art projection systems, theatrical lighting and genuine military surplus props. Guests in the queue were fully immersed in the Air Force Base atmosphere, which even included periodic flyovers of the queue, which were created with a sophisticated multi channel sound system. 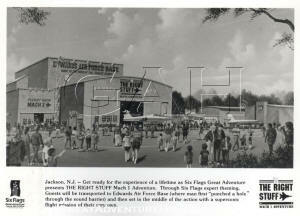 The loud and realistic sound of low flying jets would often cause guests to duck as they seemed to pass overhead. 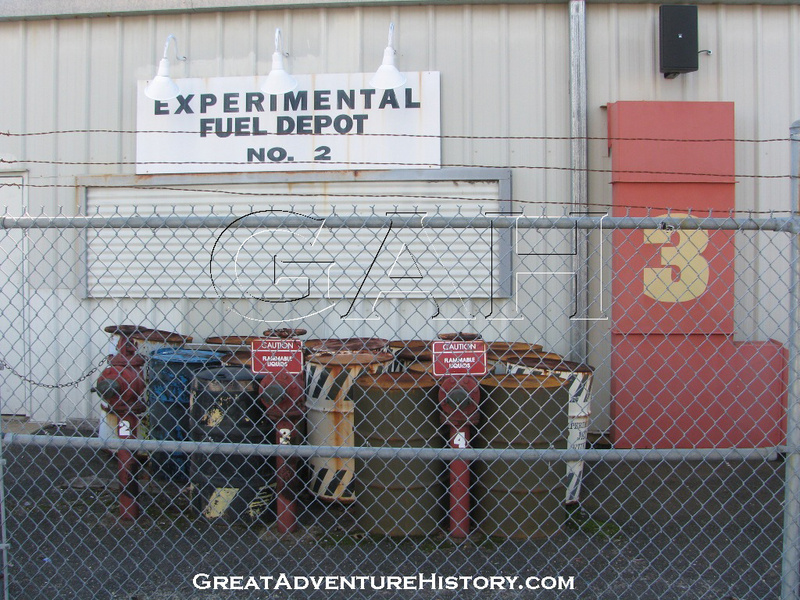 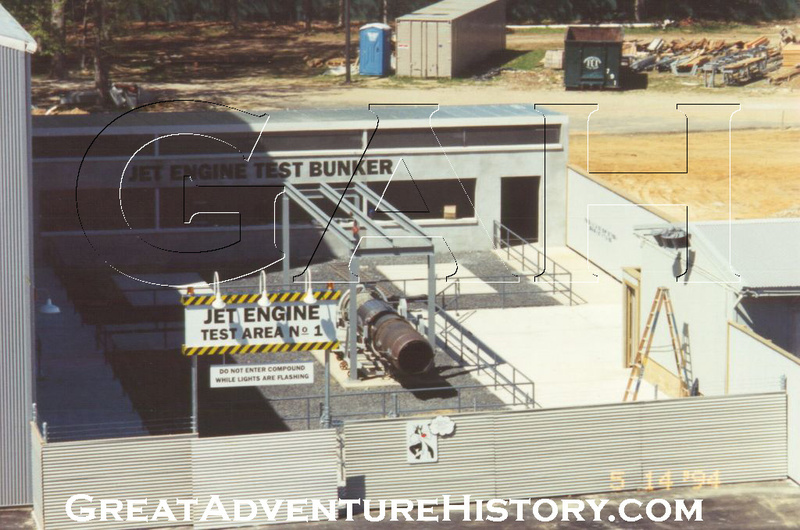 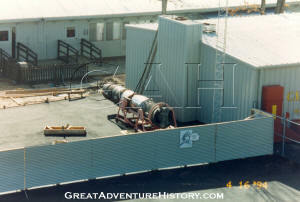 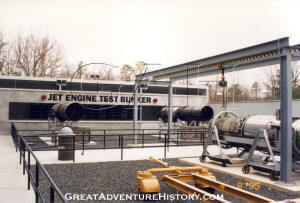 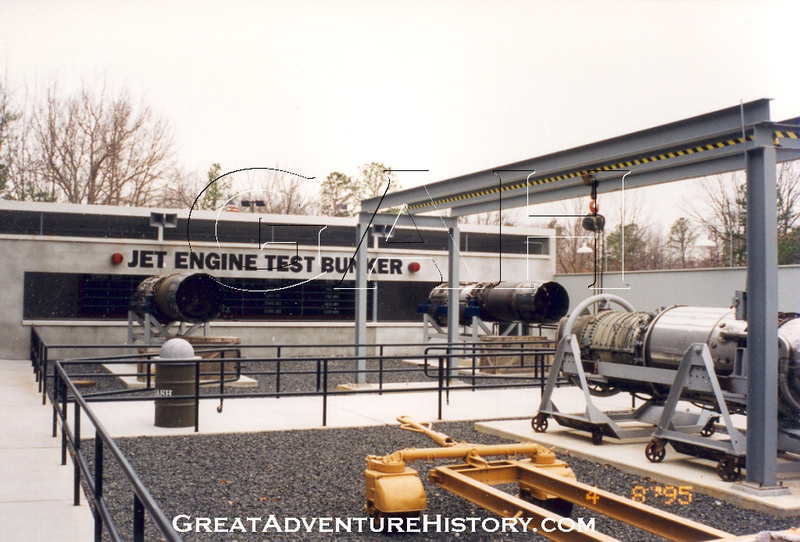 The queue of the ride was a jet engine testing area, which featured two real jet engines which featured light, sounds and smoke. 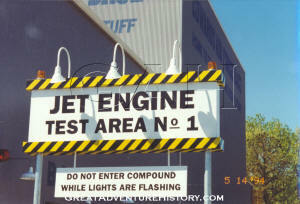 Every 15 minutes a siren would sound and lights would flash and the jet engine would begin "testing". 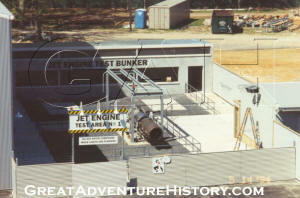 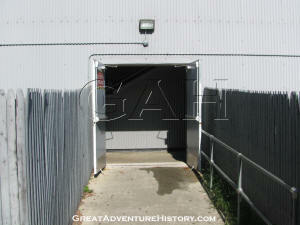 The "bunker" queue house featured props like hearing protection and clipboards like would be found in a test facility. 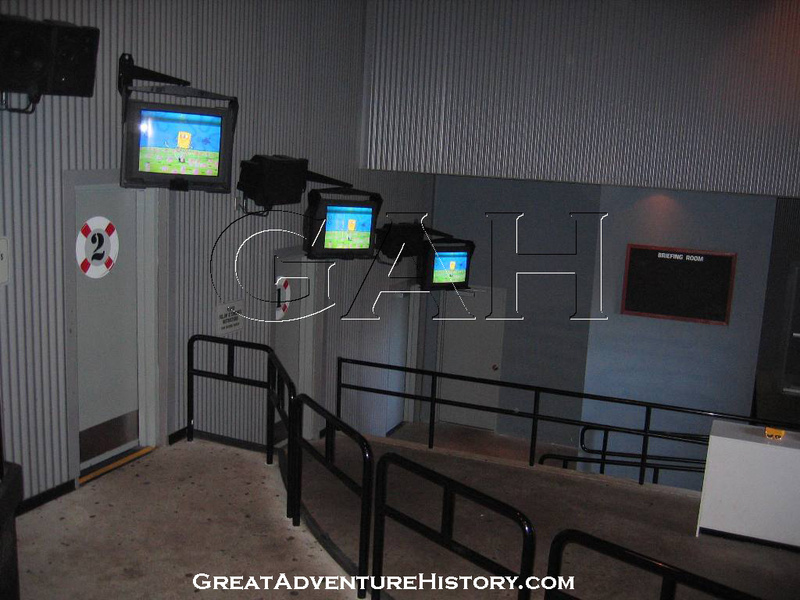 Once through the queue guests entered the preshow theater – a six level staging area for soon to be boarding guests. 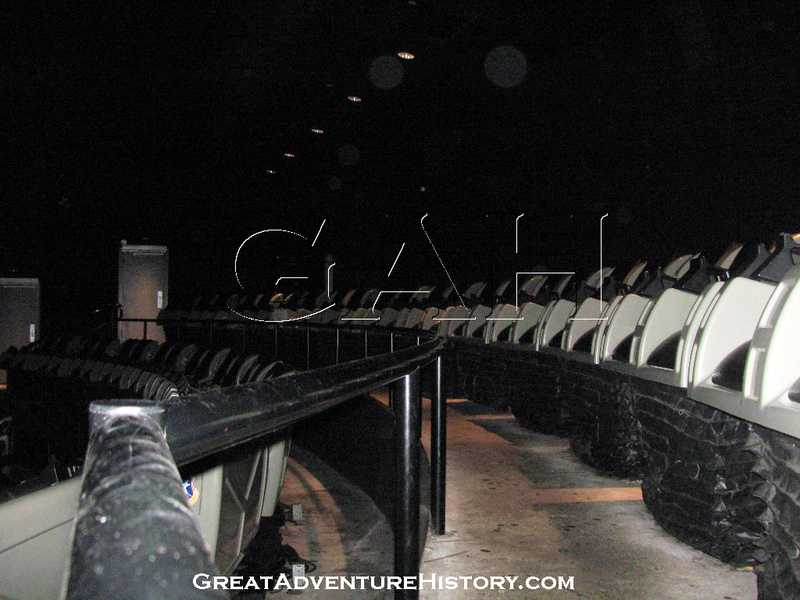 It featured five tiered bull pens, one for each row of theater seats as well as a waiting area in the front of the room for guests who preferred to just see the film without partaking in the motion base simulation. Dramatic lighting filled the preshow area highlighting avionic props on the walls including helmets, flight gear, and a world map and clocks which displayed the time around the globe. 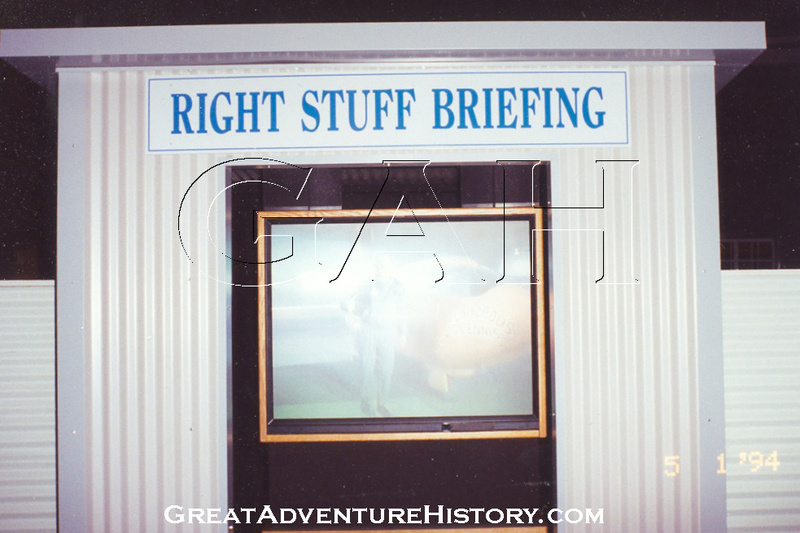 The preshow film entertained guests with the historic events around the breaking of the sound barrier and introduced pilots to their flight vehicle including the required safety briefing for the upcoming mission. Once completed, automatic doors provided entry to the massive five story main theater. 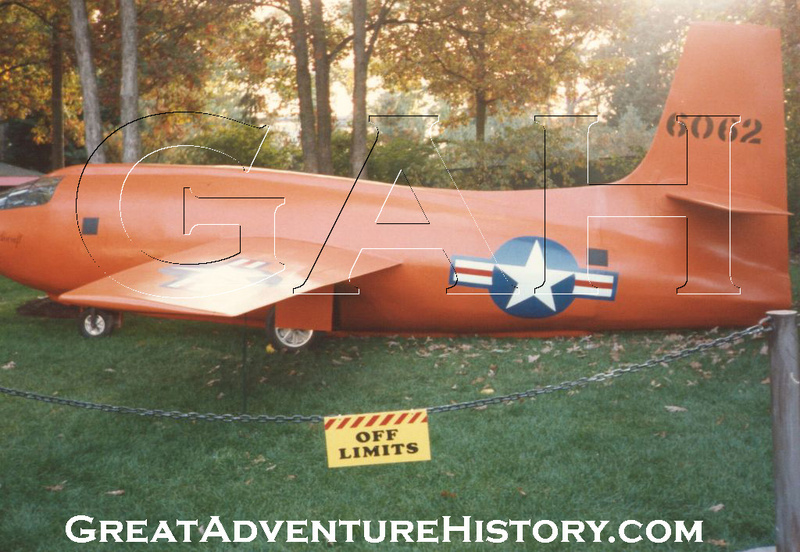 The replica Bell X-1 aircraft became part of the scenery, along with a fuel truck and a tug truck. 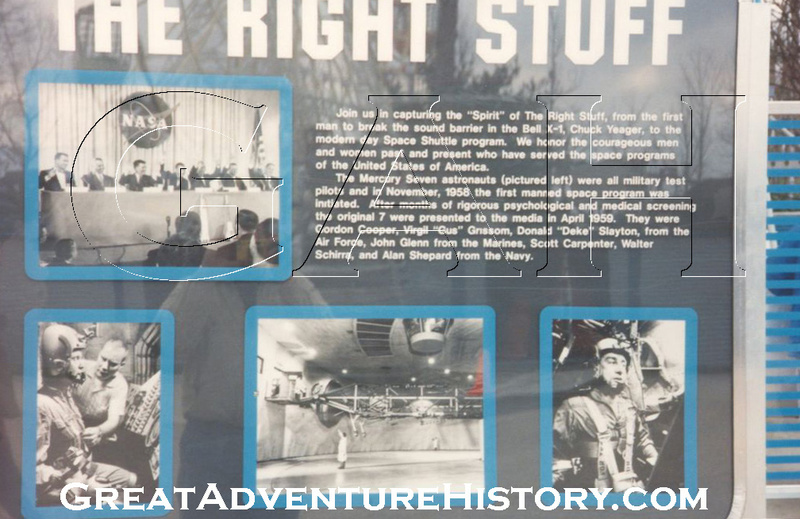 The Right Stuff guests exited through the Flight Deck gift shop, which featured military and aviation themed souvenirs and gifts including things like $300 bomber jackets. 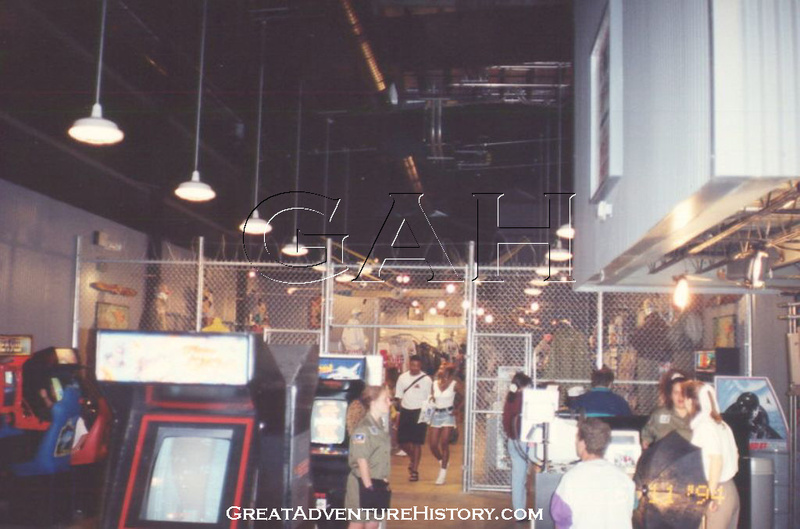 The gift shop also had an arcade area with video games. 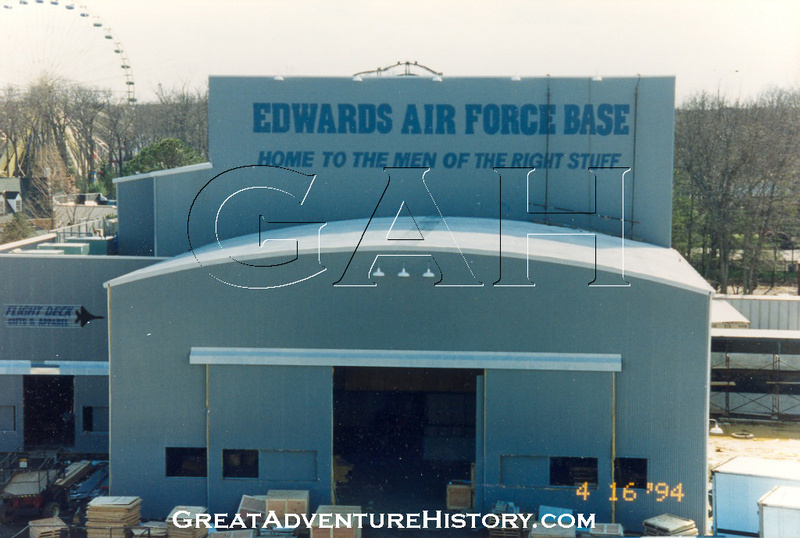 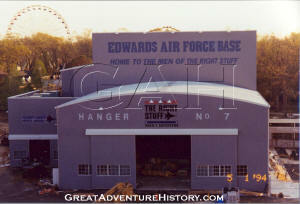 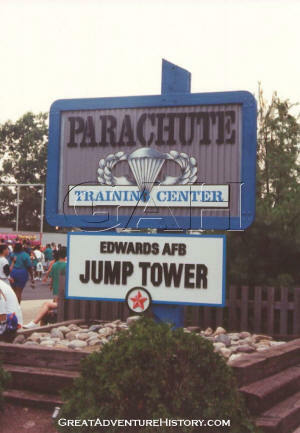 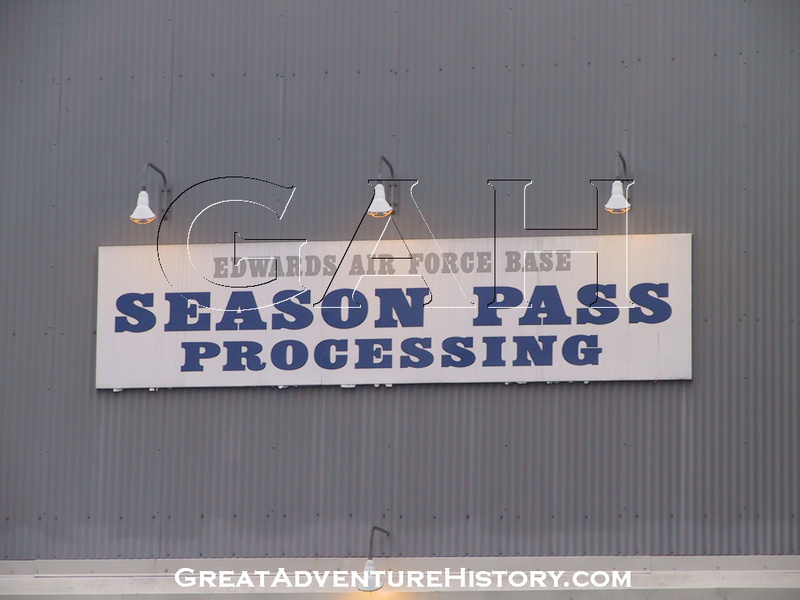 Another ride which was renamed and re-themed as part of the makeover of the area was the Parachuter's Perch, which became known as the Edwards AFB Jump Tower. 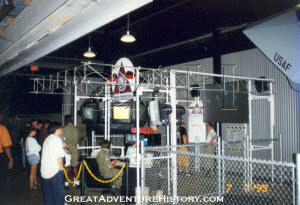 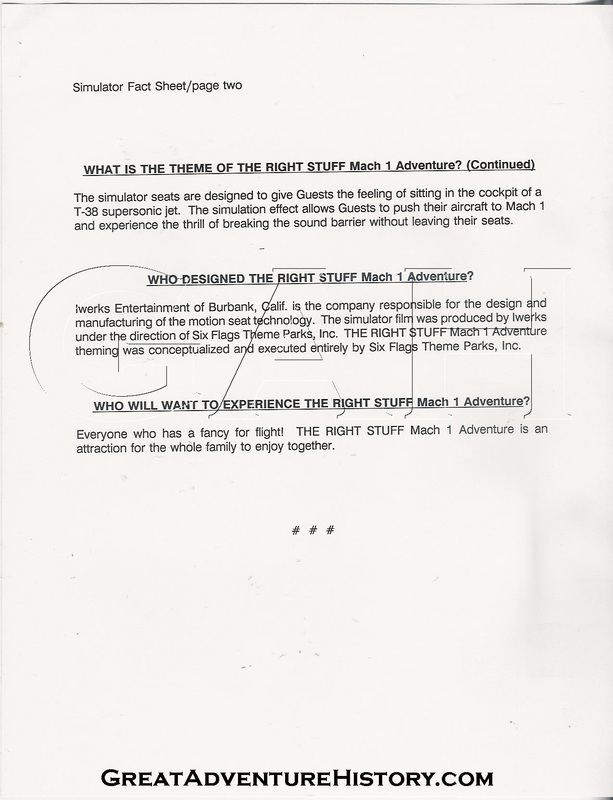 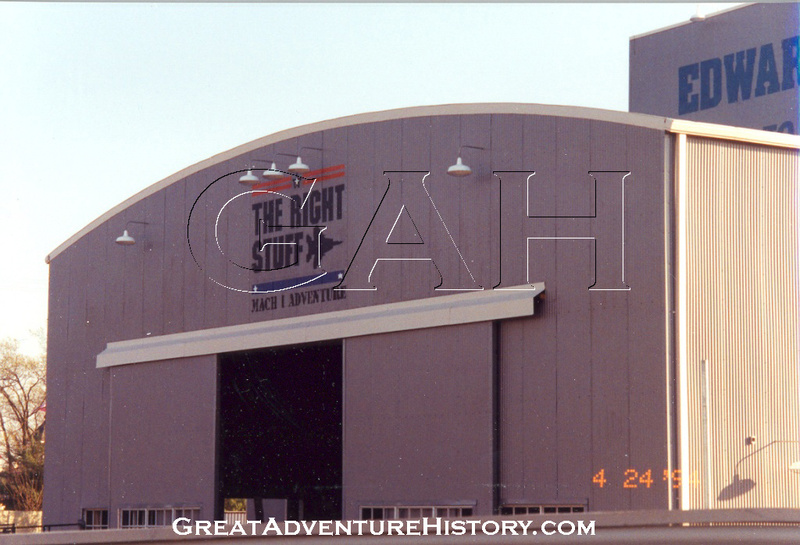 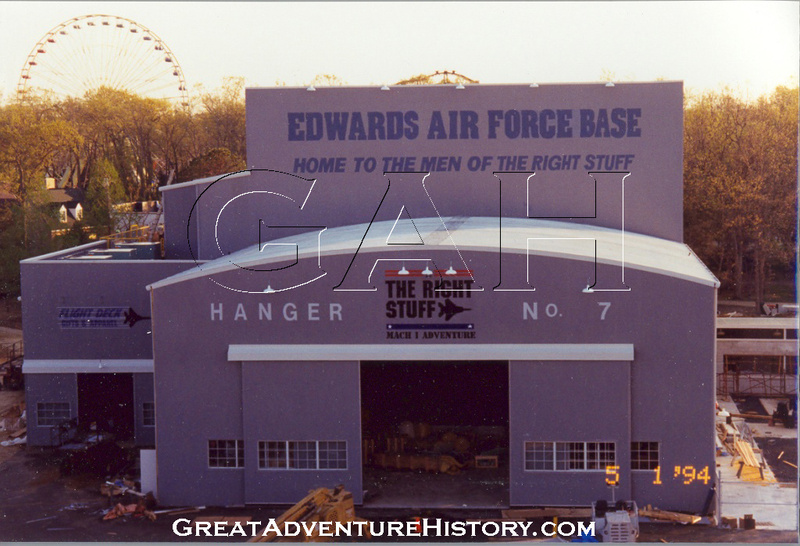 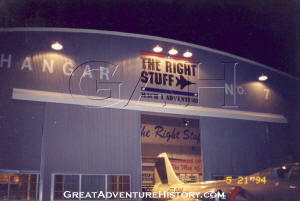 For the second season of the Right Stuff's existence, the arcade area was reconfigured with two flight simulators available as upcharge attractions. 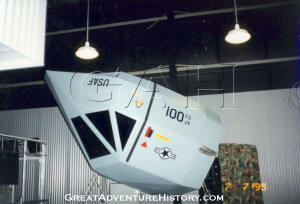 The simulators were standard simulators found at malls and arcades around the country, with jet style nose cones on them and camouflage coverings on the supports. The theater building was constructed with the idea of being able to change the attraction just by changing the film. 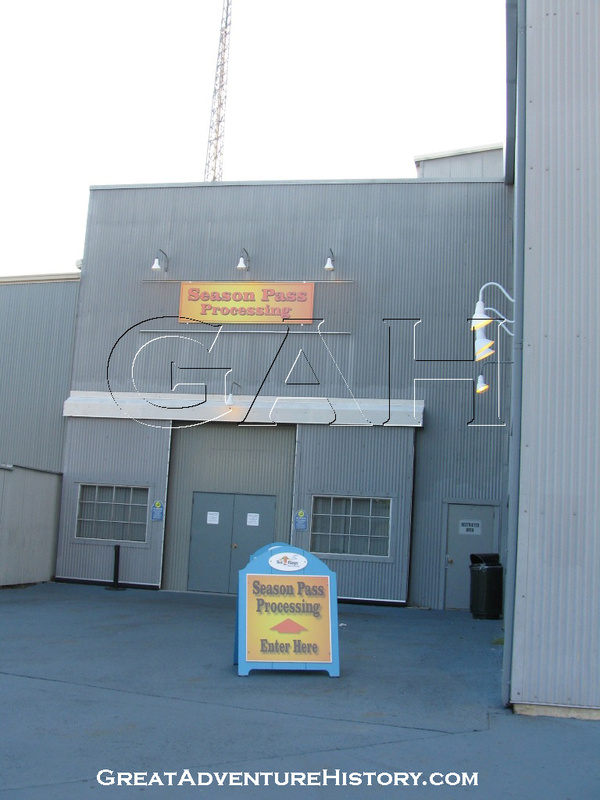 For the 1996 through 1998 seasons as part of the park's Fright Fest celebration, a special film was brought in for the month of October. 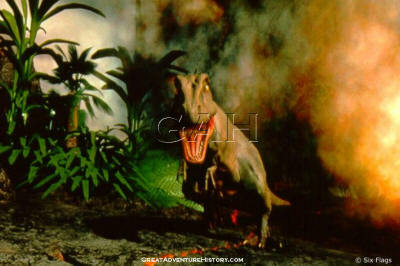 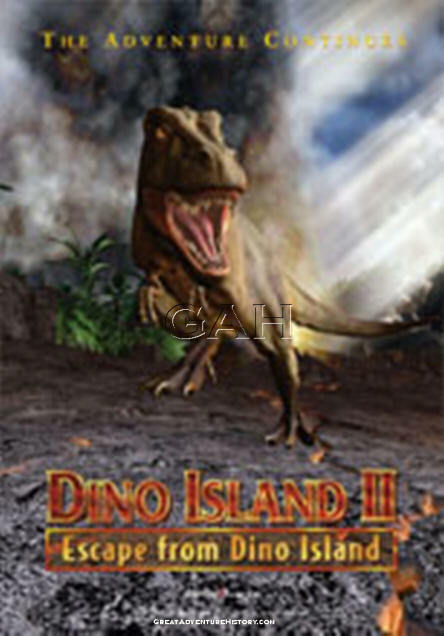 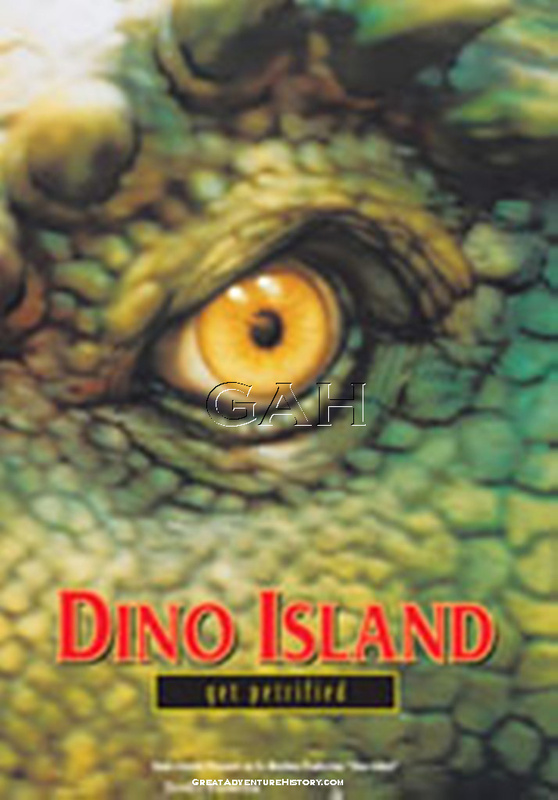 The Dino Island film was also created by Iwerks Entertainment for use on their simulators. 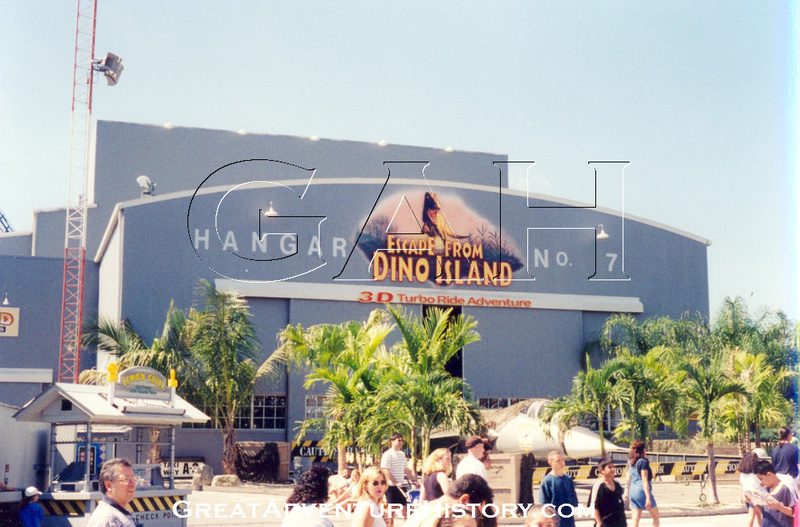 The Bell X-7 plane was removed from it's position at the entrance to the queue, and a large inflatable Tyrannosaurus was put in its place along with several palm trees. The interior of the queue was outfitted with netting and the lighting was set to set the mood for the Jurassic Park style adventure movie. 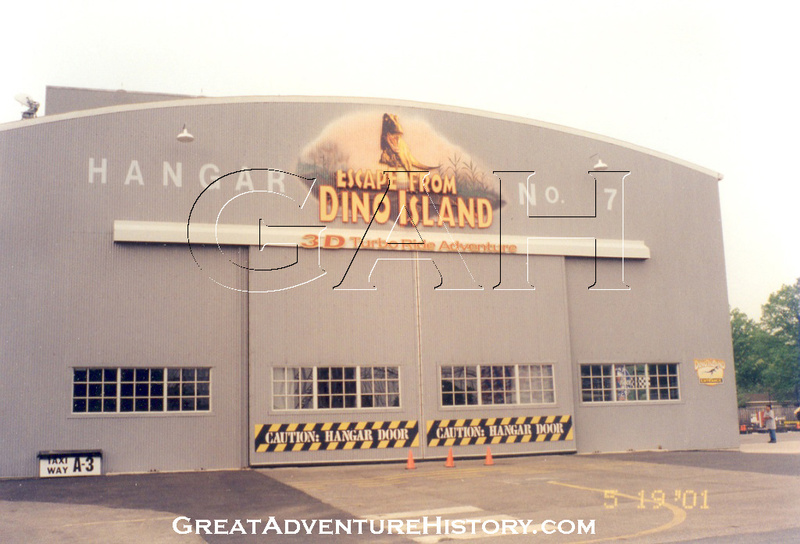 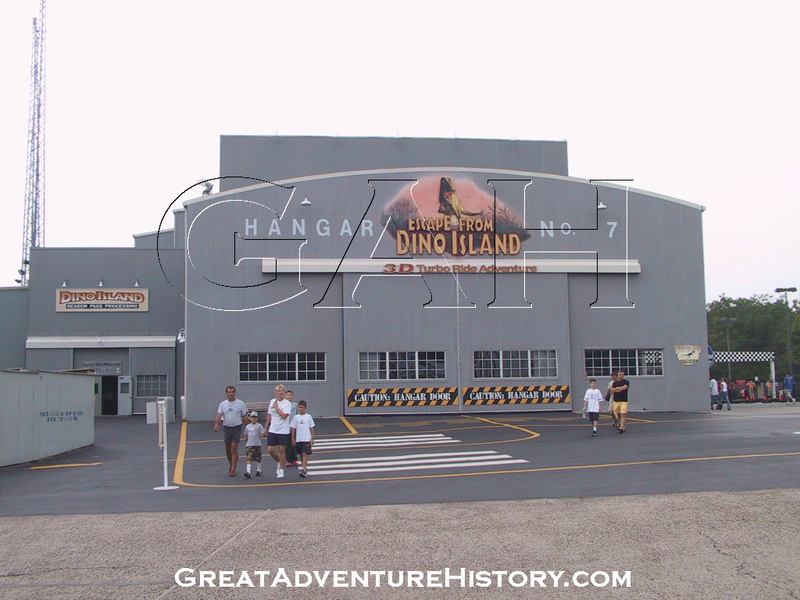 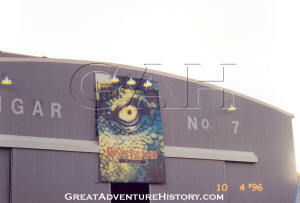 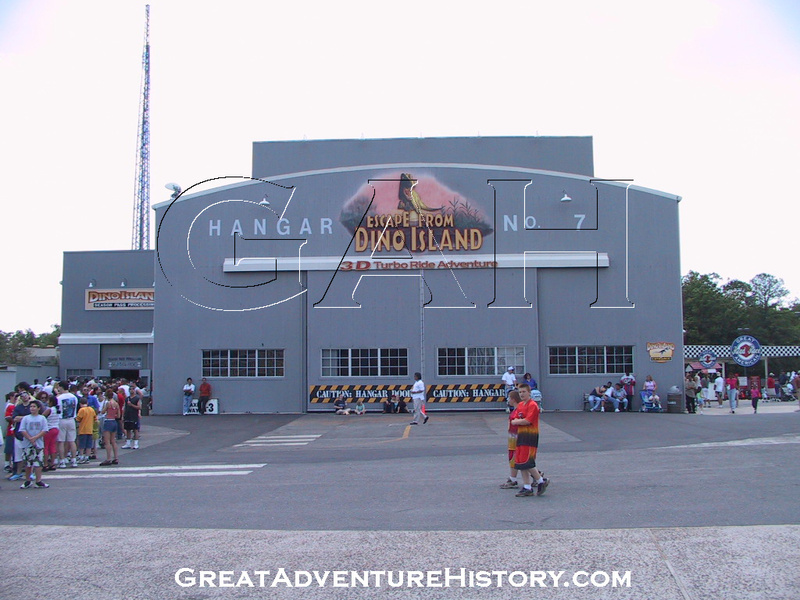 For the run of the movie a Dino Island banner was hung over The Right Stuff logo on the front of the building. 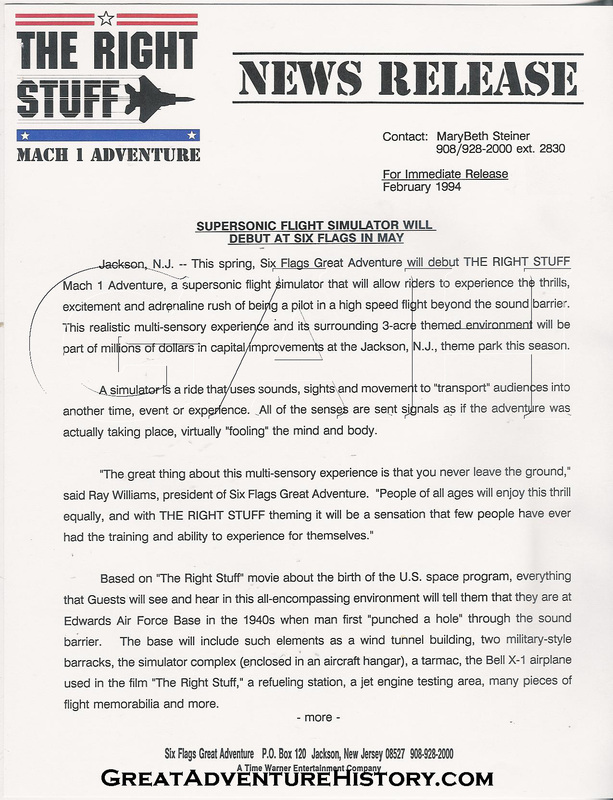 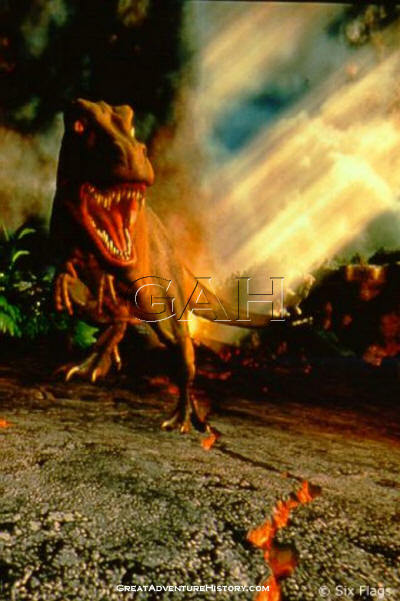 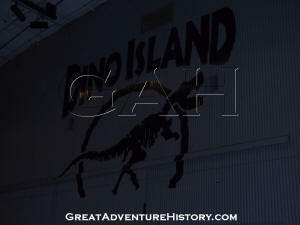 For the 1999 season, The Right Stuff film was replaced with Escape From Dino Island for the regular season. 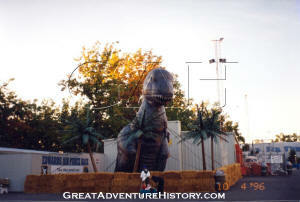 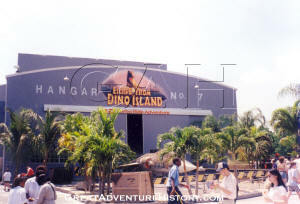 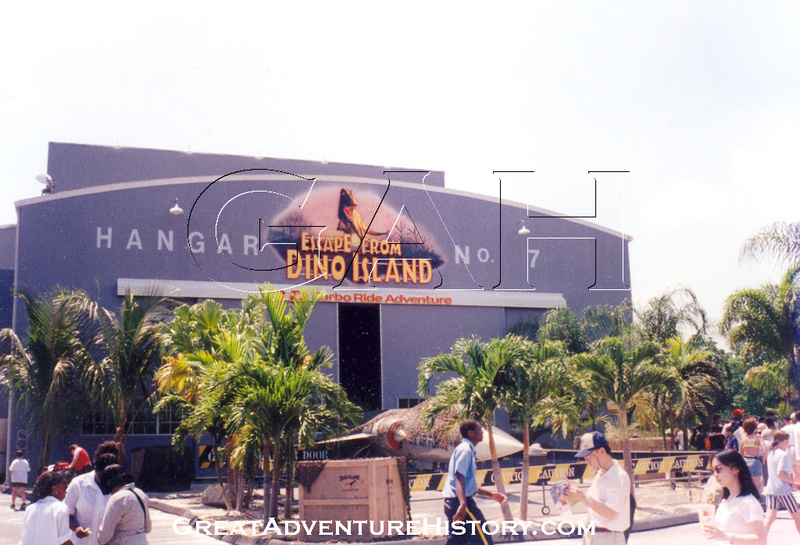 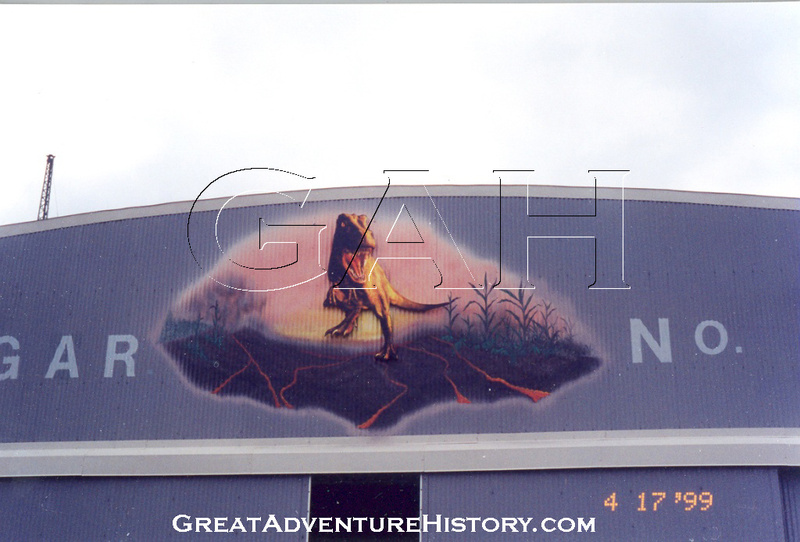 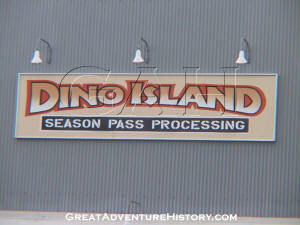 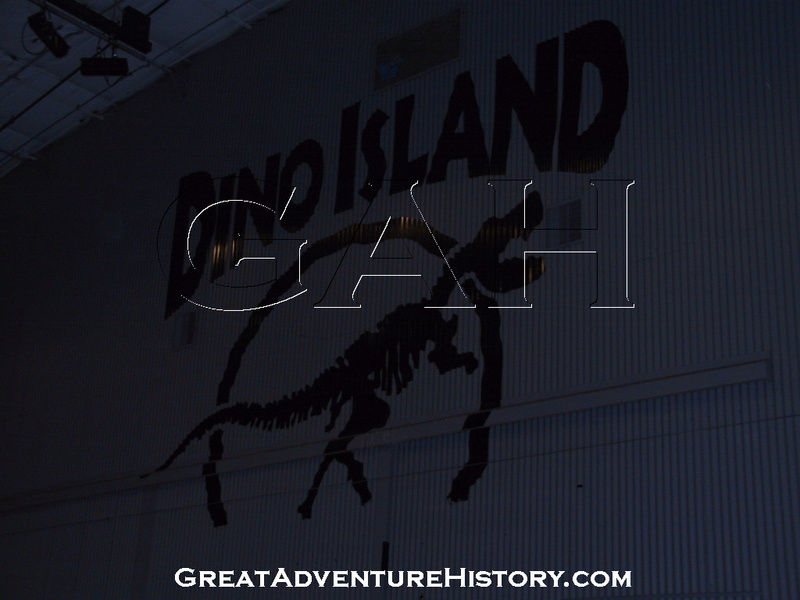 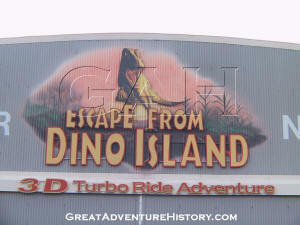 The buildings logos and signs were painted over, and an elaborate dinosaur logo sign was added to the front. 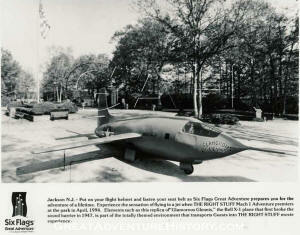 For the first season, the jet plane was left in place and surrounded with palm trees and covered with jute netting. 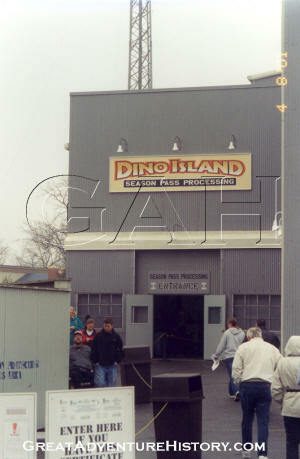 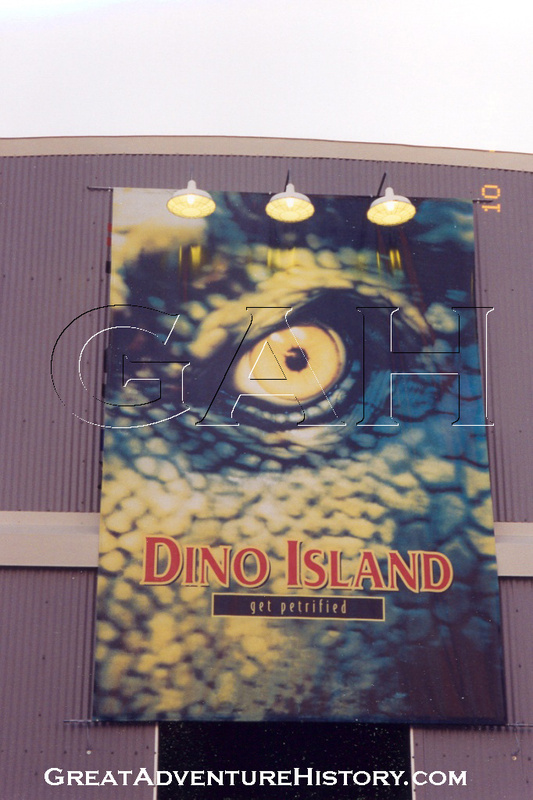 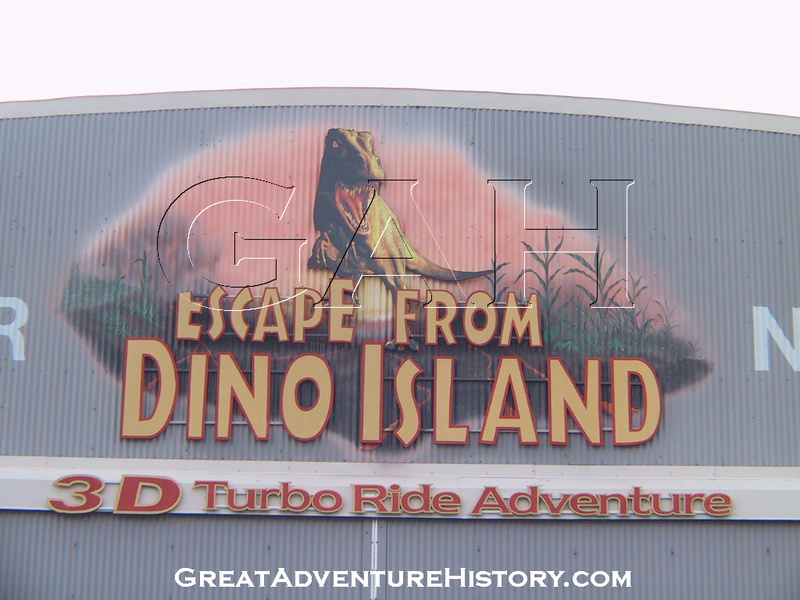 The 1999 through 2002 seasons featured the Escape From Dino Island film during the regular season, with each year seeing more and more of the theme elements being removed from the building. 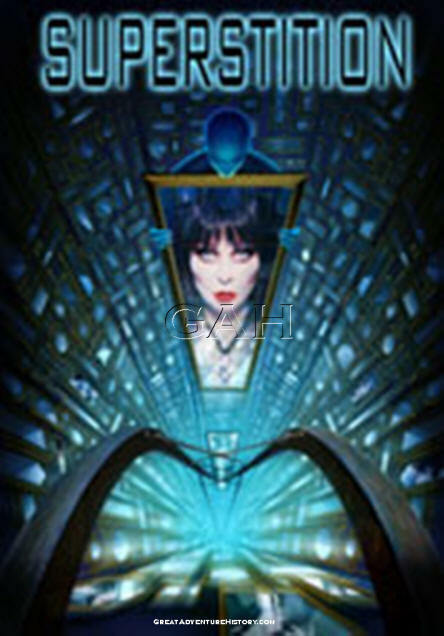 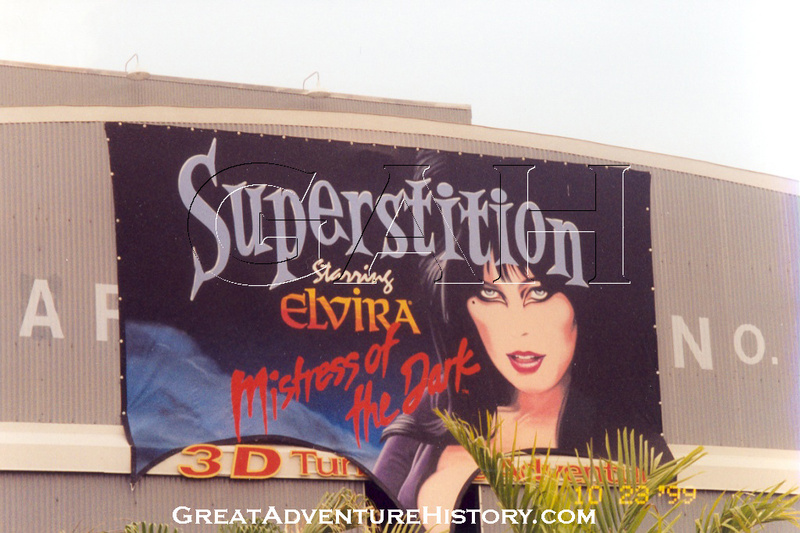 For Fright Fest in 1999, Superstition featuring Elvira made its debut and it returned each year until 2003. 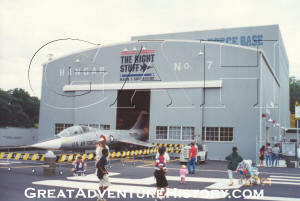 With the plane gone, the area in front of the building became home to a couple of up-charge attractions. 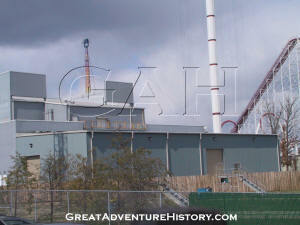 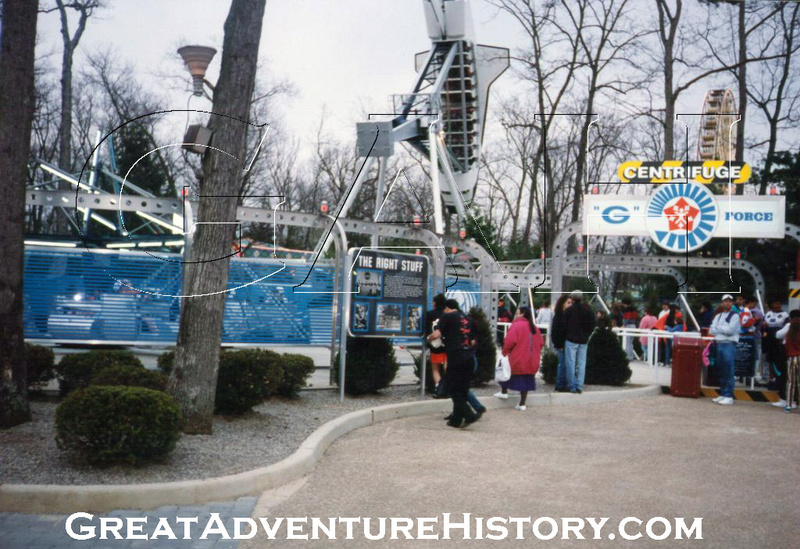 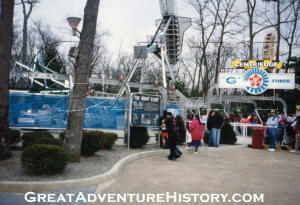 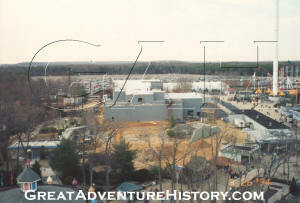 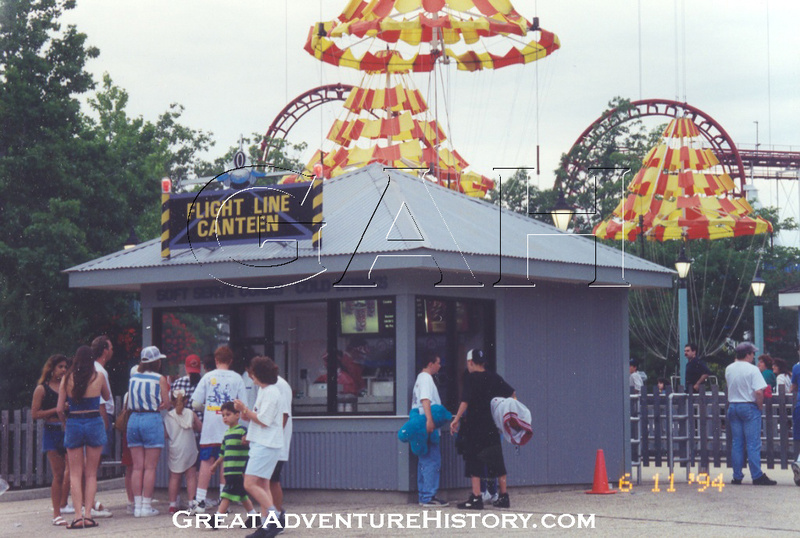 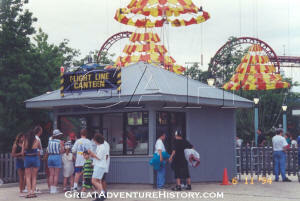 First was a portable Slingshot ride in 2002, and in 2003 the ErUPtion ride was added as a more permanent attraction. 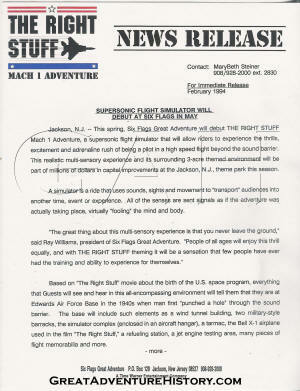 For the 2003 season, The Right Stuff film was brought back to the theatre and played through the regular season, with Superstition returning for Fright Fest. 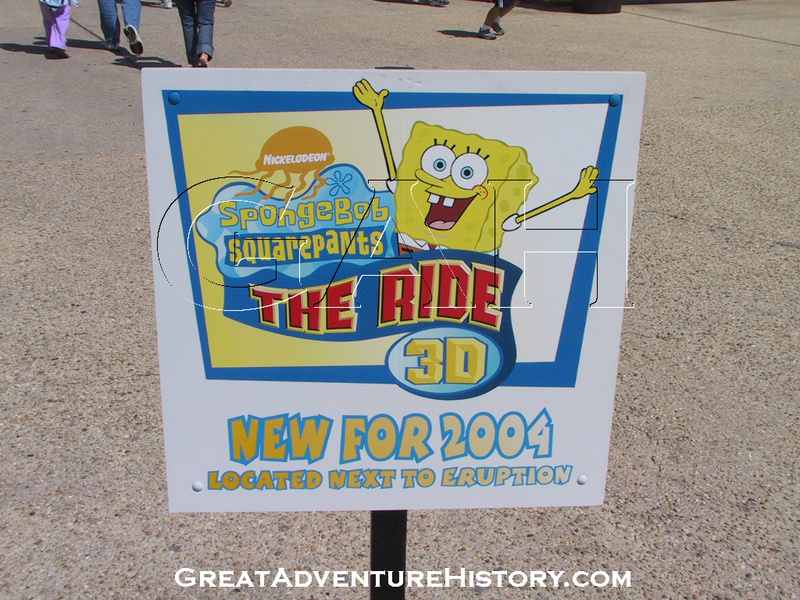 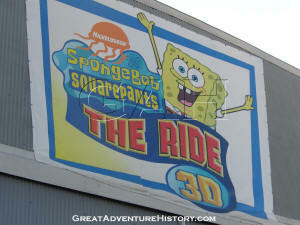 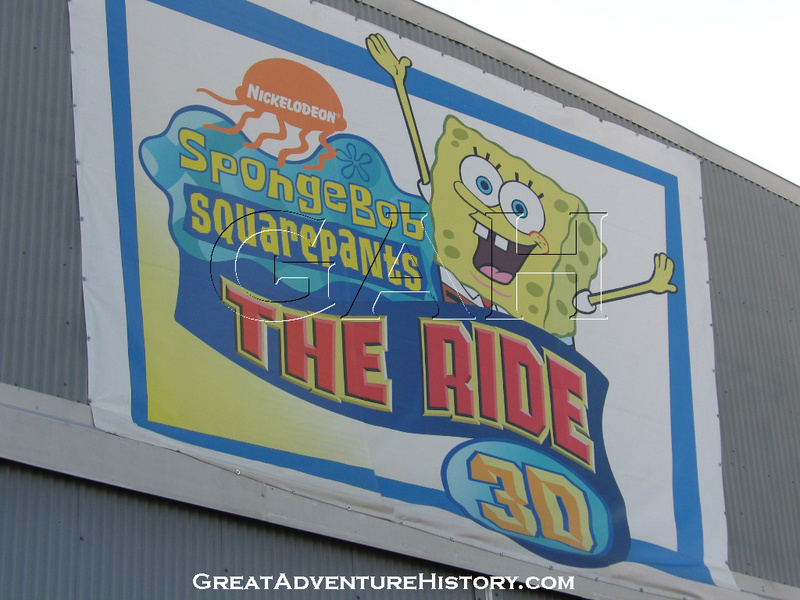 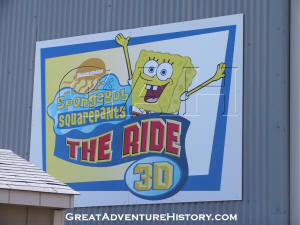 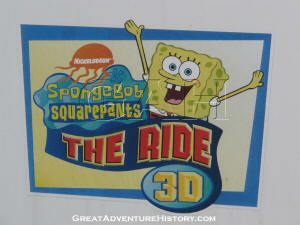 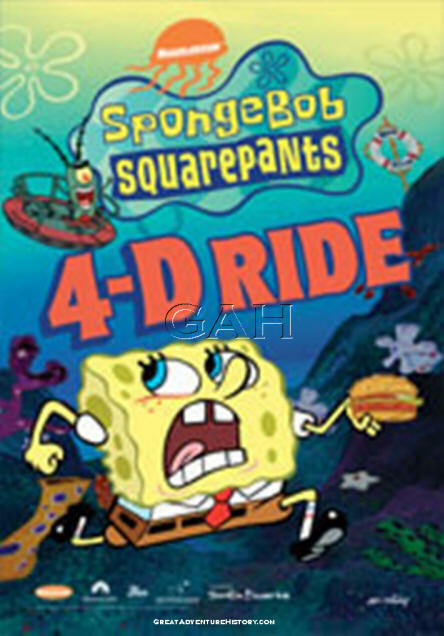 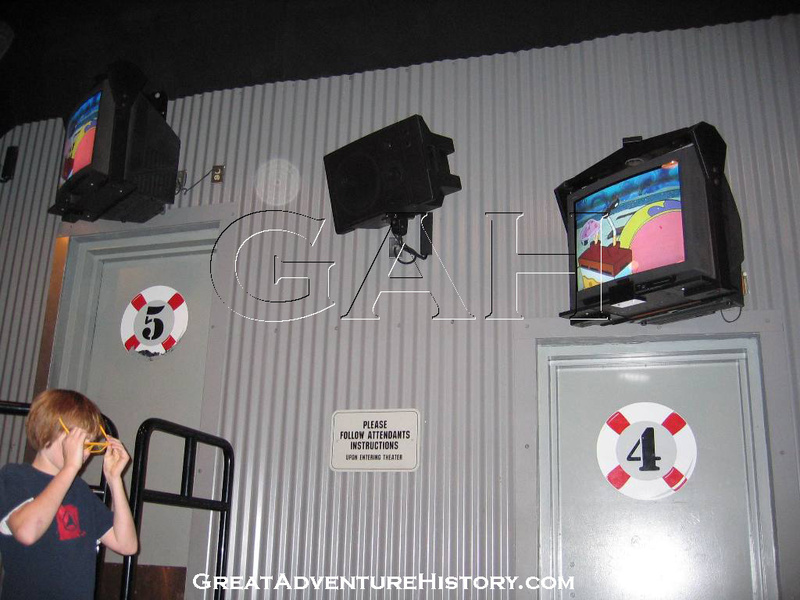 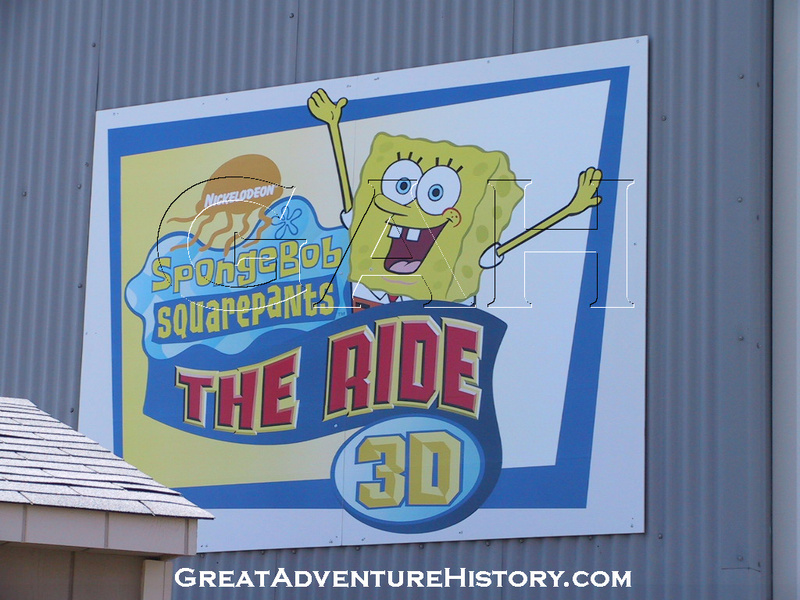 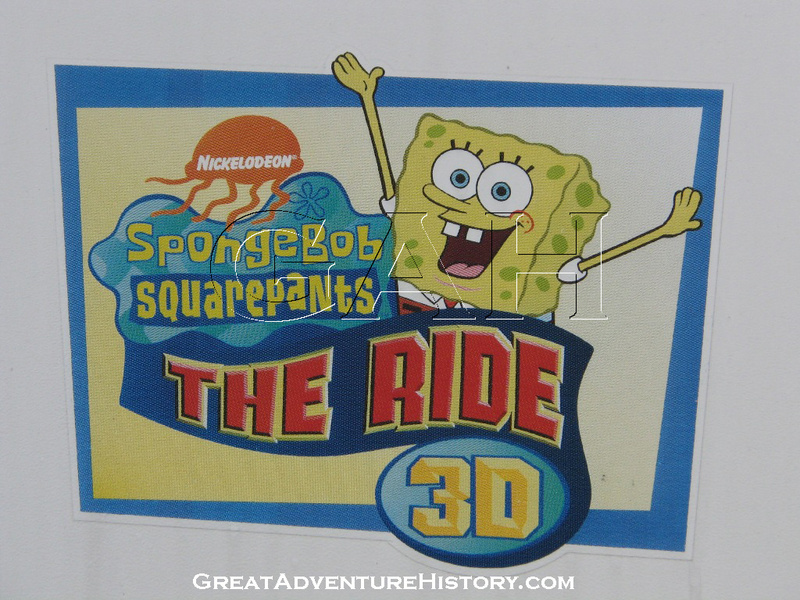 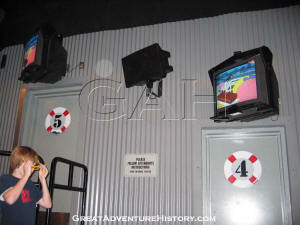 In 2004, Spongebob Squarepants the Ride was brought in. 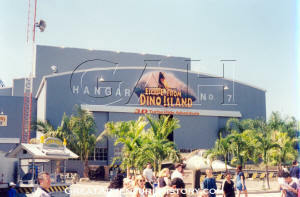 The film which had originally been created for use in the Paramount Parks chain became available in markets that did not compete with Paramount Parks, and Six Flags installed this popular film at several locations around the country. 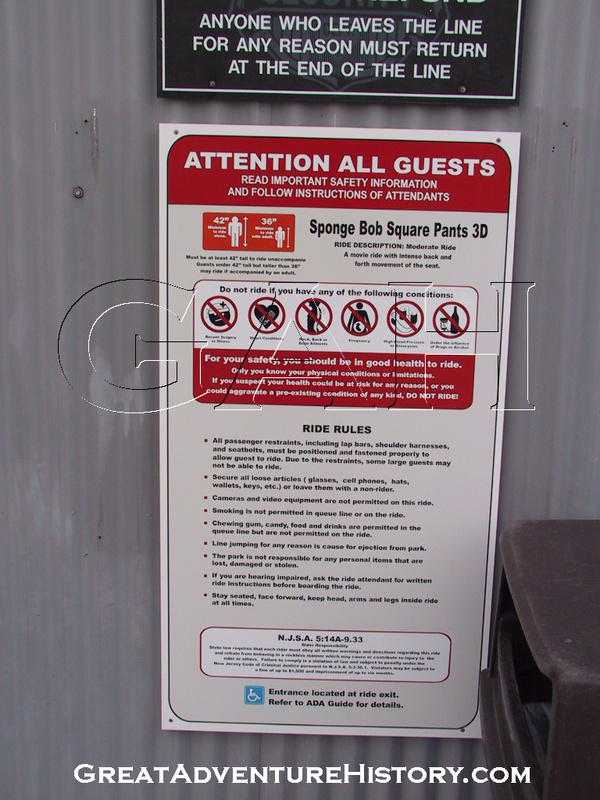 The theme elements and signage added to the theater for the Spongebob film were minimal and had a very temporary look to them. 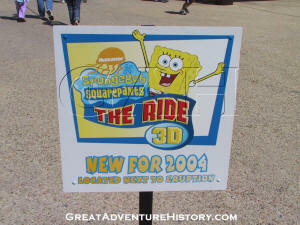 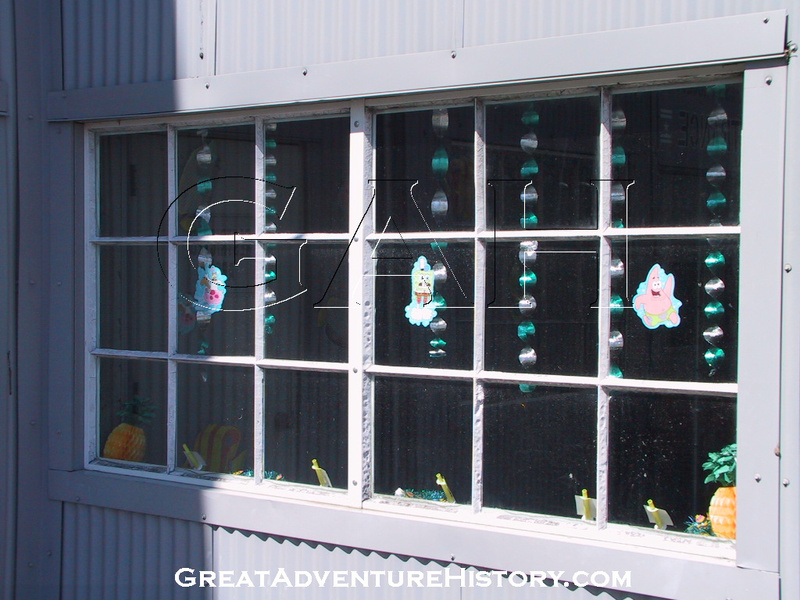 For the 2004 season, Spongebob ran right through Fright Fest as the new attraction, but in the following years, Superstition returned as part of the Fright Fest lineup. 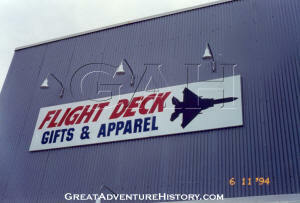 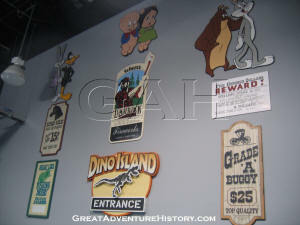 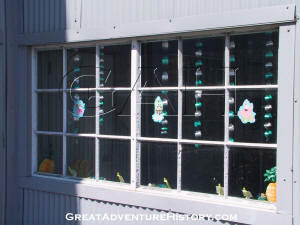 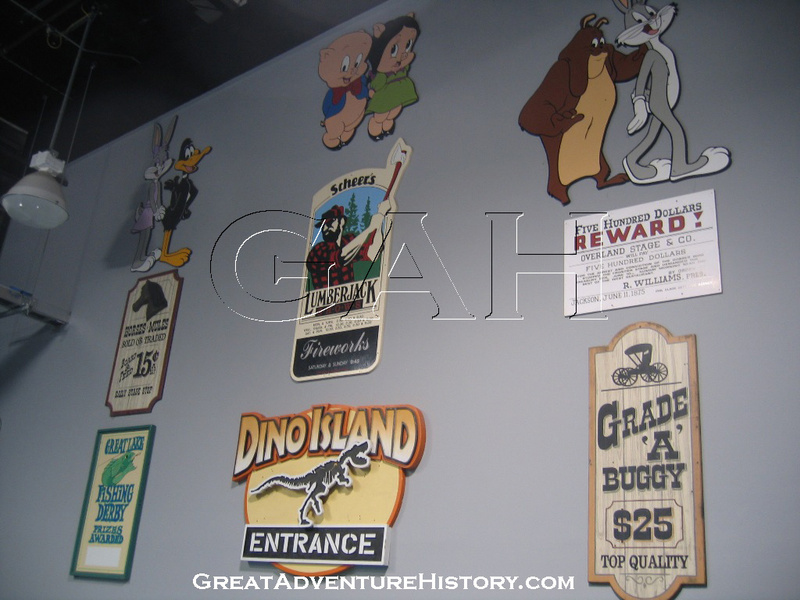 The former Flight Deck gift shop has served as the park's Season Pass Processing center for several years now, and the walls inside are adorned with signs which used to adorn buildings and rides throughout the park. 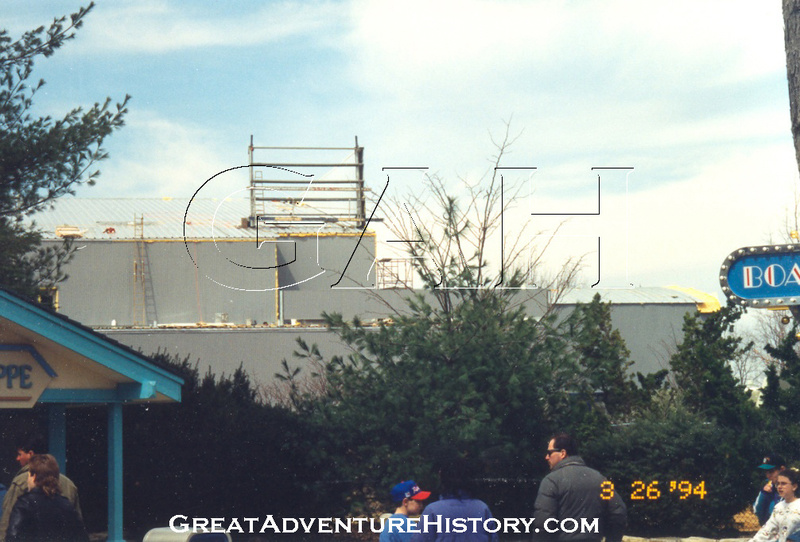 Over the years, the theater building and surrounding area have lost many theme elements as old attractions have been removed and new attractions were added. 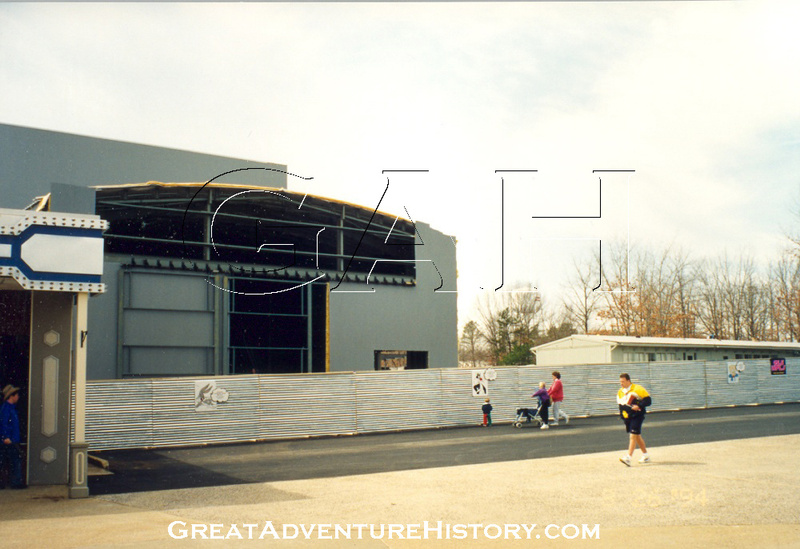 The elaborate lighting and sound systems of the queue area are unused, and is very generic now so it doesn't require modification as the film is changed for the season. Display pieces from the old Flight Deck shop still pop up at random throughout the park's shops and even over in the shops of Hurricane Harbor. 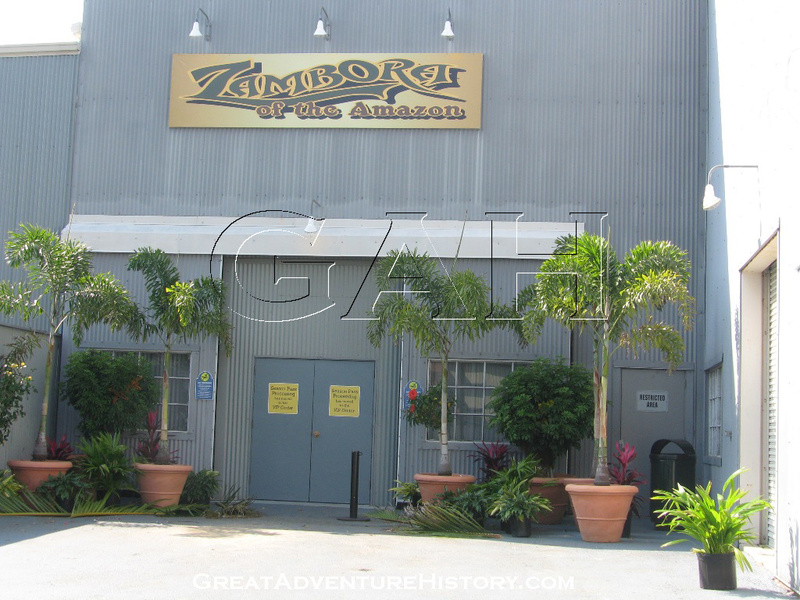 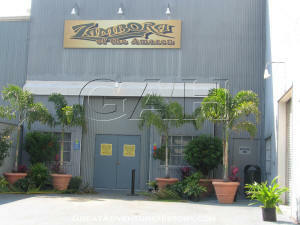 For several seasons of Fright Fest, the former Flight Deck shop, which normally houses Season Pass Processing is transformed into a theater for Zambora of the Amazon. 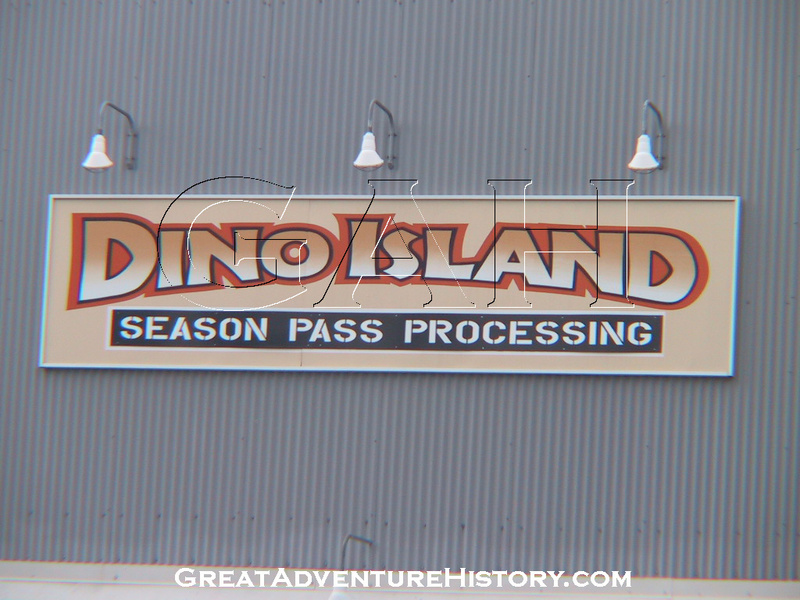 The tropical foliage added to the entrance is reminiscent of the theme elements added for the seasons of Dino Island. The ride once exited through the gift shop and out the front, but guests now exit out the back of the building through what was once part of the backstage areas. 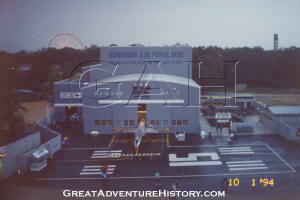 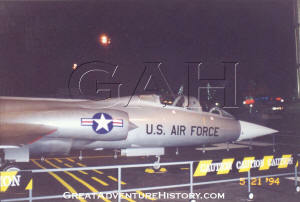 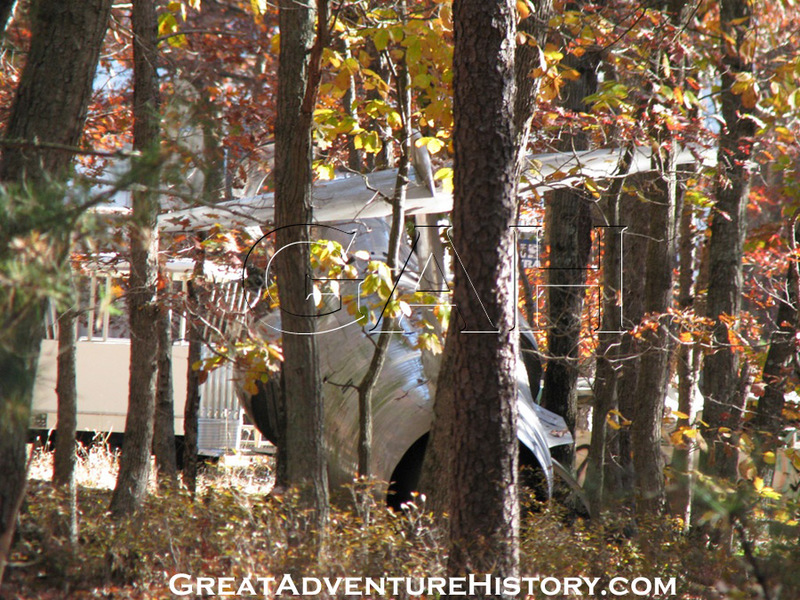 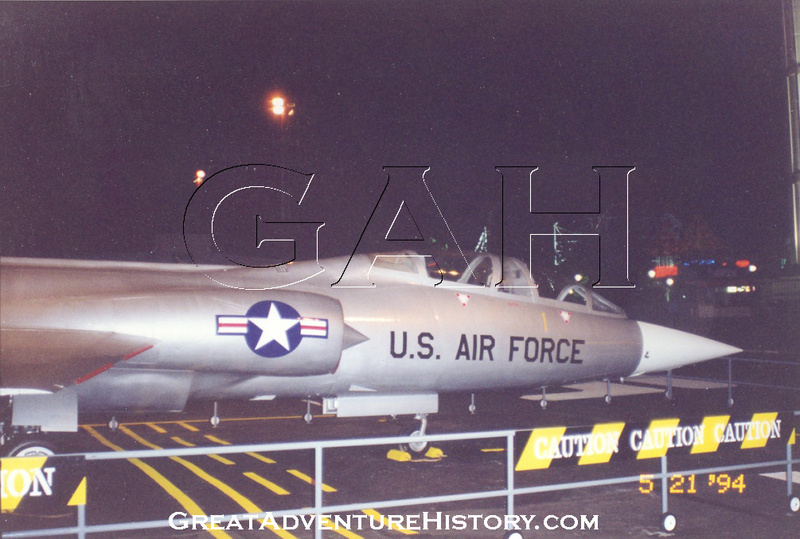 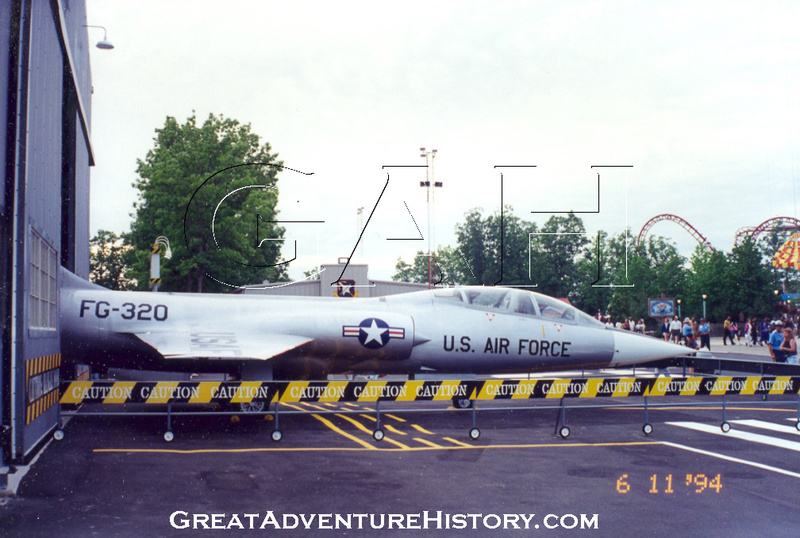 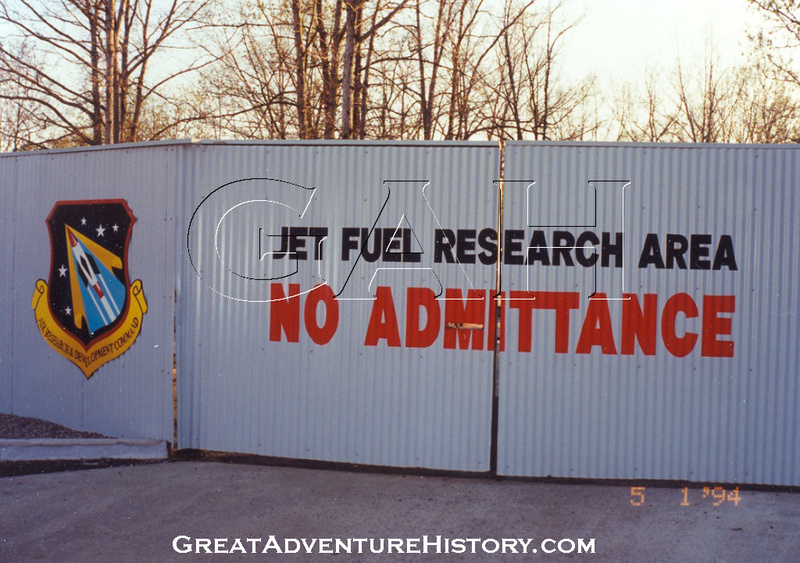 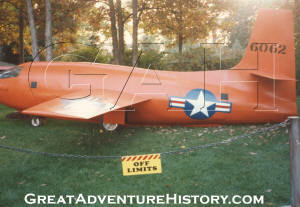 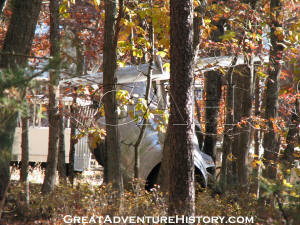 The F-104 jet which once sat outside the hangar doors served as a Fright Fest prop for the hayride for several seasons, and now resides in the park's boneyard, and is visible from Route 537. 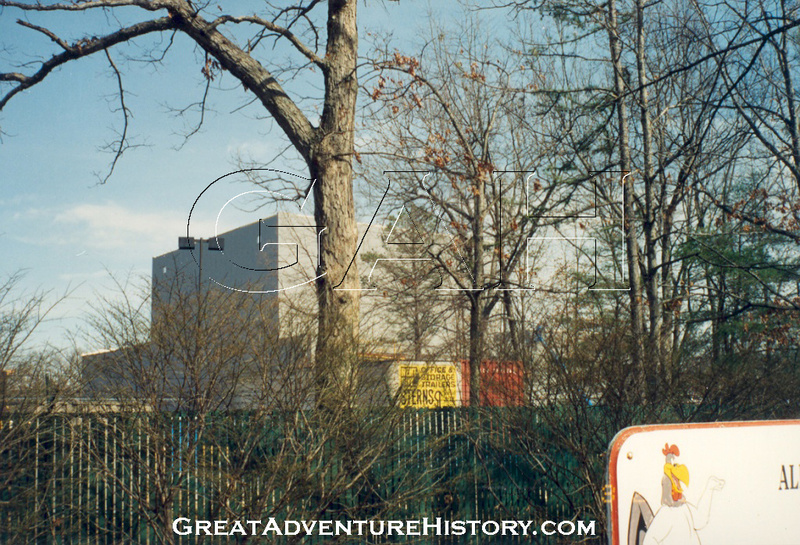 The tanker truck which had been part of the theme elements also found a new home as part of the hayride and still sits in the woods behind Looney Tunes Seaport. 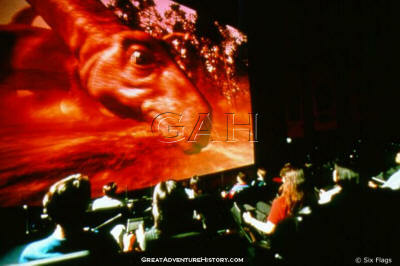 Which film is your favorite? 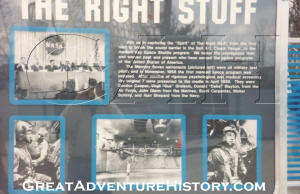 Click here to vote for your choice on the GreatAdventureHistory.com Forums!